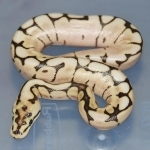 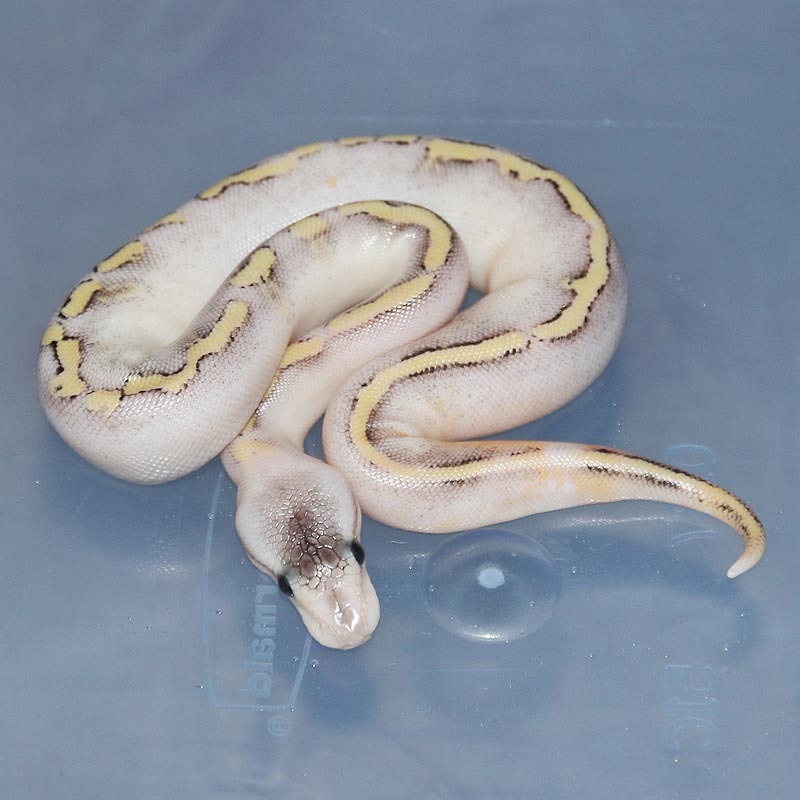 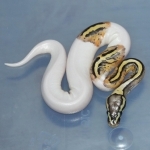 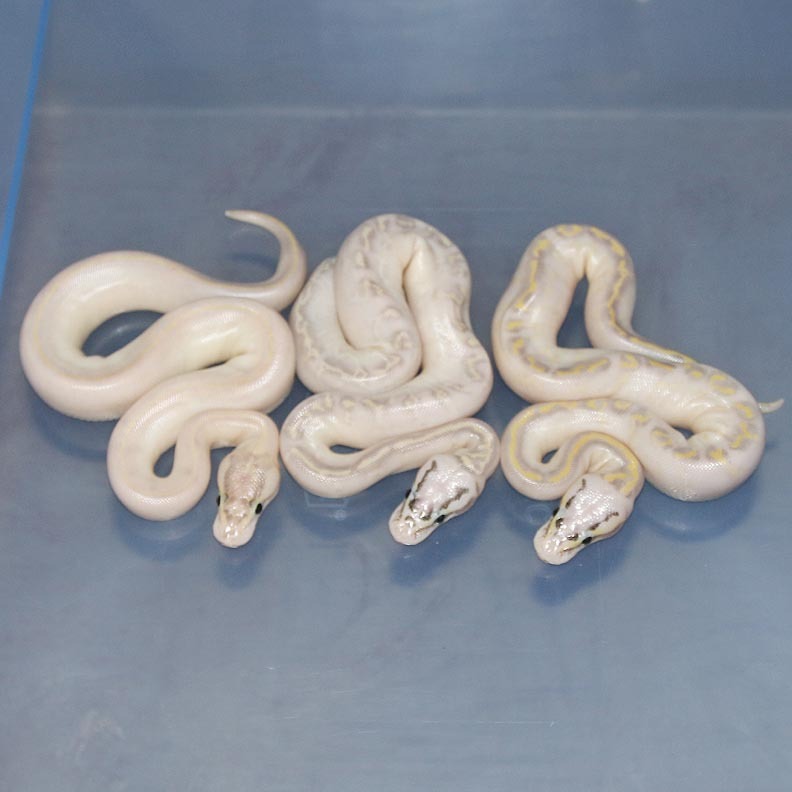 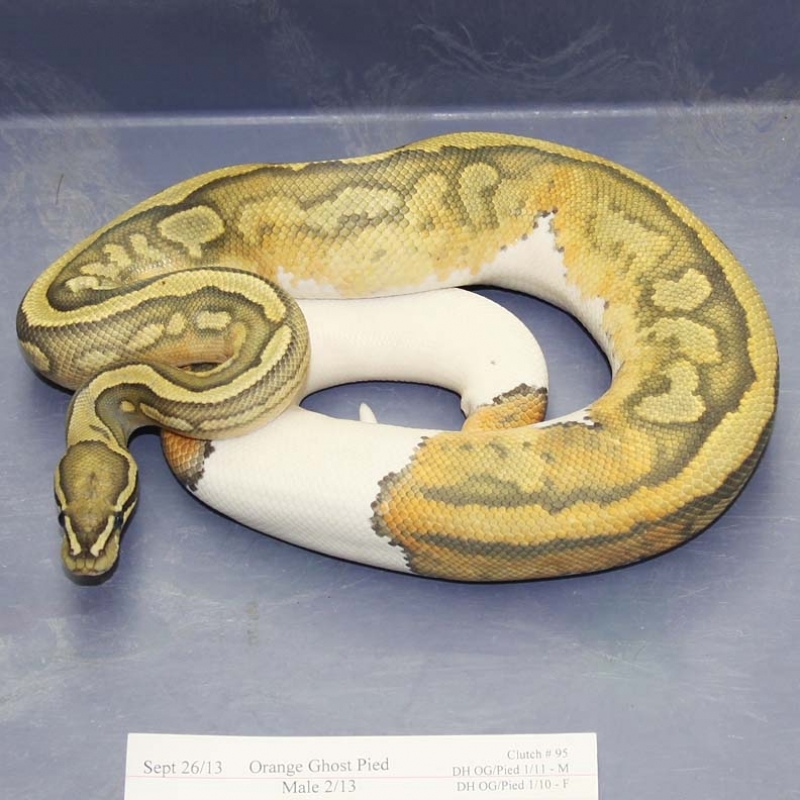 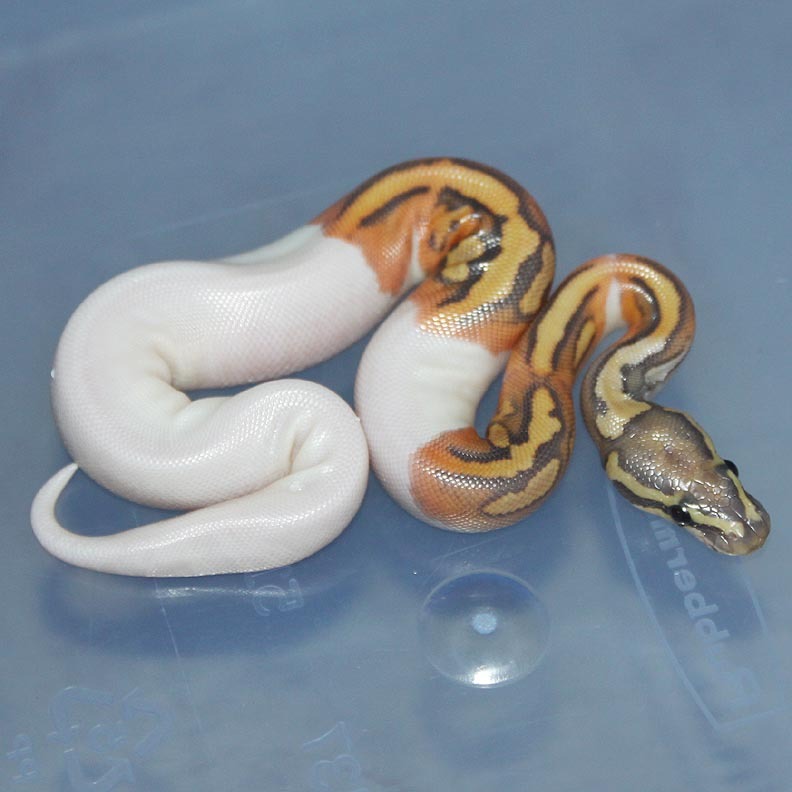 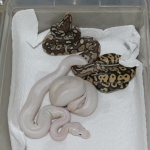 Description: Orange Ghost Pied 2/13 x Pastel DH Orange Ghost/Pied 4/10. 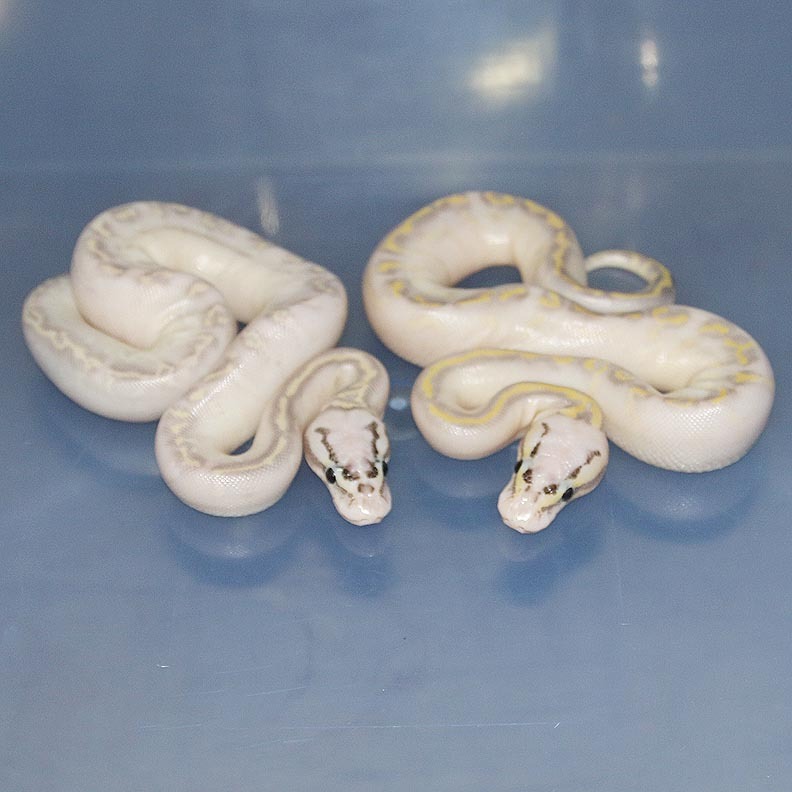 These guys are stunning in person! 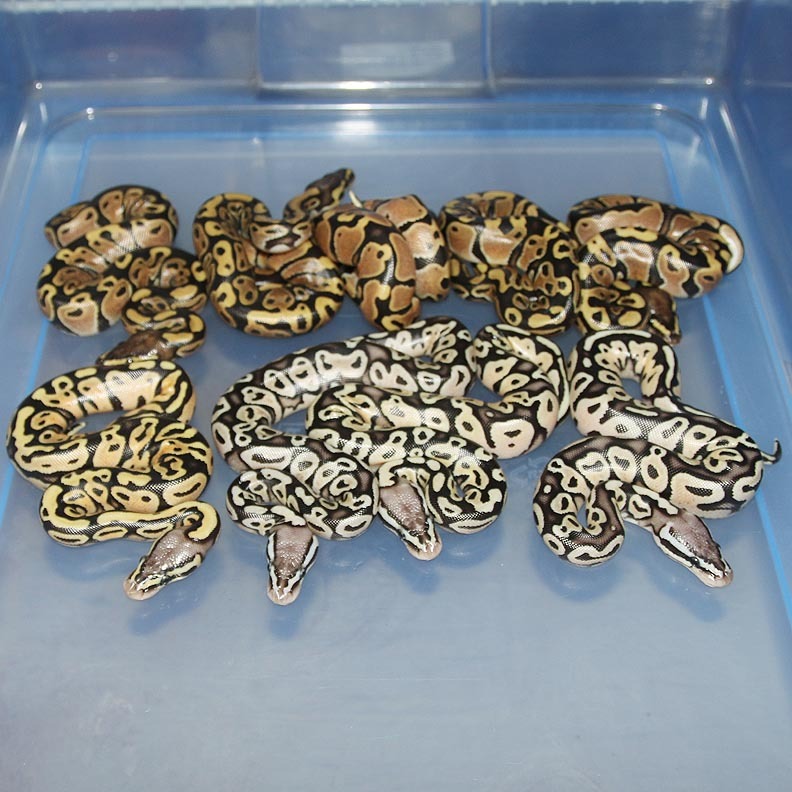 If you are interested in animals from clutch #51 please email or call 519-824-7377. 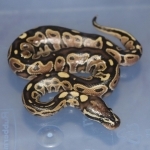 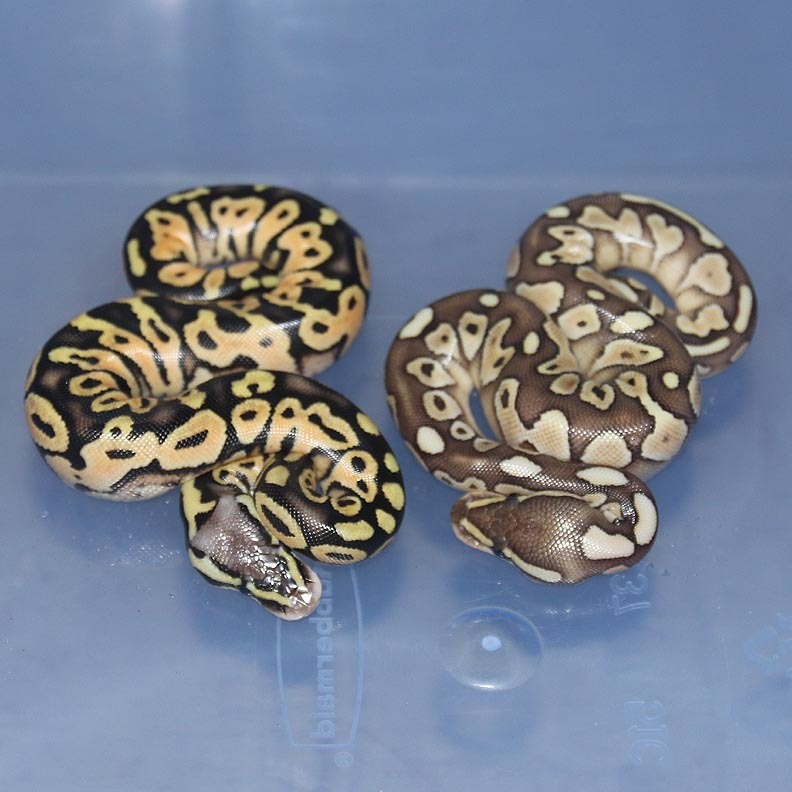 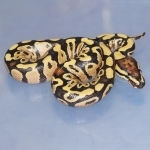 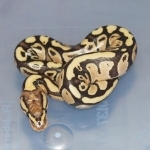 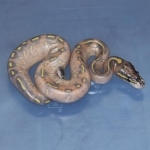 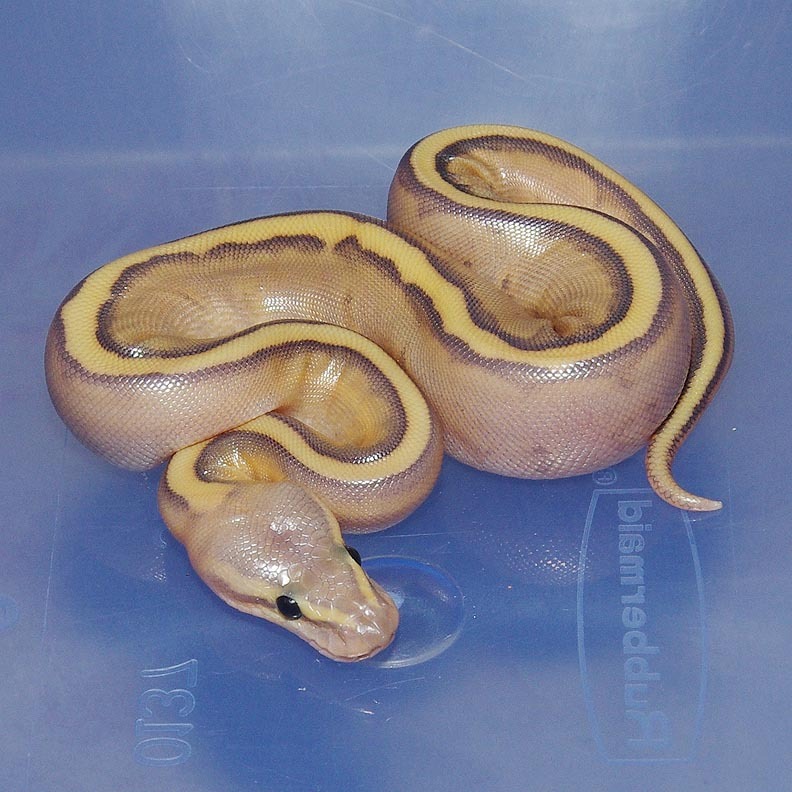 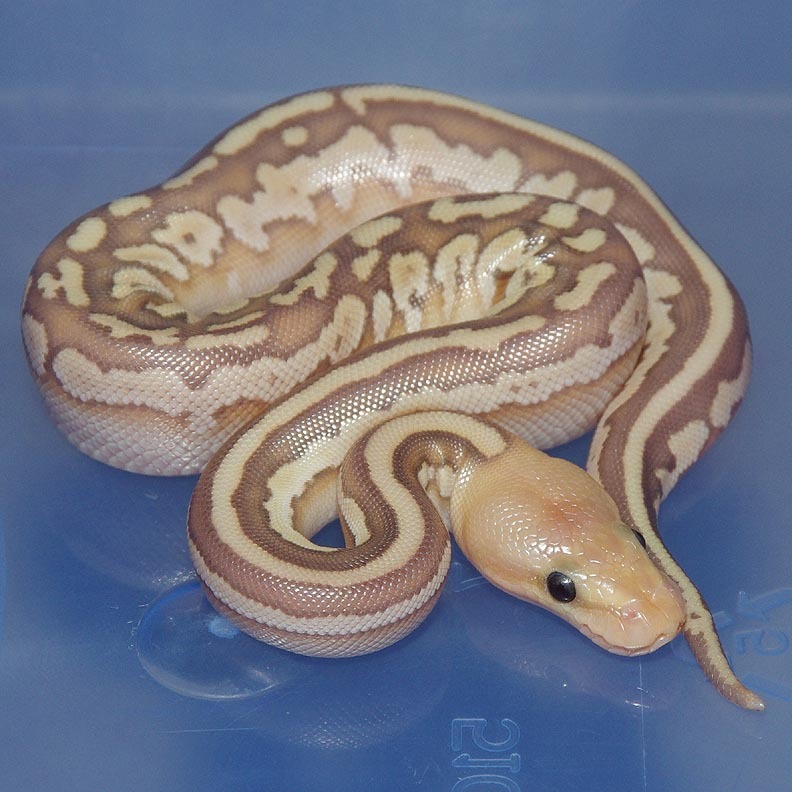 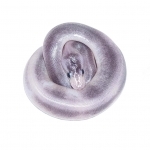 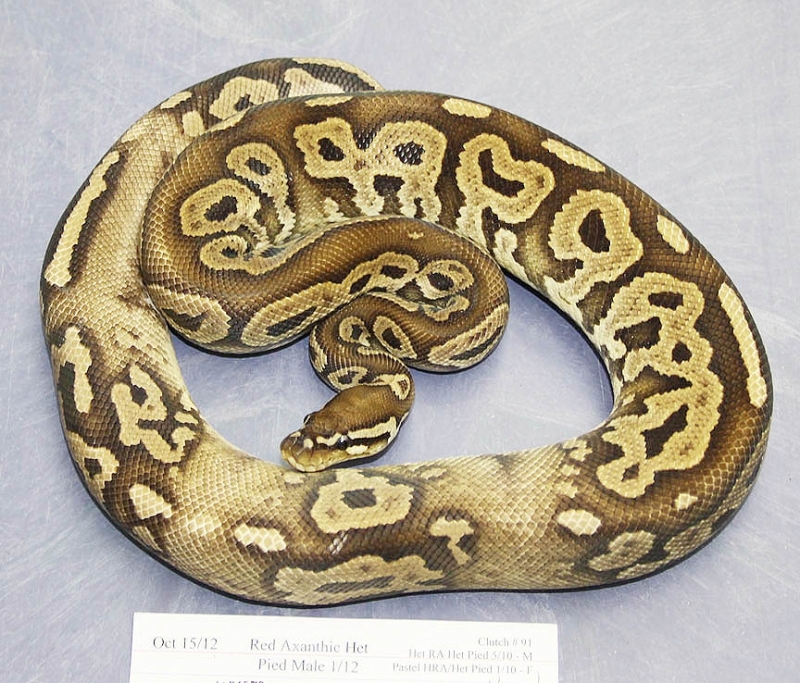 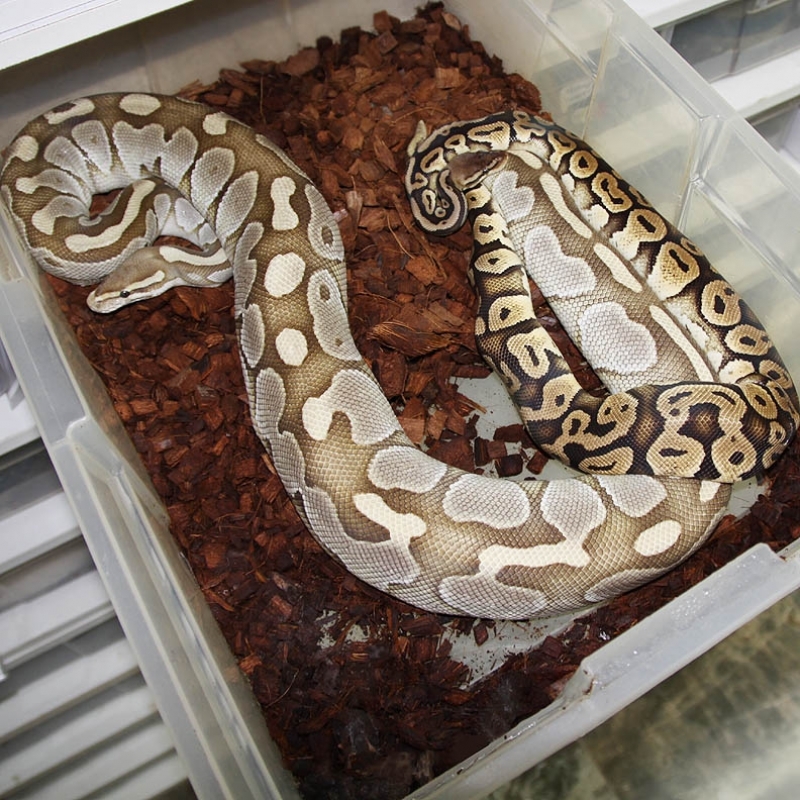 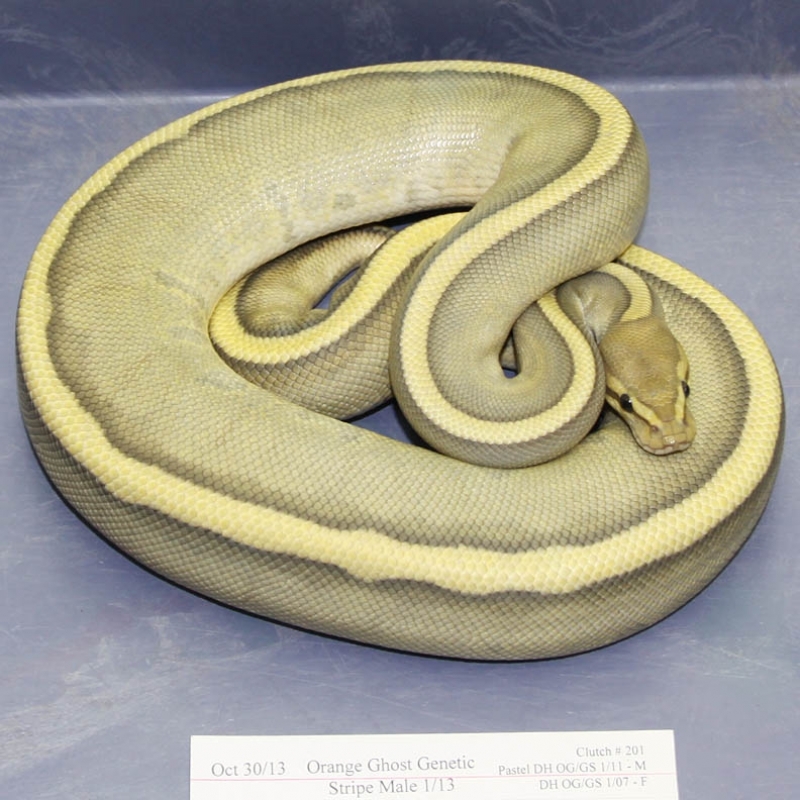 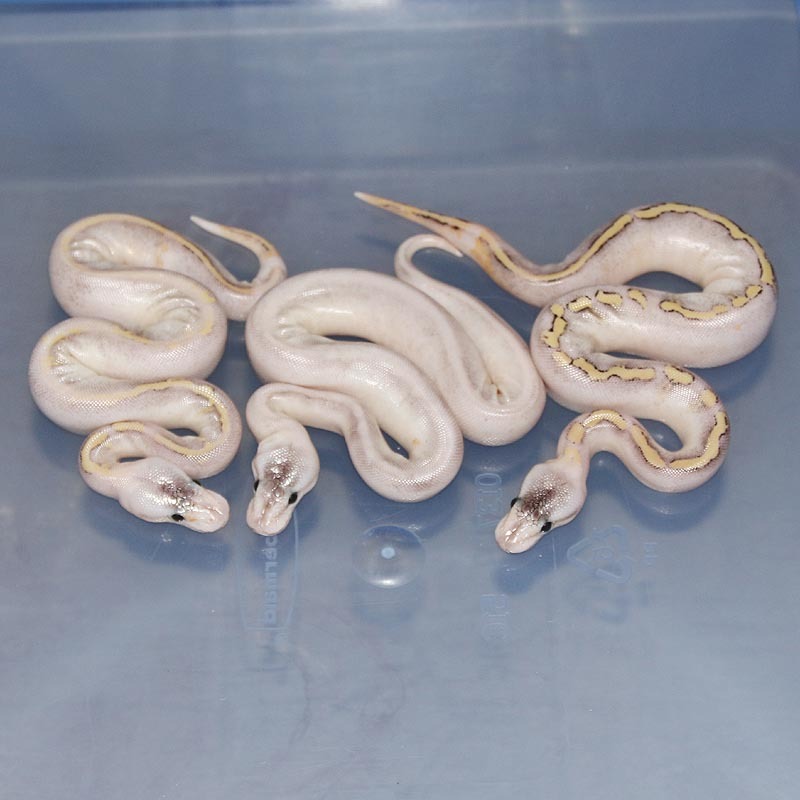 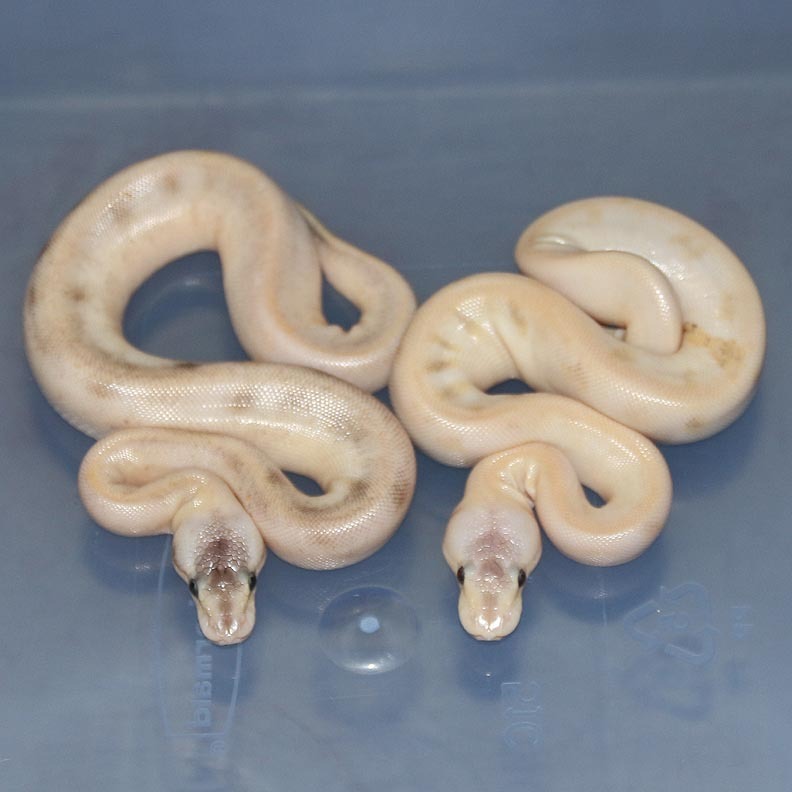 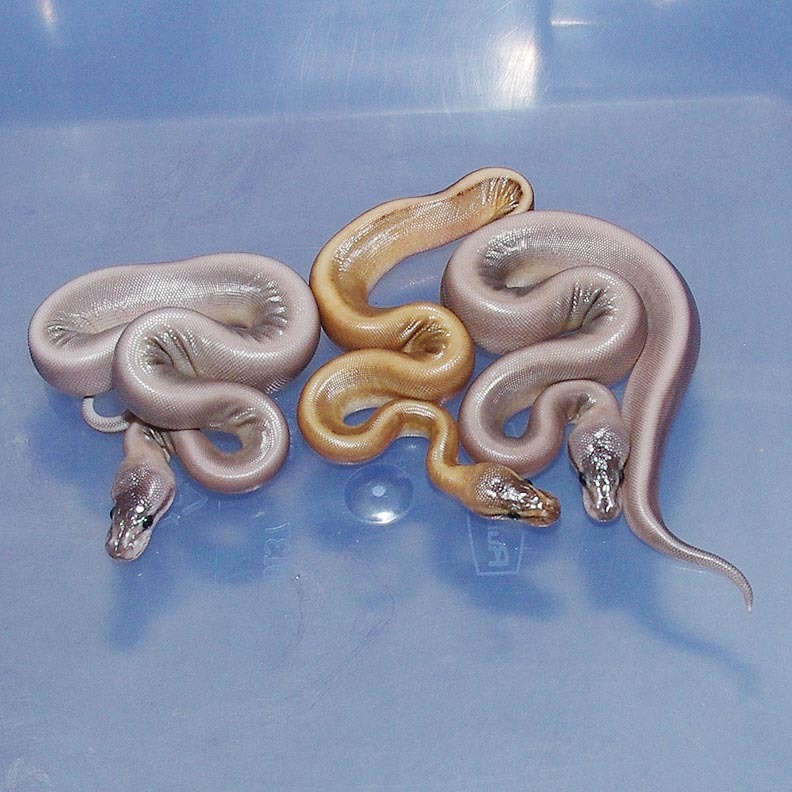 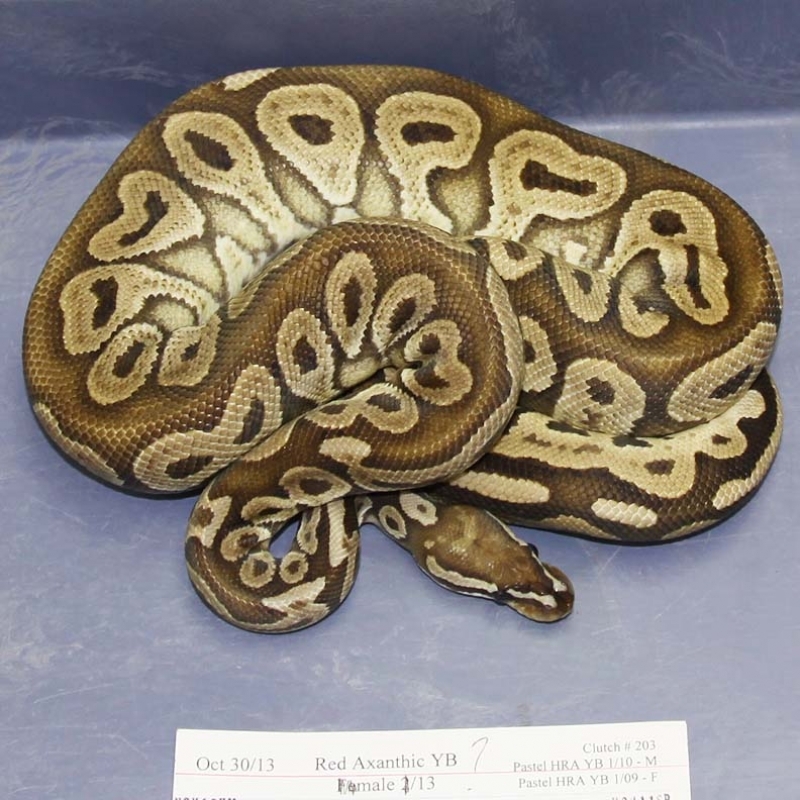 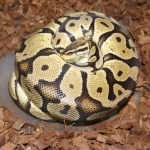 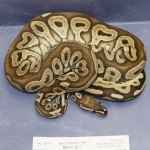 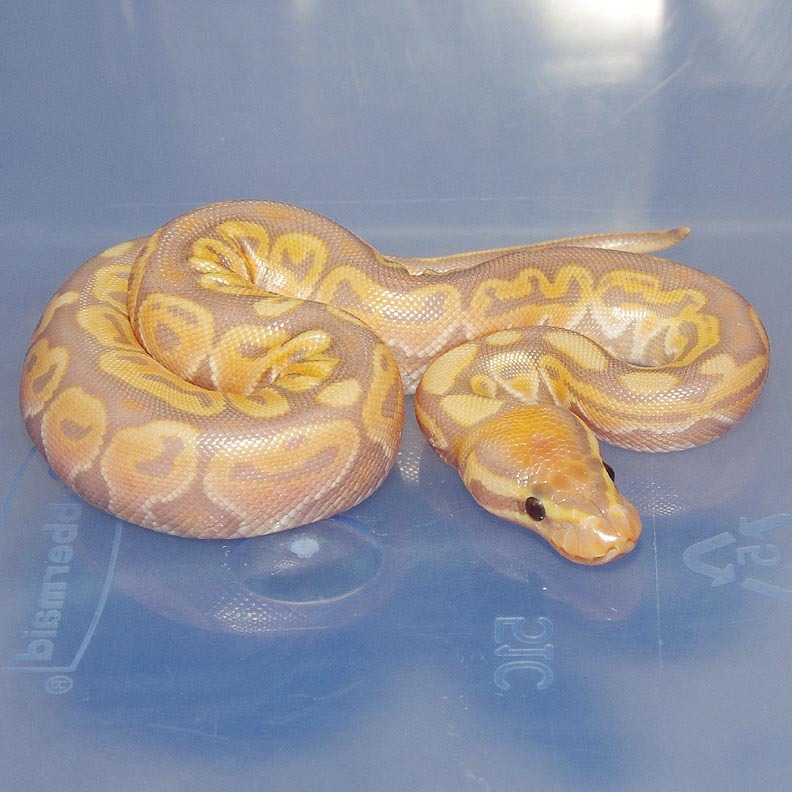 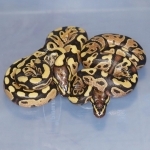 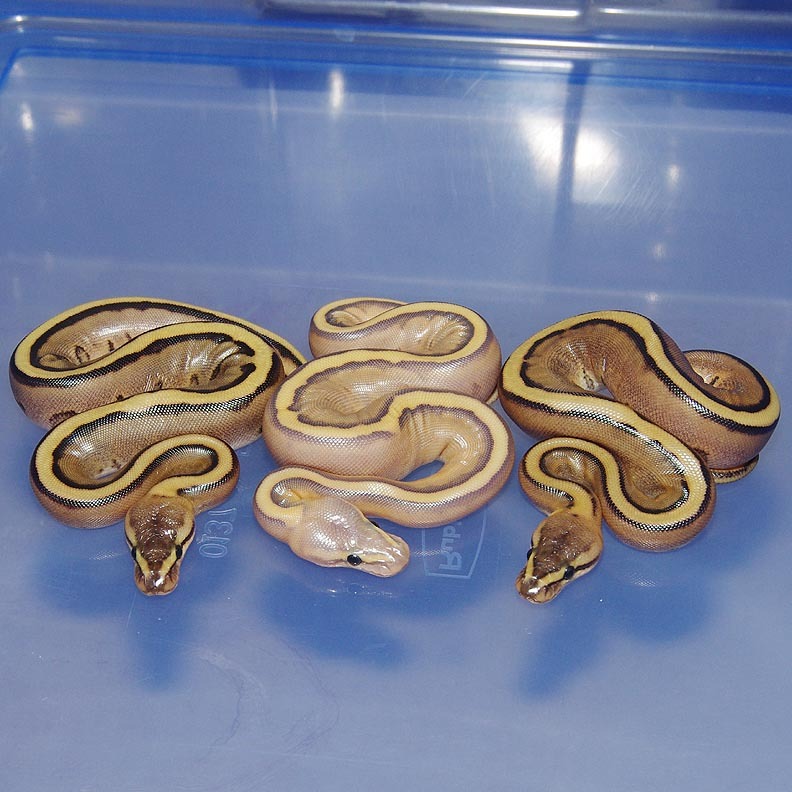 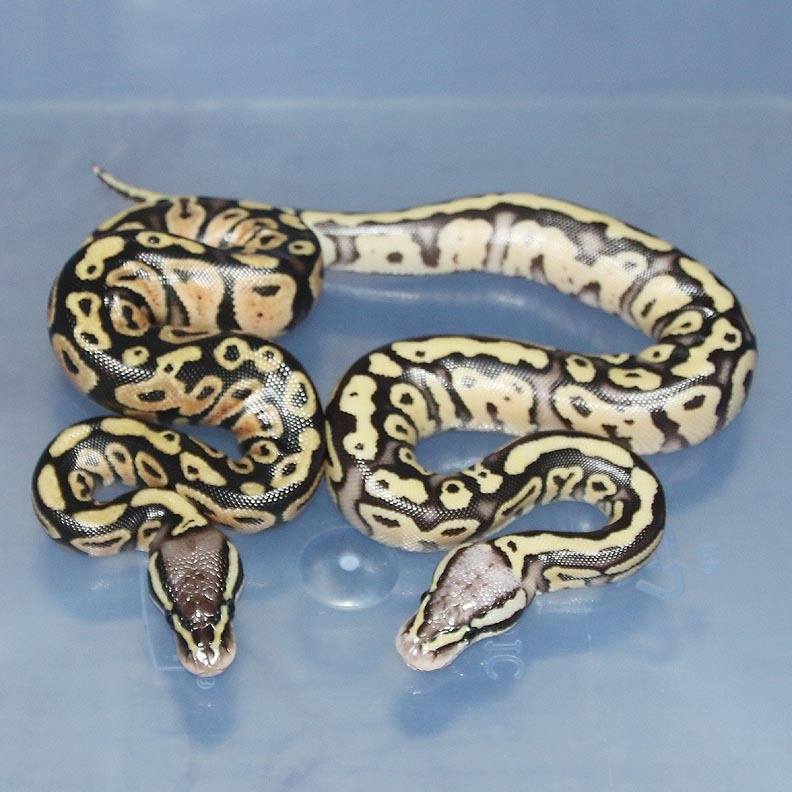 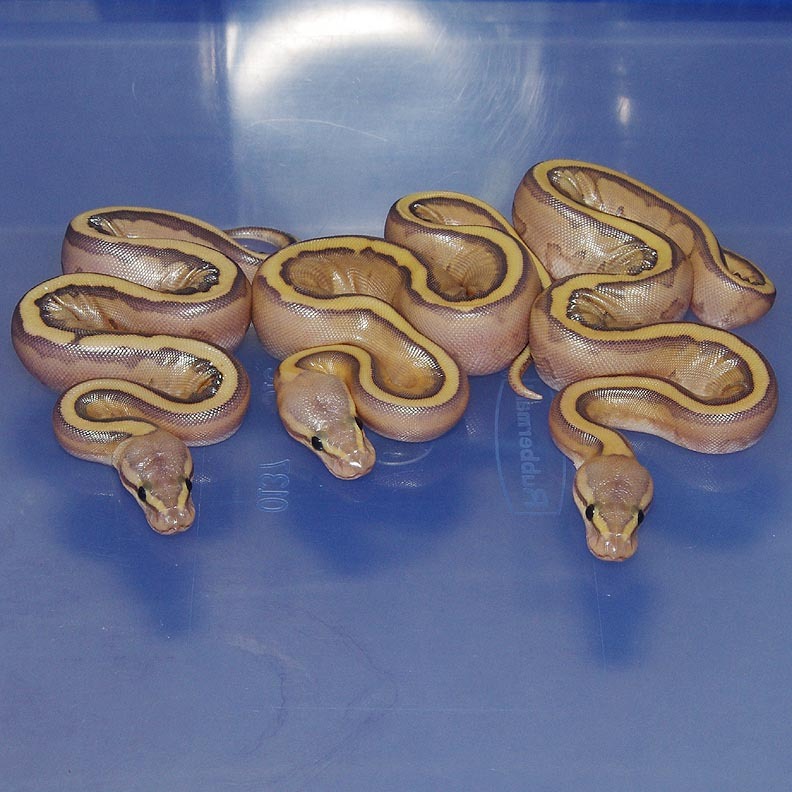 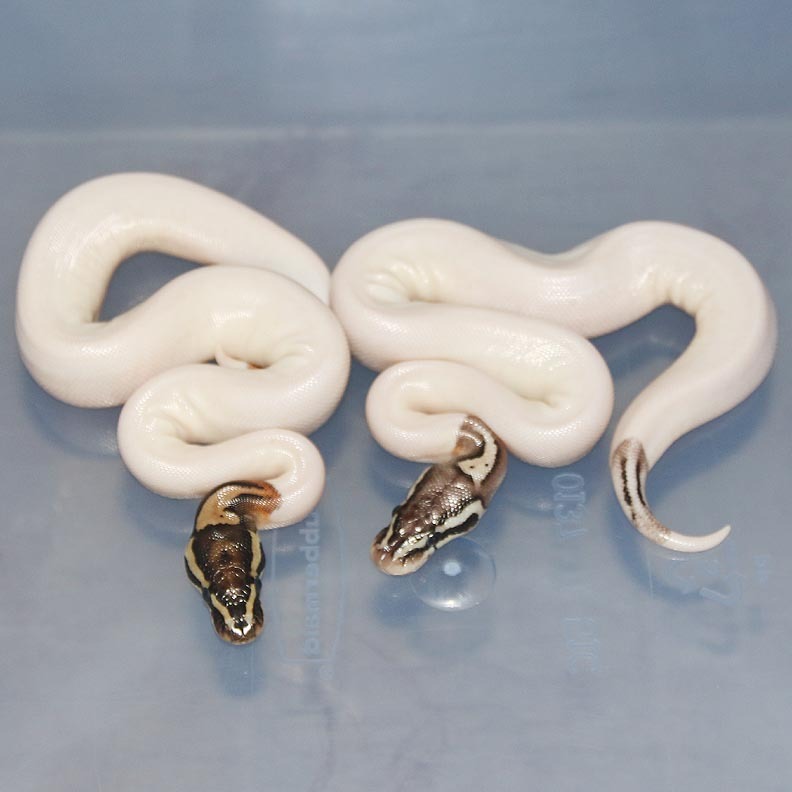 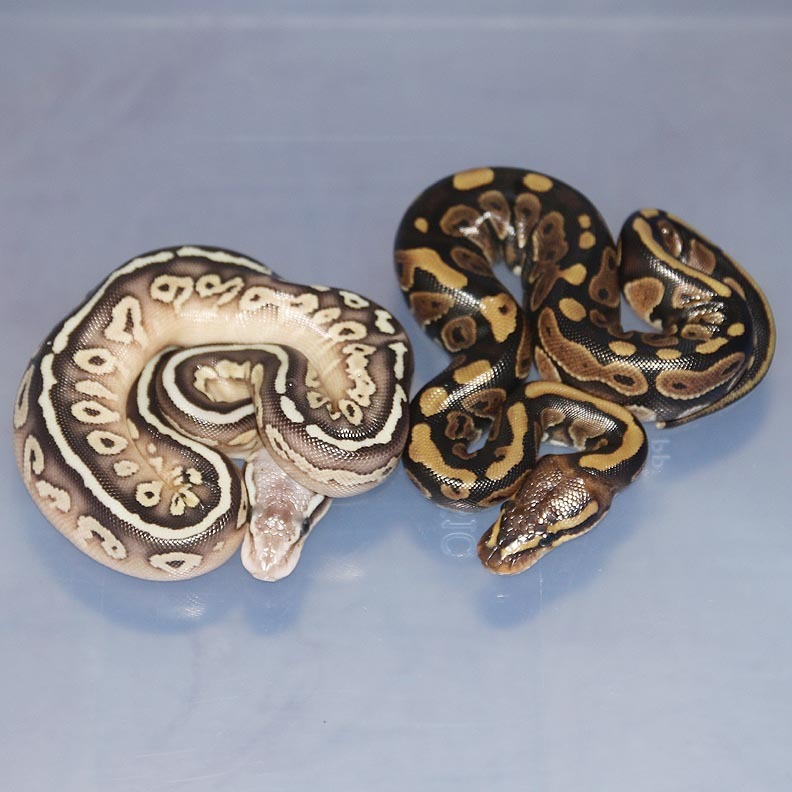 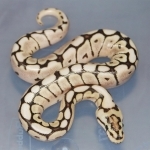 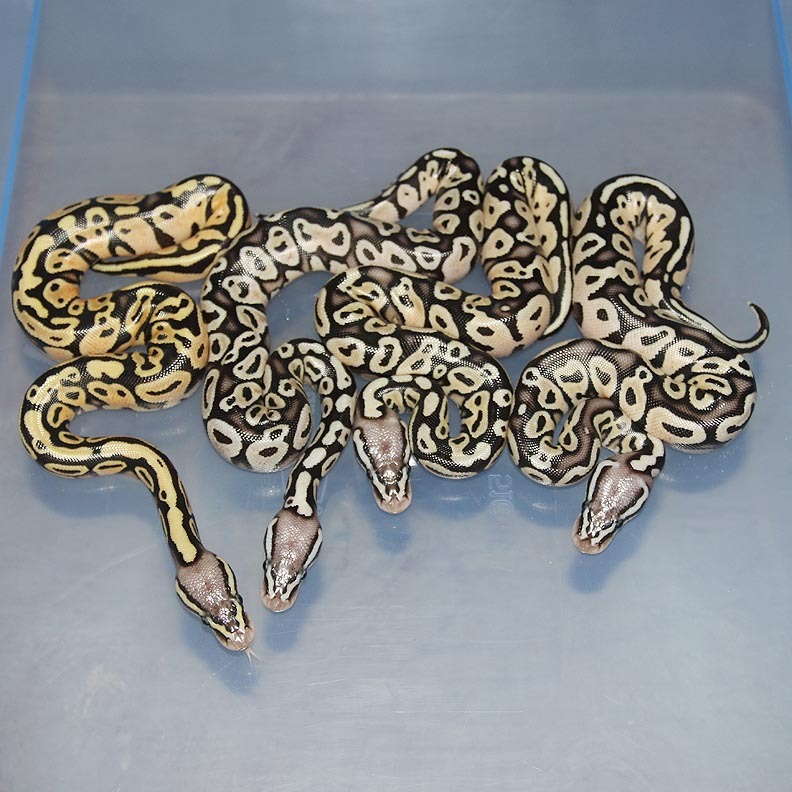 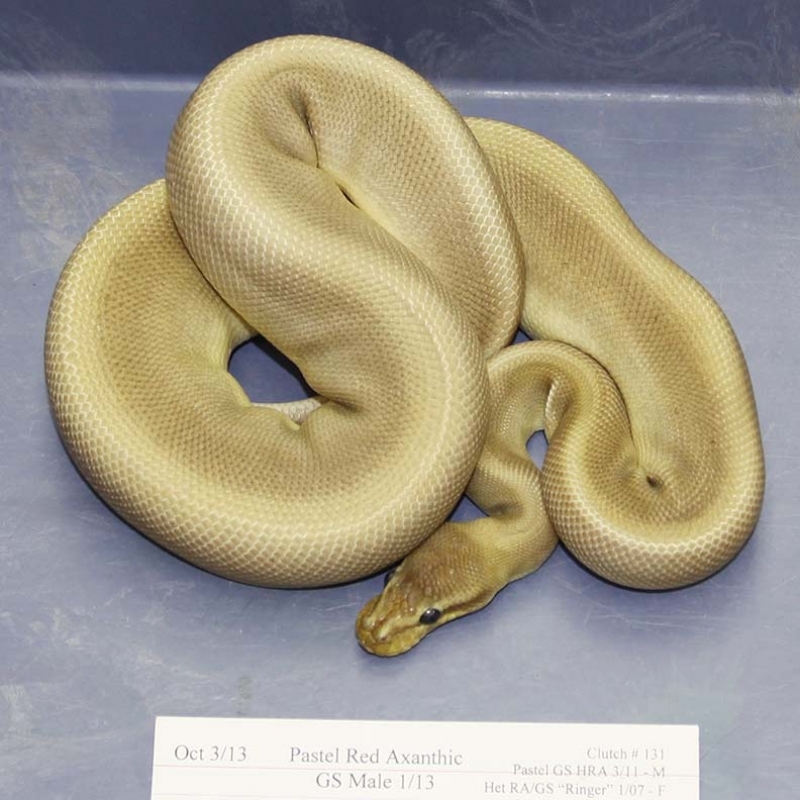 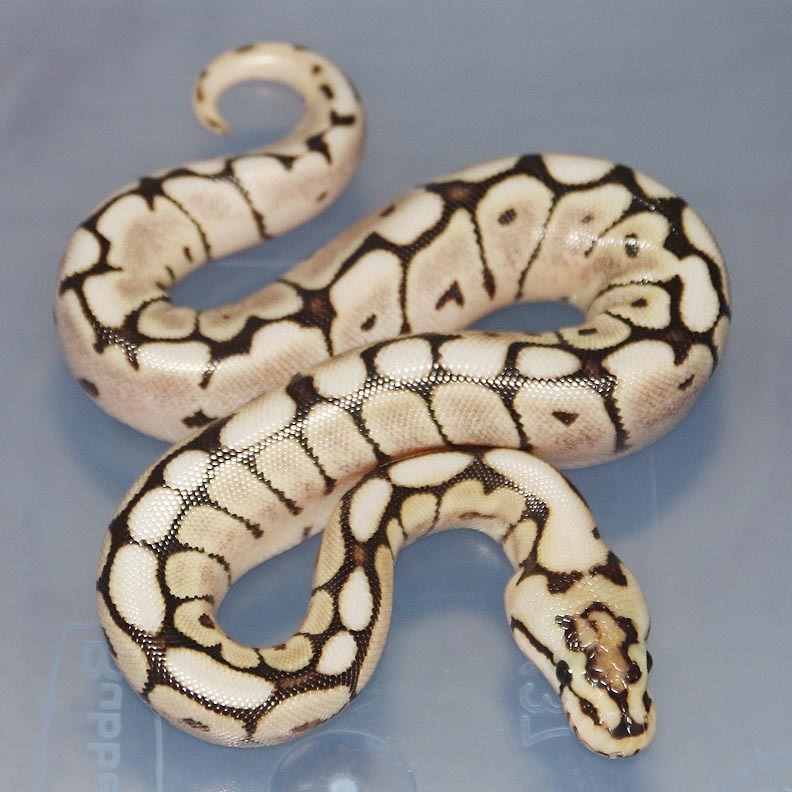 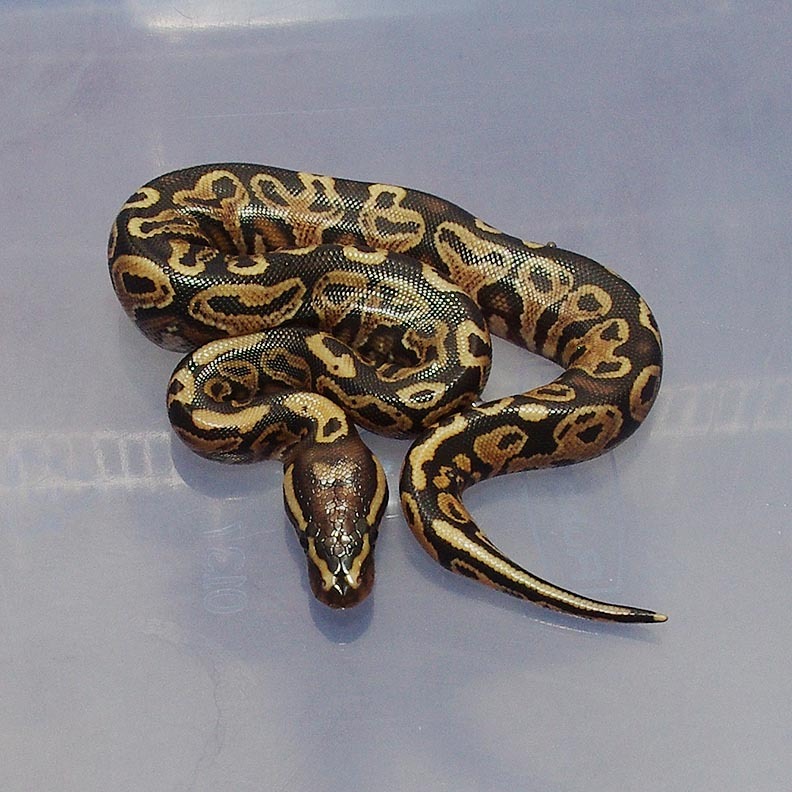 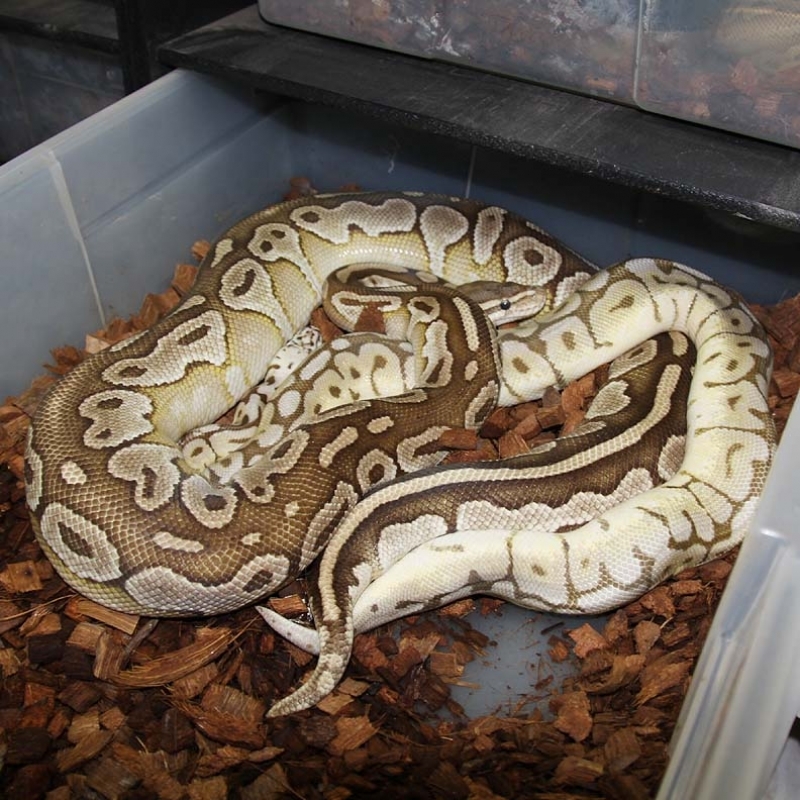 Description: Pastel Champagne Het RA/Caramel 2/12 x Het RA Het Caramel 5/10. 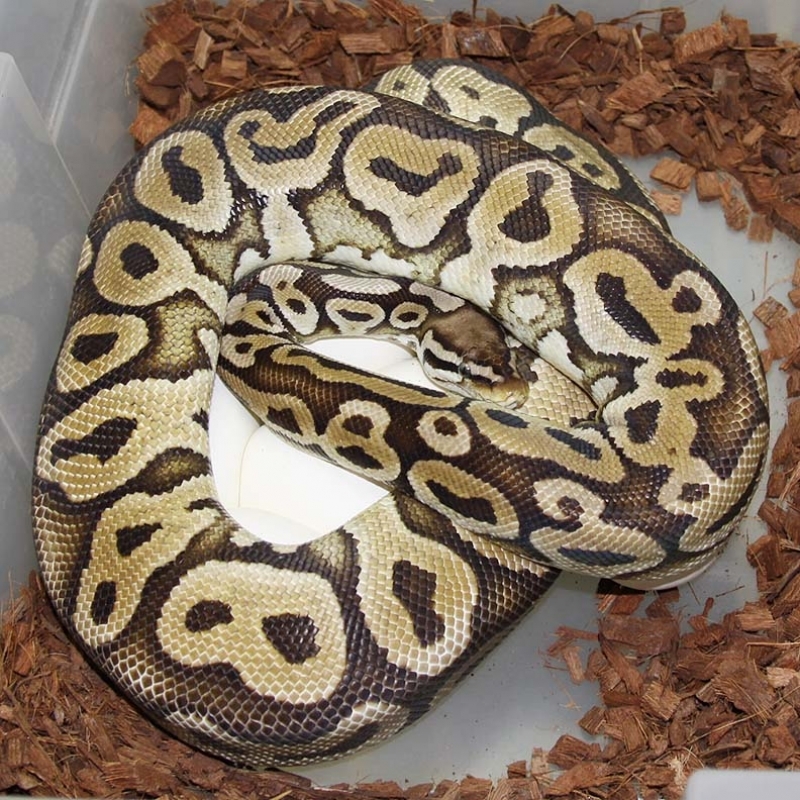 If you are interested in animals from clutch #52 please email or call 519-824-7377. 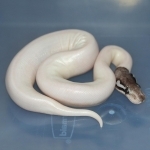 Description: Red Axanthic YB ?? 1/13 x YB 3/08 JW. 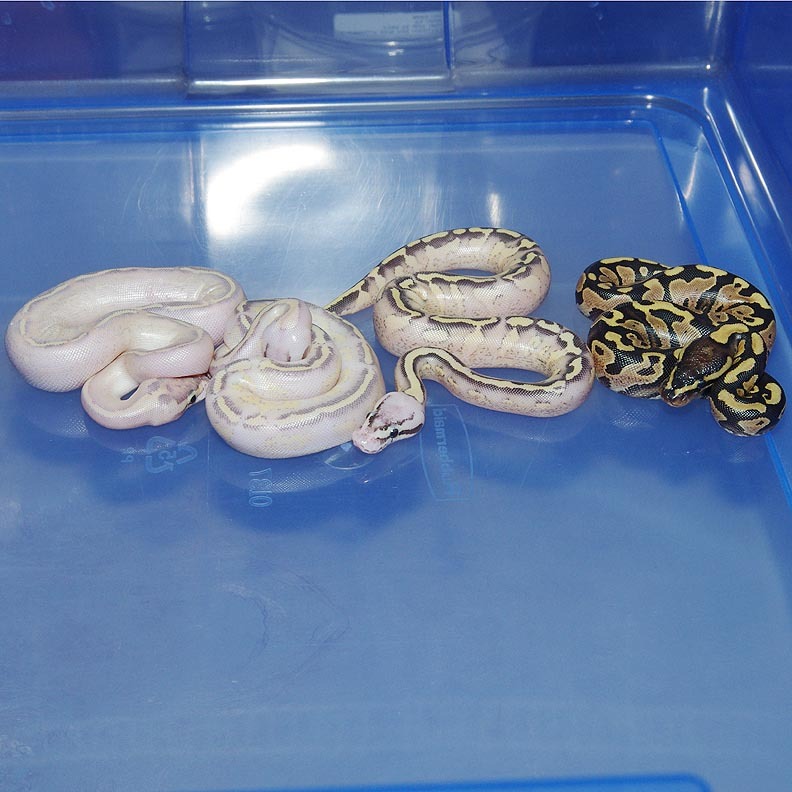 If you are interested in animals from clutch #53 please email or call 519-824-7377. 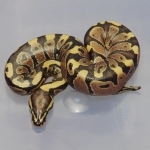 Description: Funky YB 1/11 x Funky 1/08 DU. 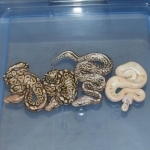 If you are interested in animals from clutch #54 please email or call 519-824-7377. Description: Lemon Pastel Highway 1/13 x Spark 2/11 Amir. The Pastel Gravel Spark is very different. 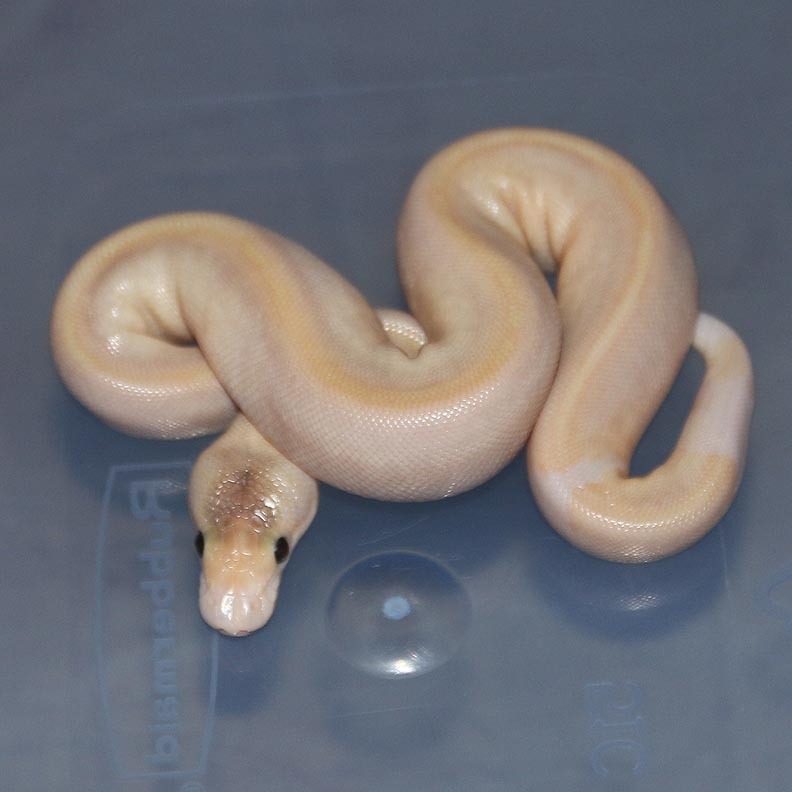 I'll take better pictures once I pick up my new camera. 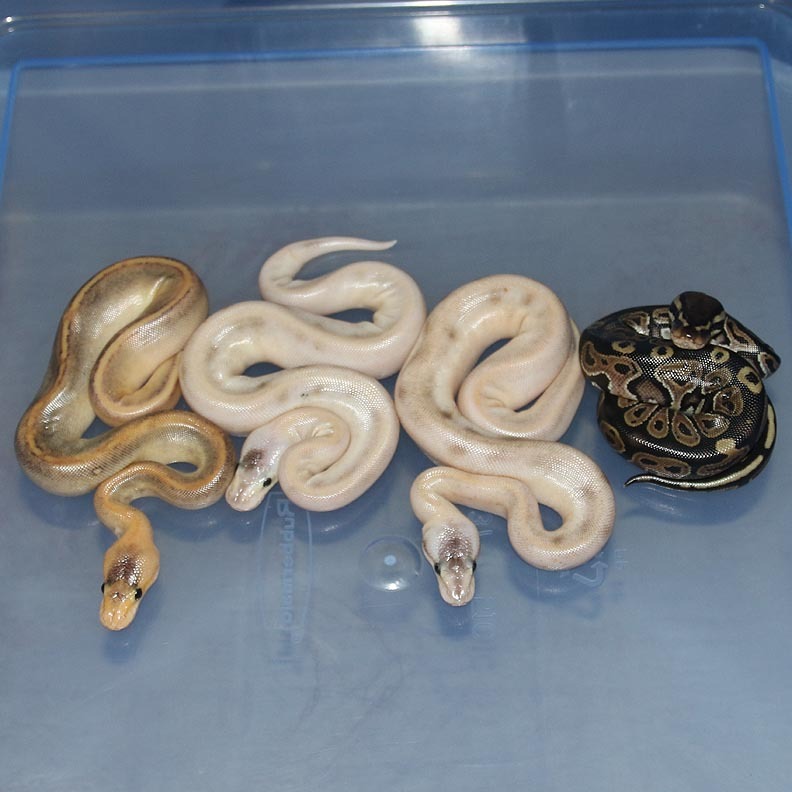 If you are interested in animals from clutch #55 please email or call 519-824-7377. 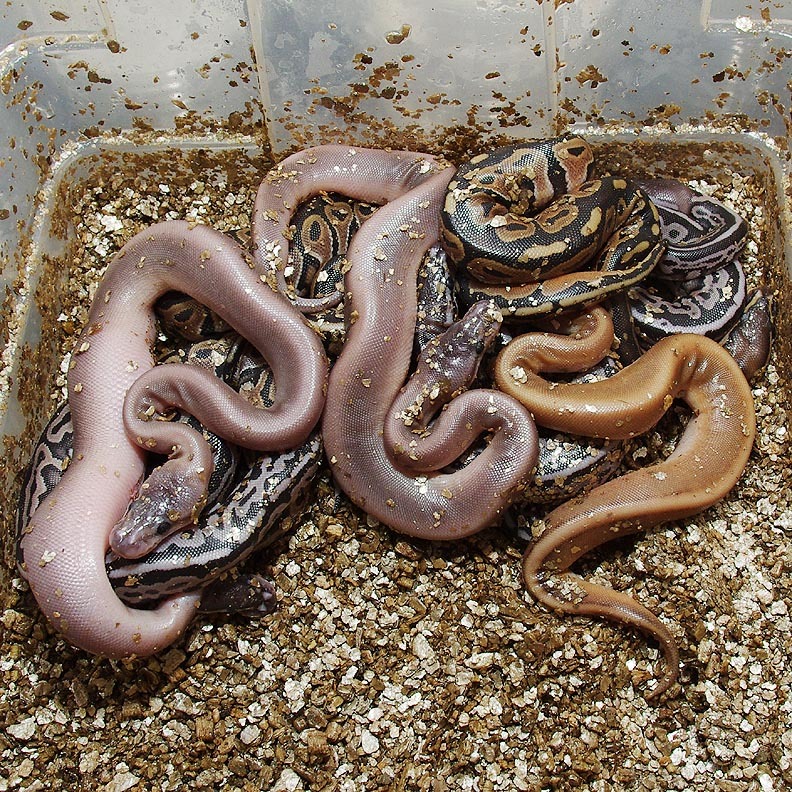 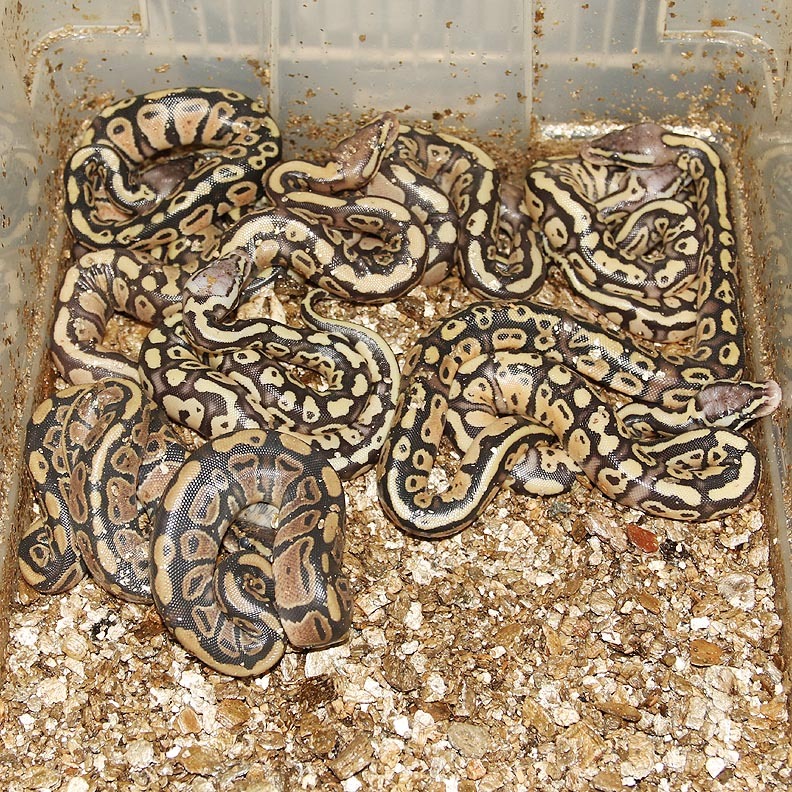 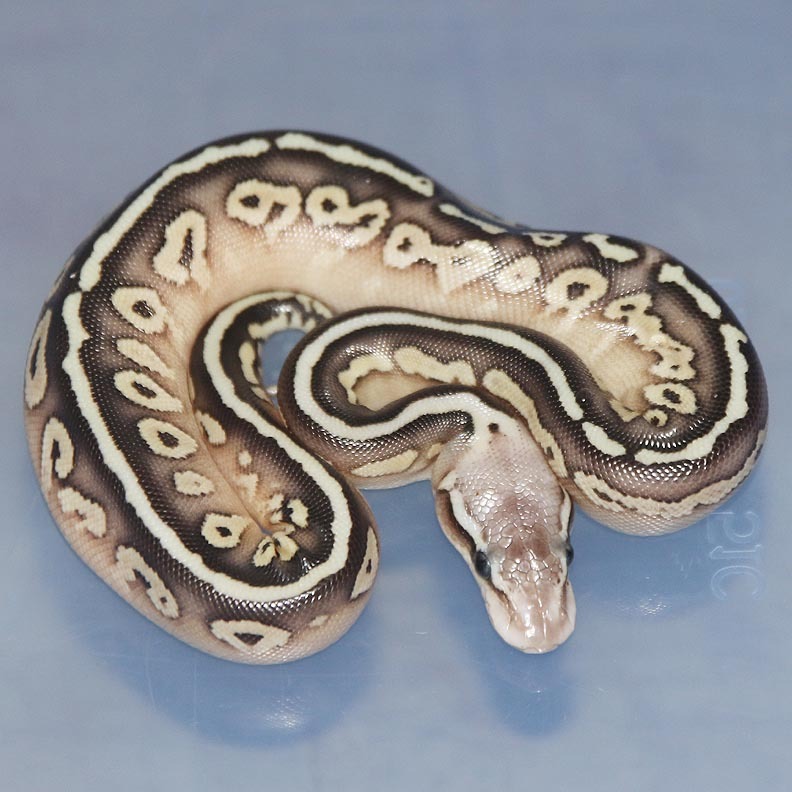 Description: Red Axanthic Genetic Stripe 1/13 x Het RA Het Genetic Stripe 1/13. 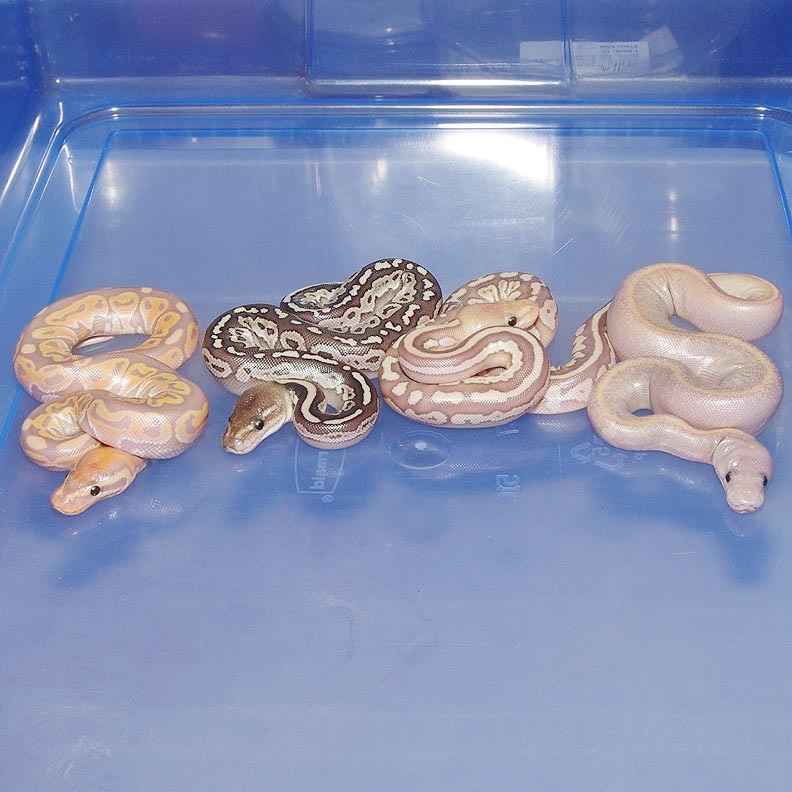 If you are interested in animals from clutch #56 please email or call 519-824-7377. 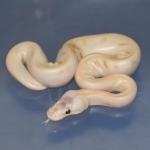 Description: Pastel Ivory "Ghost" 1/13 x Pastel Champagne HRA 1/10. 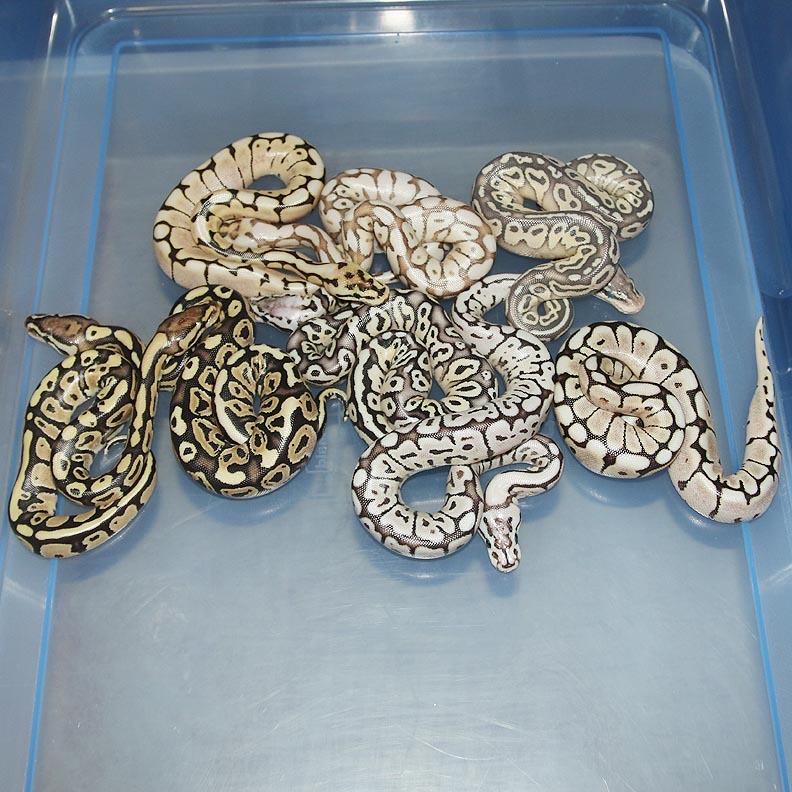 If you are interested in animals from clutch #57 please email or call 519-824-7377. 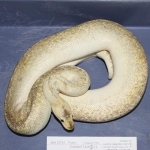 Description: Lavender HRA 3/13 x Ivory 6/11. 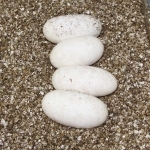 This is the first step in producing Lavender Ivory/Highway/Asphalt....etc. 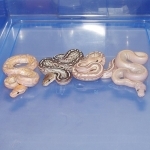 If you are interested in animals from clutch #58 please email or call 519-824-7377. 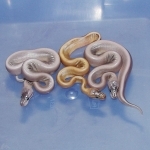 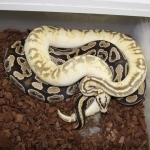 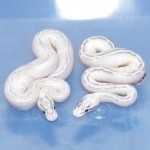 Description: Citrus Spark Het RA Het Orange Ghost 2/13 x Orange Ghost YB 1/13. 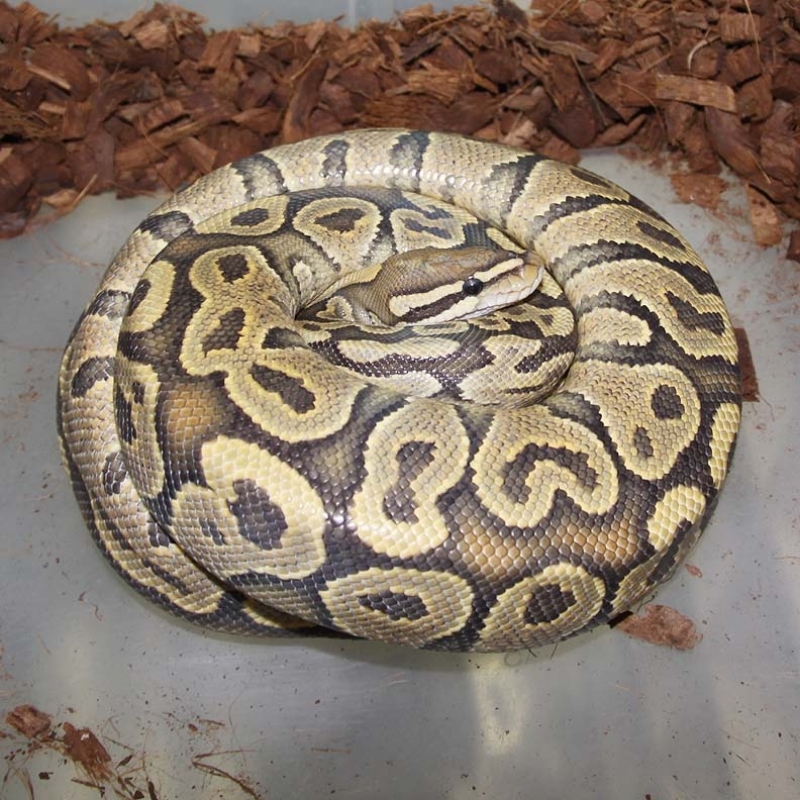 If you are interested in animals from clutch #59 please email or call 519-824-7377. 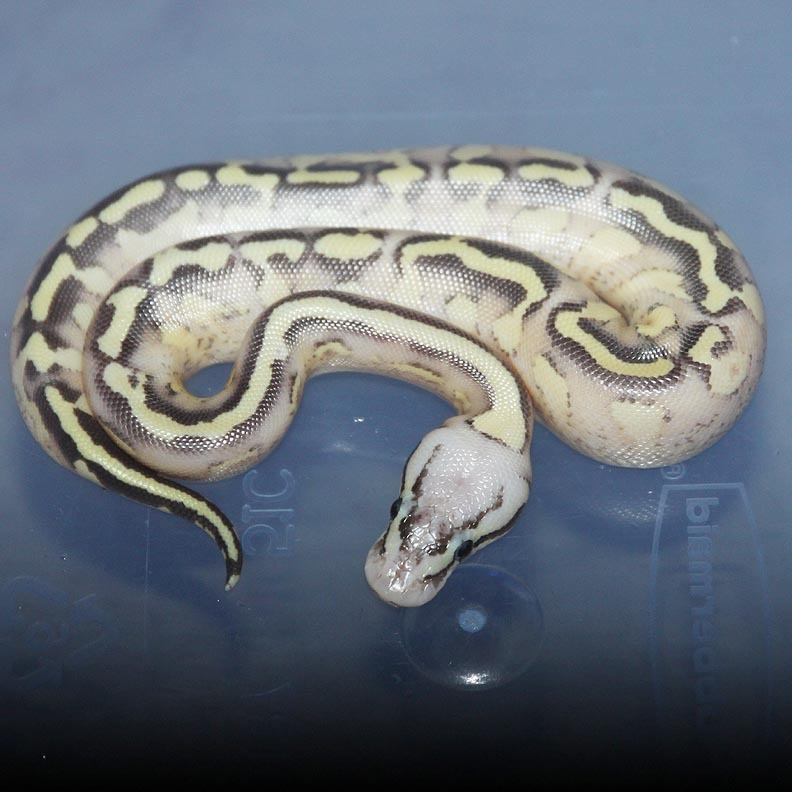 Description: Mutation X Bumble Bee HRA 1/13 x Lesser HRA 2/06. 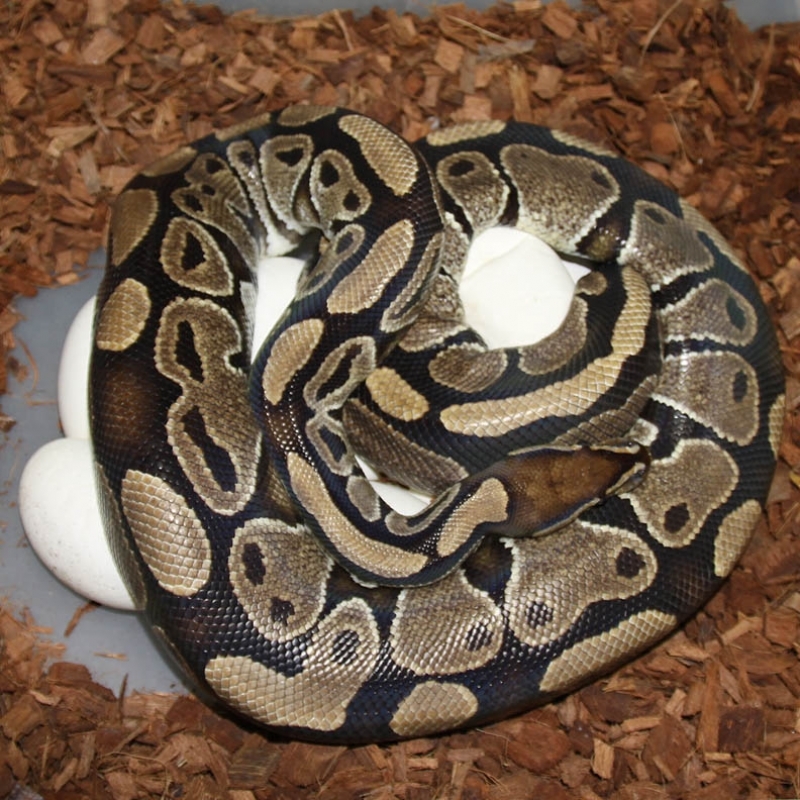 If you are interested in animals from clutch #60 please email or call 519-824-7377. Description: Banana Mahogany 1/13 x Lesser Mahogany 1/13. This clutch has the potential to produce Lesser Banana SUMA's. 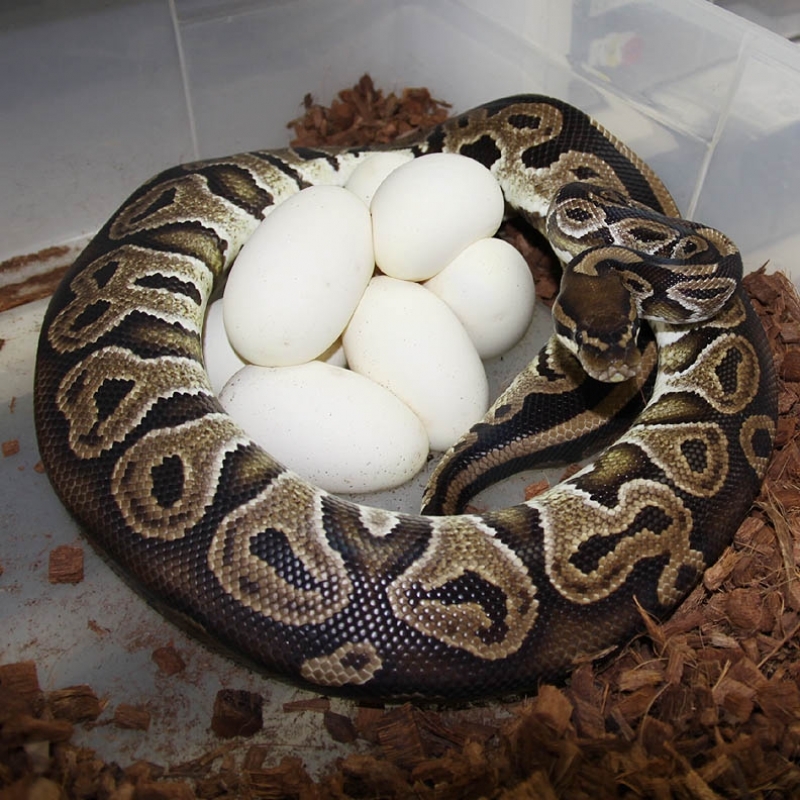 Amazing clutch! 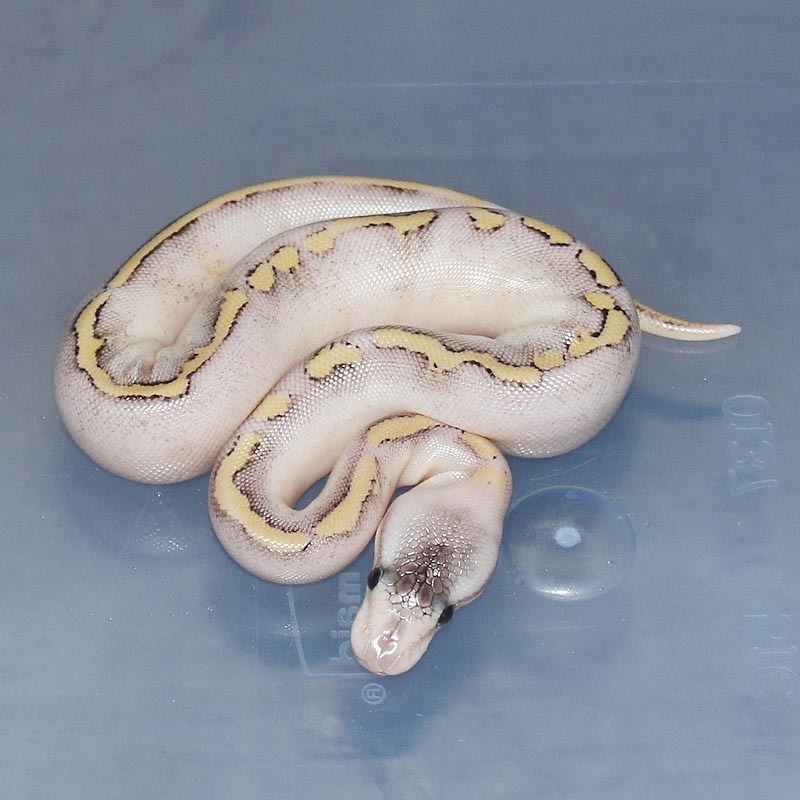 I'm really happy with the results of this one. 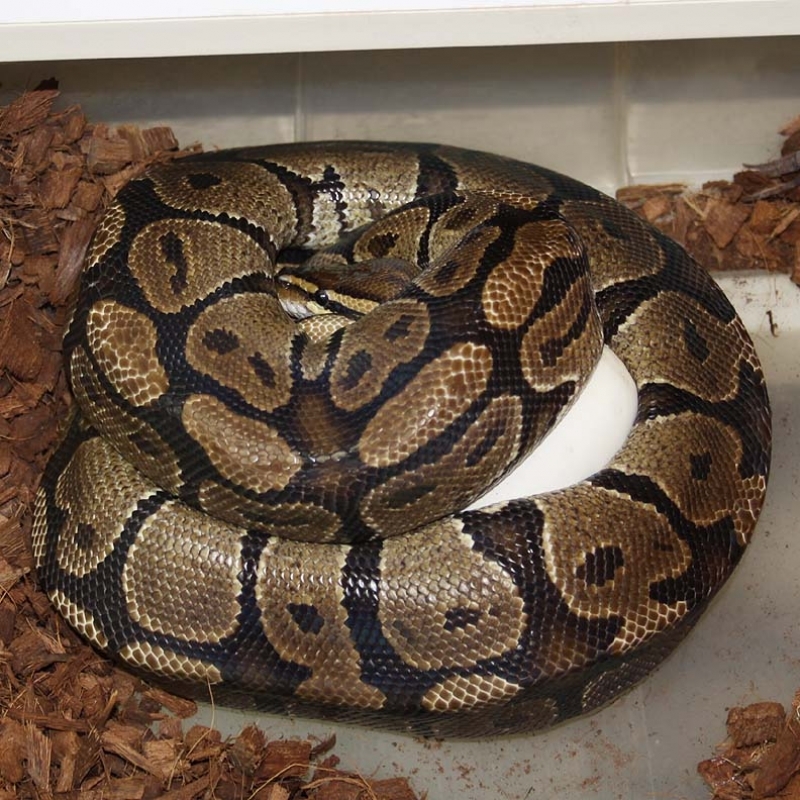 If you are interested in animals from clutch #61 please email or call 519-824-7377. 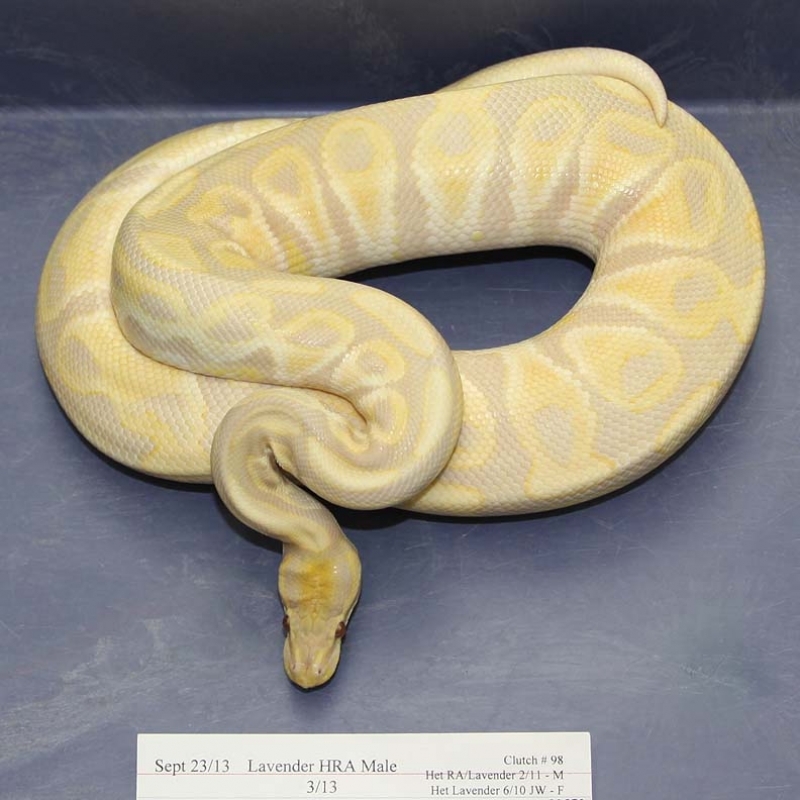 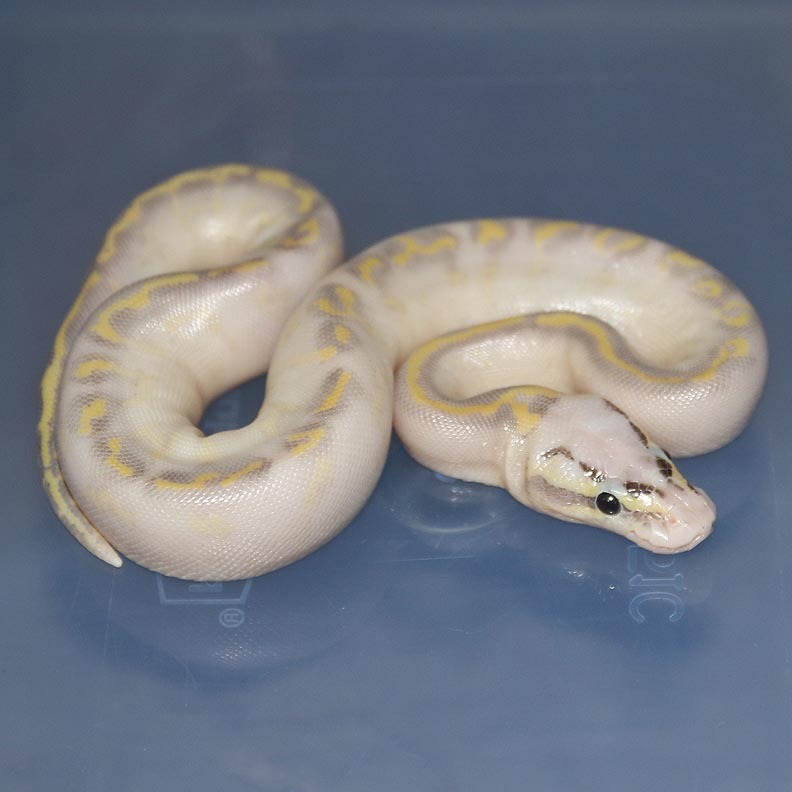 Description: Lemon Pastel Highway 1/13 x Pastel Het RA YB 1/09. This pair bred once but I didn't get a chance to take their picture. 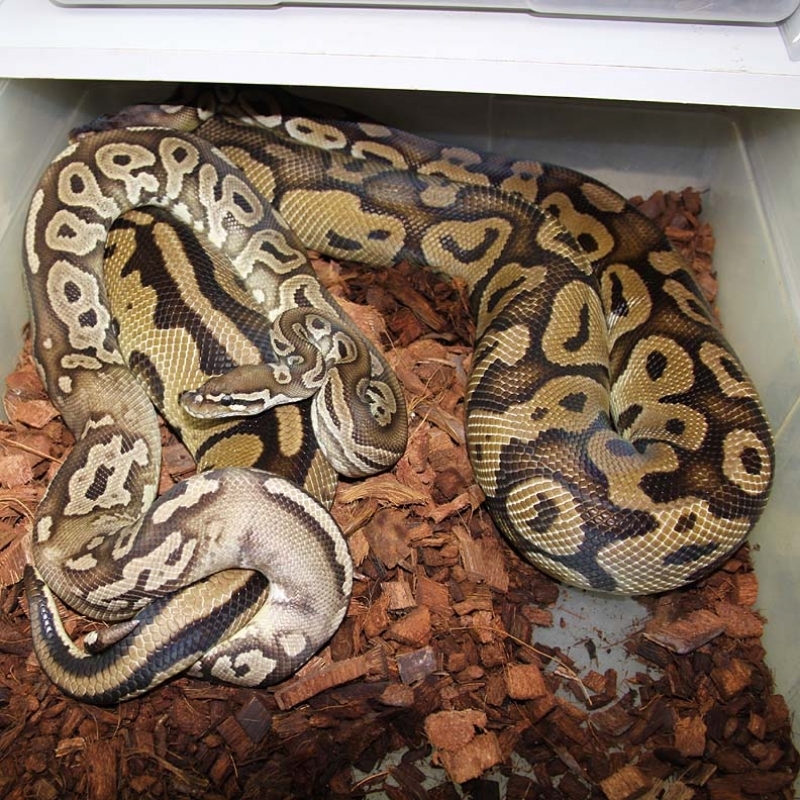 If you are interested in animals from clutch #62 please email or call 519-824-7377. 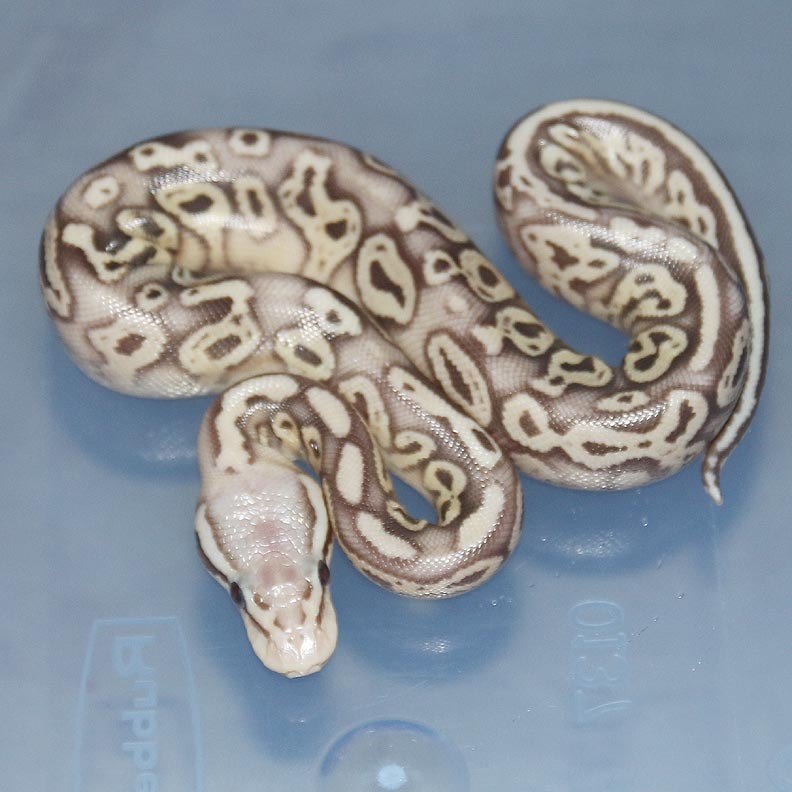 Description: Lavender Het Pied 1/12 x Pastel Het RA Het Pied 2/10. 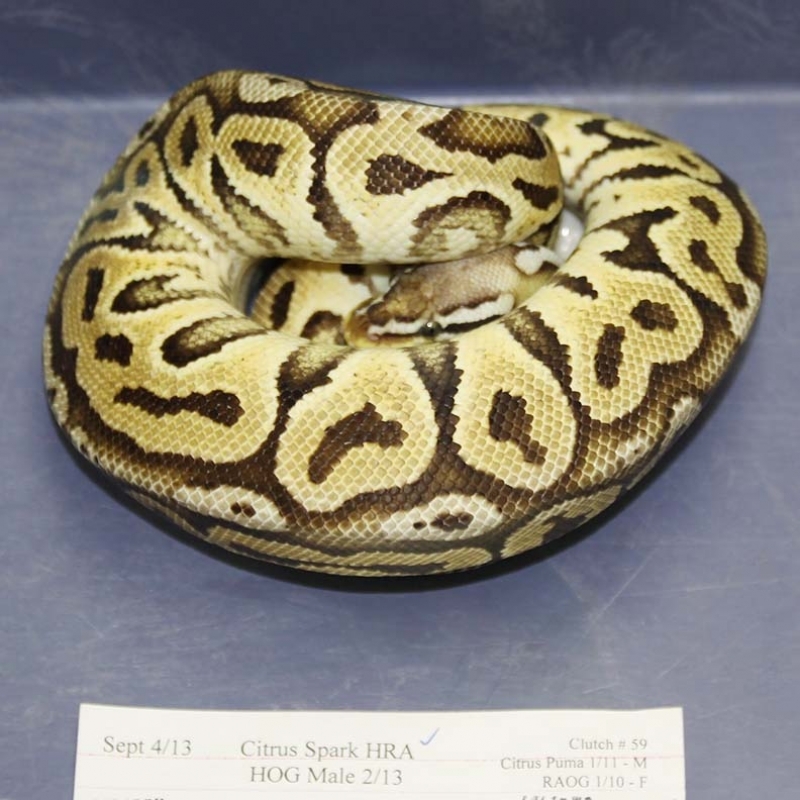 If you are interested in animals from clutch #63 please email or call 519-824-7377. 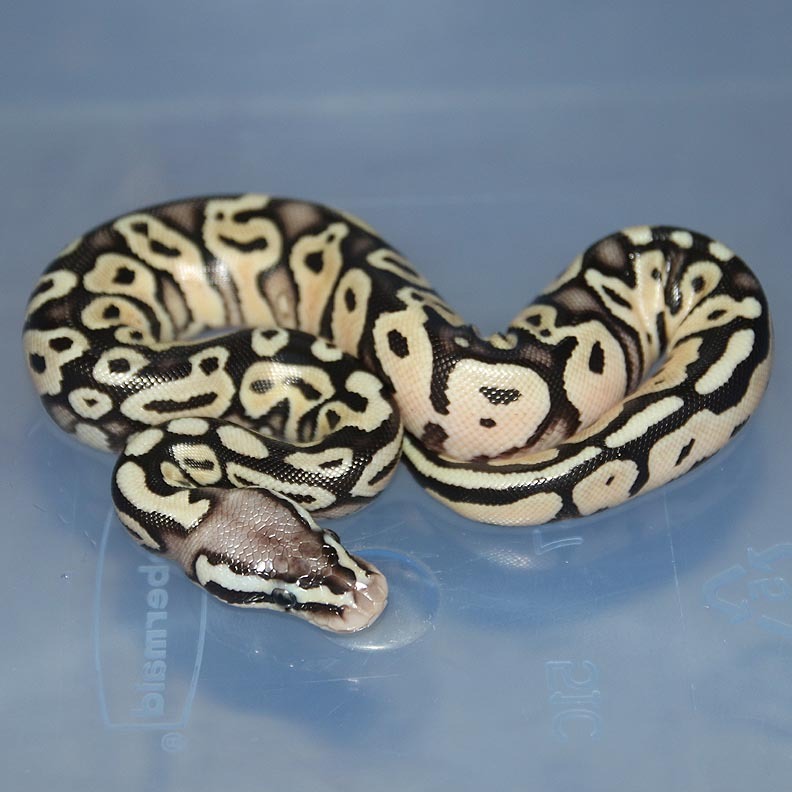 Description: Red Axanthic Het Pied 1/12 x Pastel Het RA Het Pied 1/11. Amazing clutch! 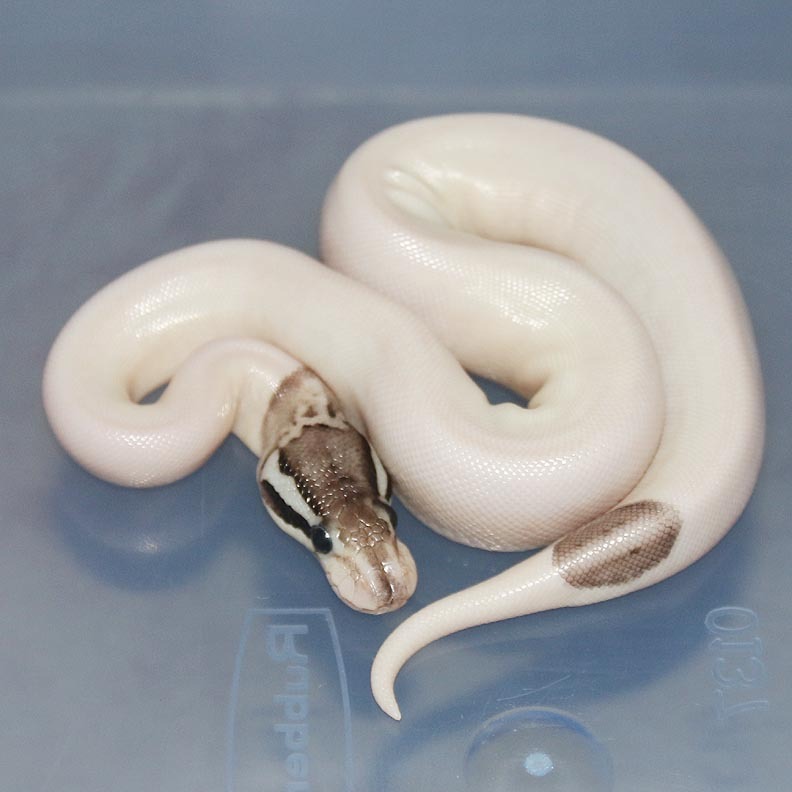 Also, I finally produced a male! 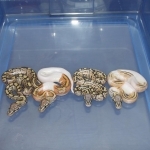 If you are interested in animals from clutch #64 please email or call 519-824-7377. 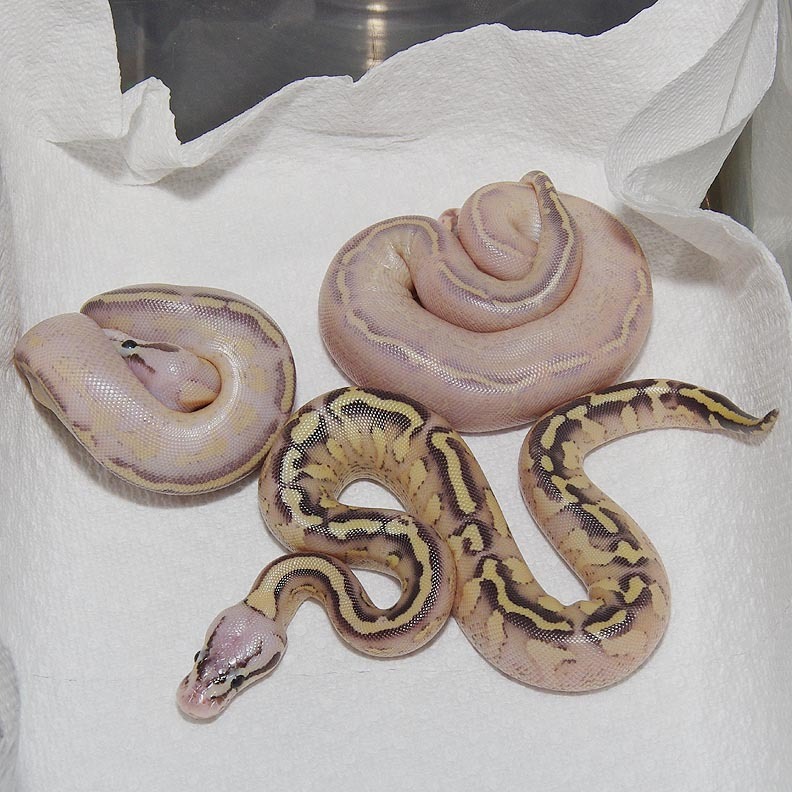 Description: Pastel Lavender Het Genetic Stripe 1/12 x Mutation X Pastel Pos Het Genetic Stripe 1/12. These guys are in shed in the pictures. 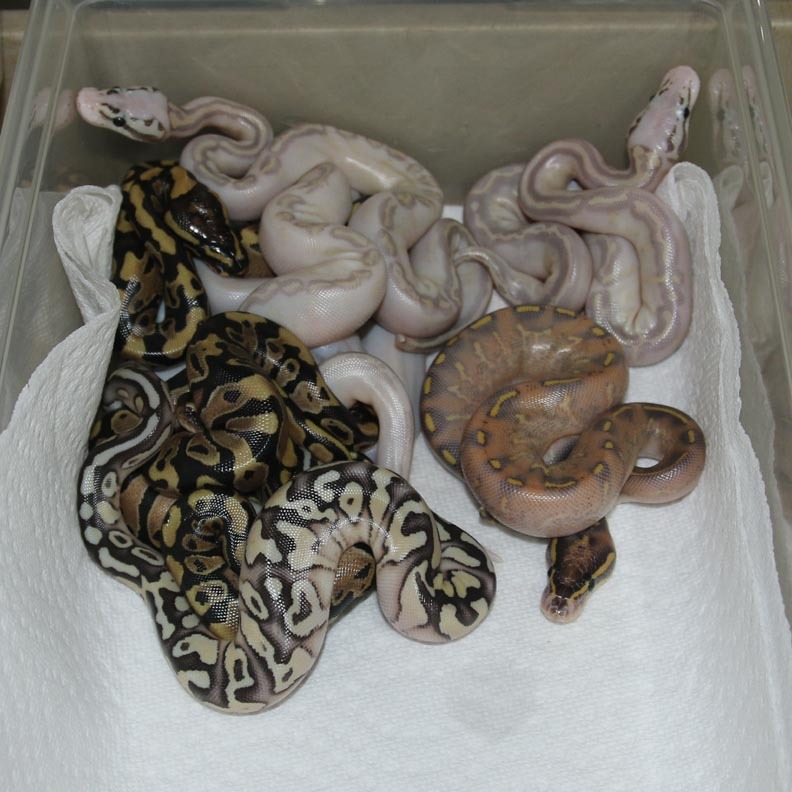 If you are interested in animals from clutch #65 please email or call 519-824-7377. Description: Pastel Mahogany 1/13 x Lesser 7/07. 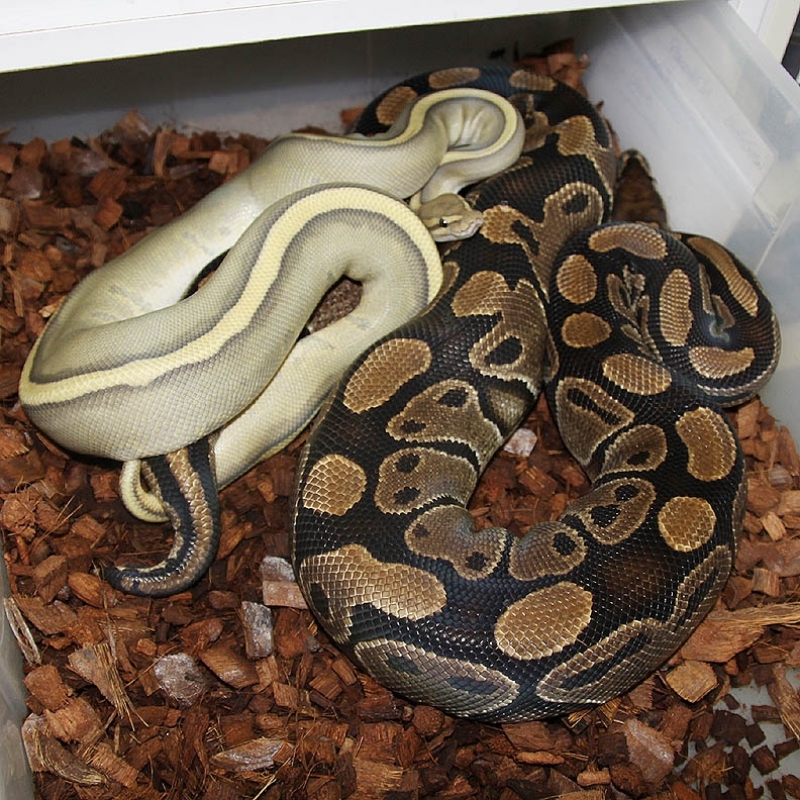 If you are interested in animals from clutch #66 please email or call 519-824-7377. 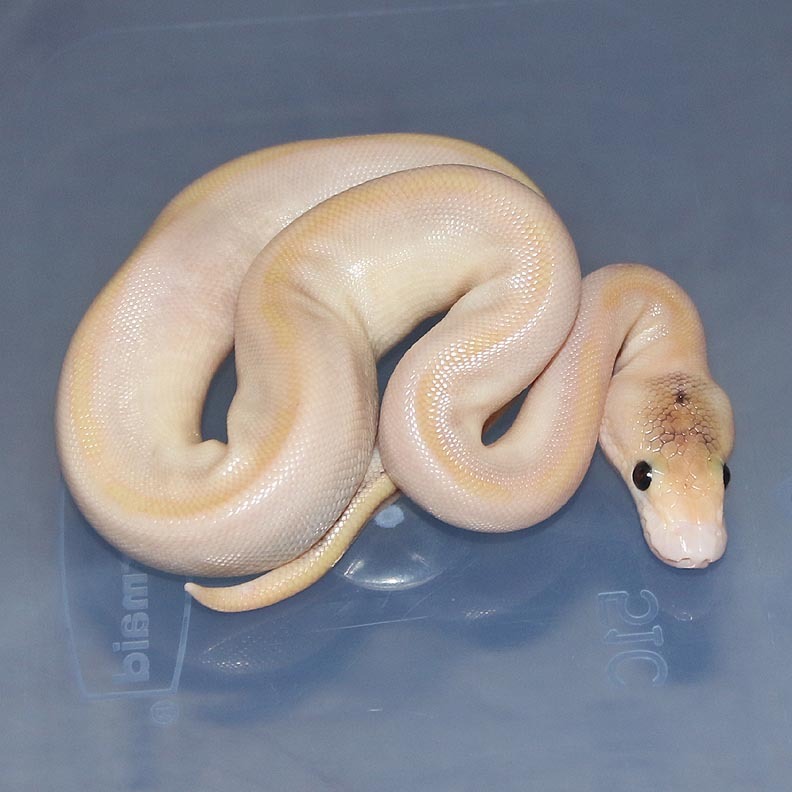 Description: Orange Ghost Genetic Stripe 1/13 x DH OG/GS 1/07. 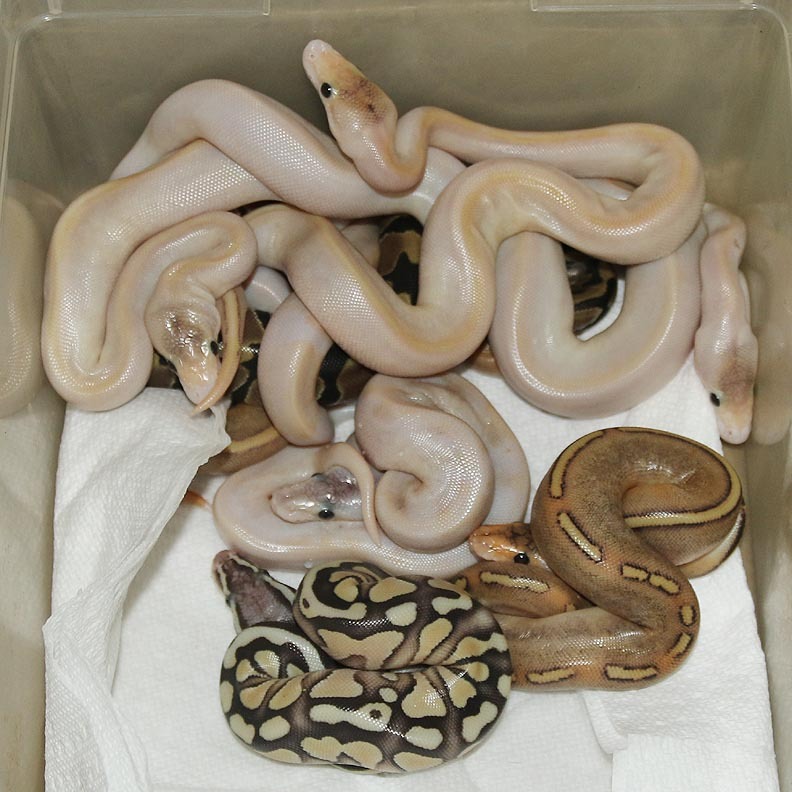 These guys are all very nice! If you are interested in animals from clutch #67 please email or call 519-824-7377. 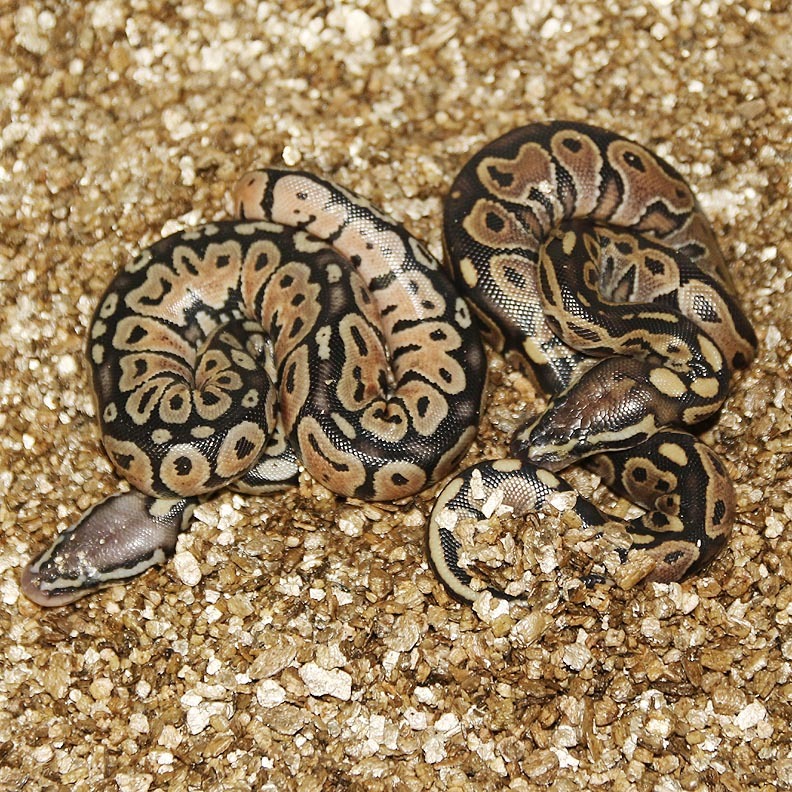 Description: Phantom HOG 1/12 x Het RA/OG "Twin" 12/08. 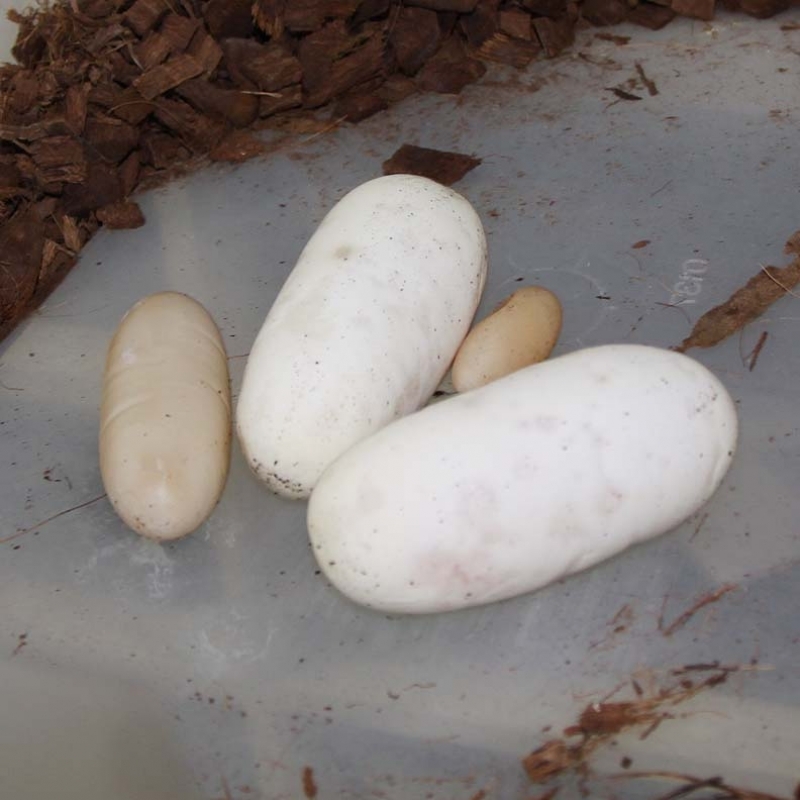 This female laid 1 Egg and 2 Slugs on Sept 1 and 4 Eggs and 4 Slugs on Sept 3. 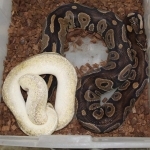 Both in shed in the pics. 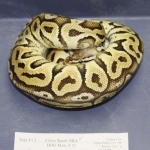 If you are interested in animals from clutch #68 please email or call 519-824-7377. 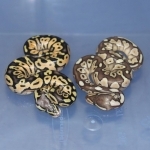 Description: SPOGL 1/13 x Pastel Chocolate HOG 2/12. 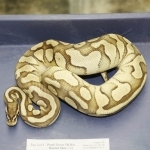 If you are interested in animals from clutch #69 please email or call 519-824-7377. 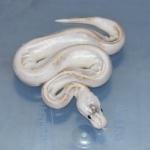 Description: Toffino HRA 1/12 x Het RA Het Albino 1/09. 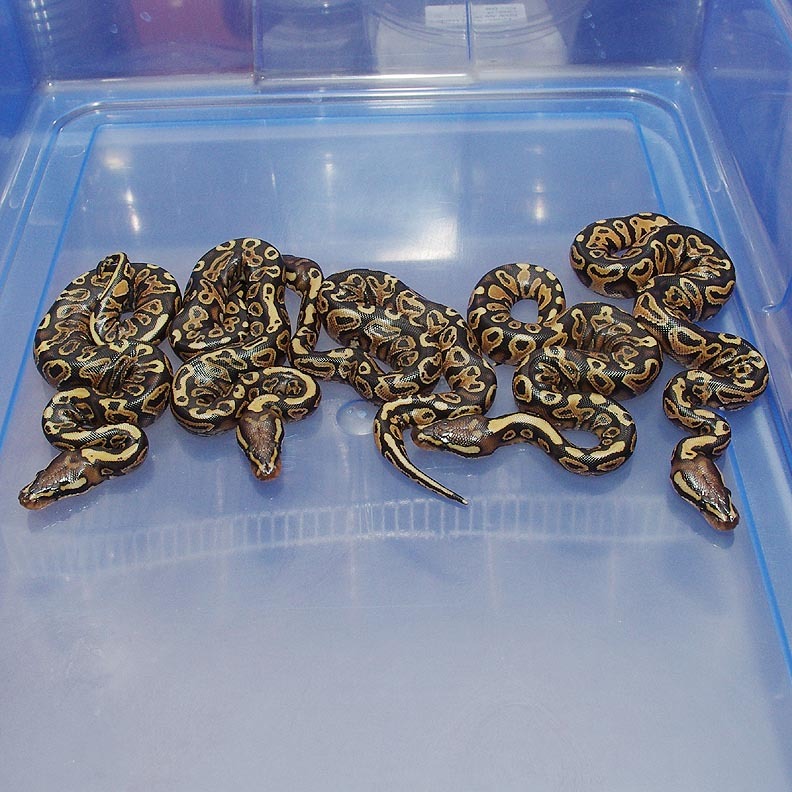 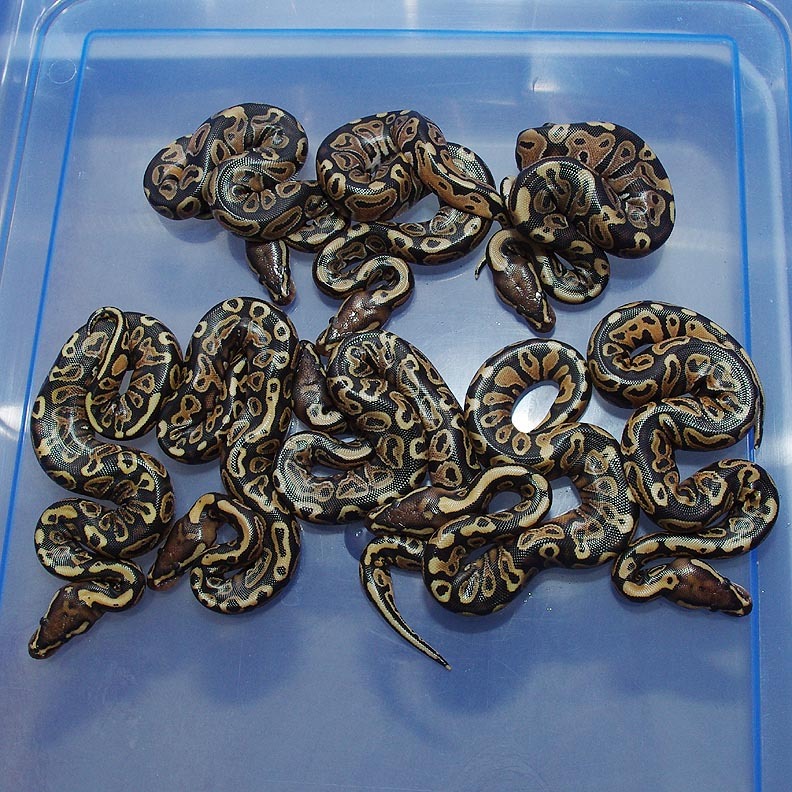 If you are interested in animals from clutch #70 please email or call 519-824-7377. Description: Citrus Puma 1/11 & 2/11 x YB 4/08 JS. If you are interested in animals from clutch #71 please email or call 519-824-7377. Description: Albino YB 1/12 x YB 1/10. 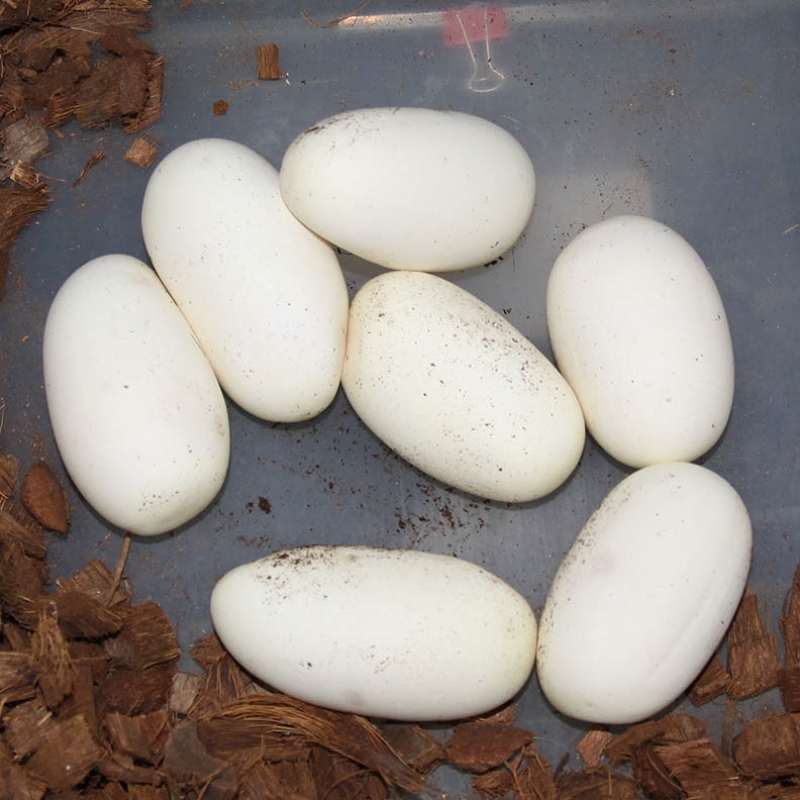 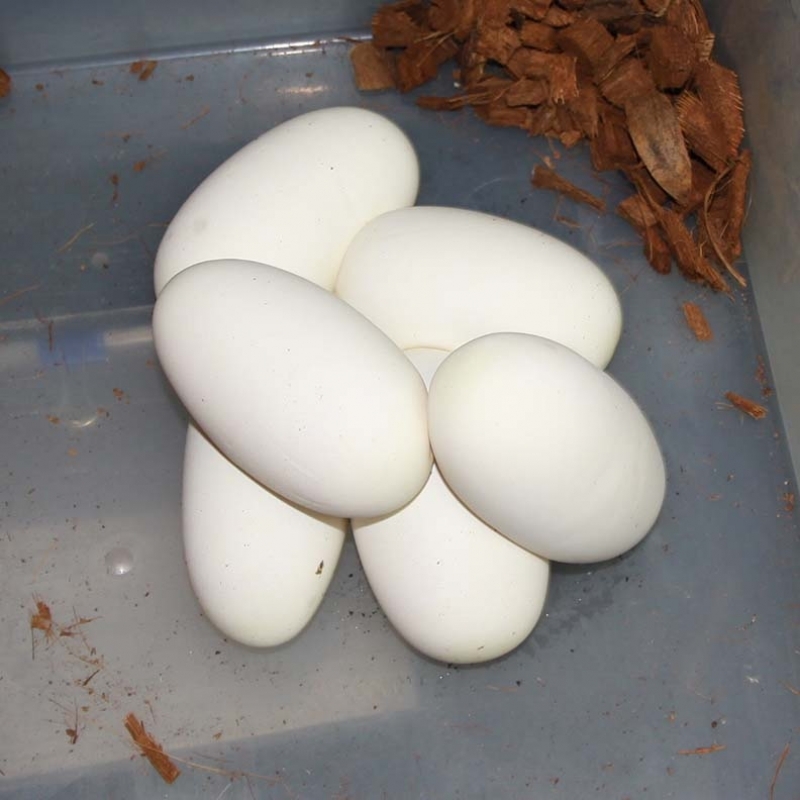 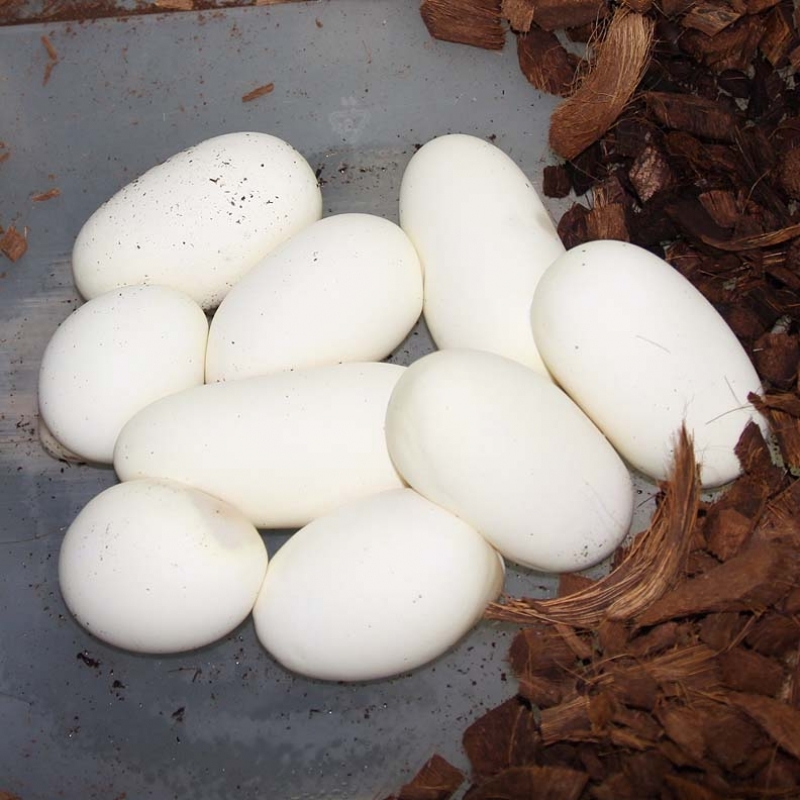 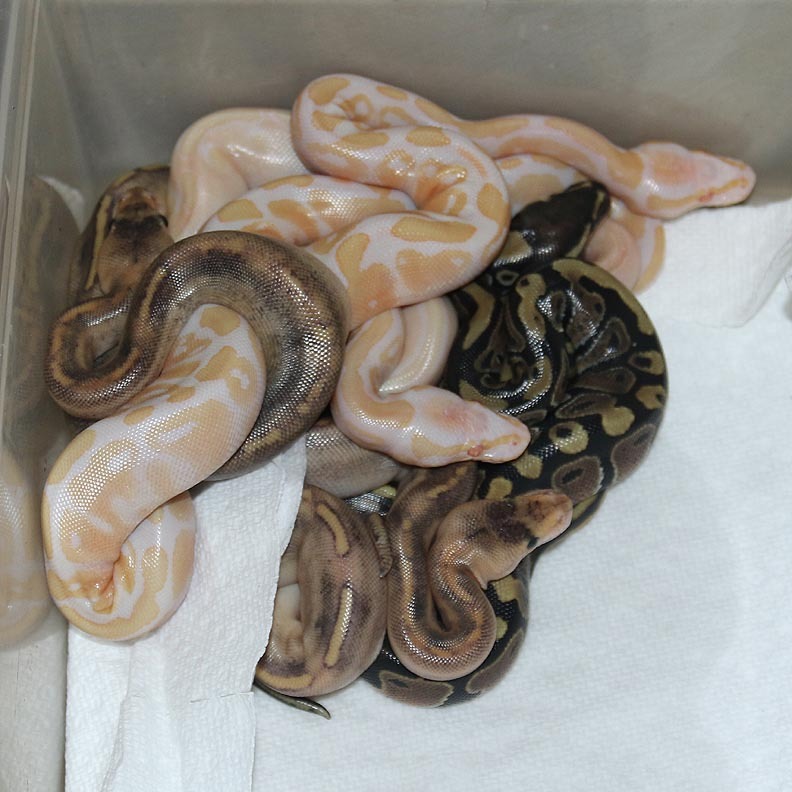 If you are interested in animals from clutch #72 please email or call 519-824-7377. 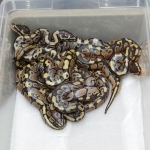 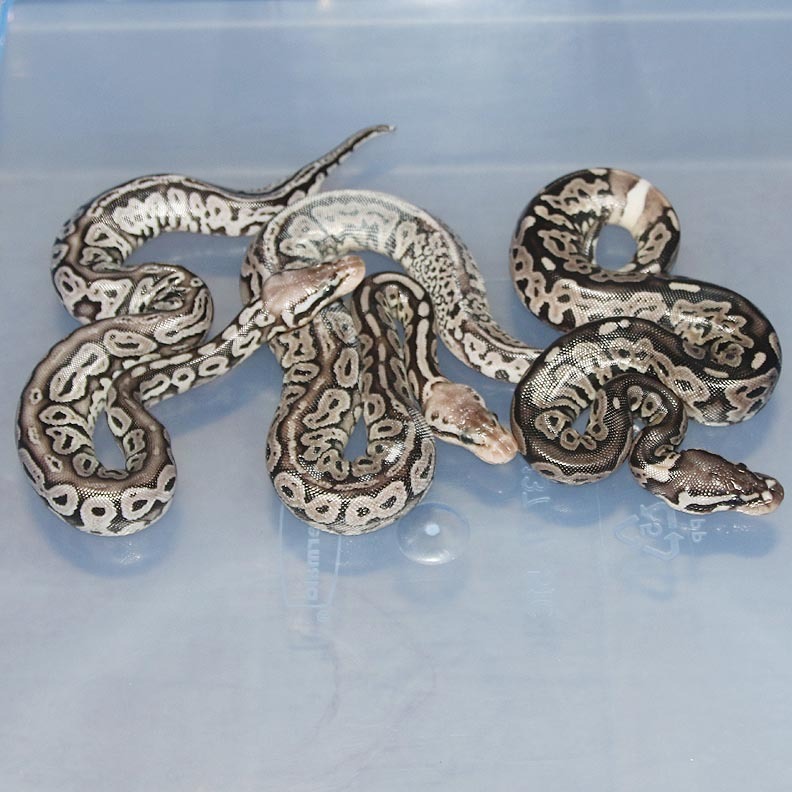 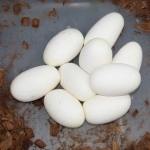 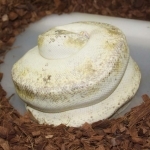 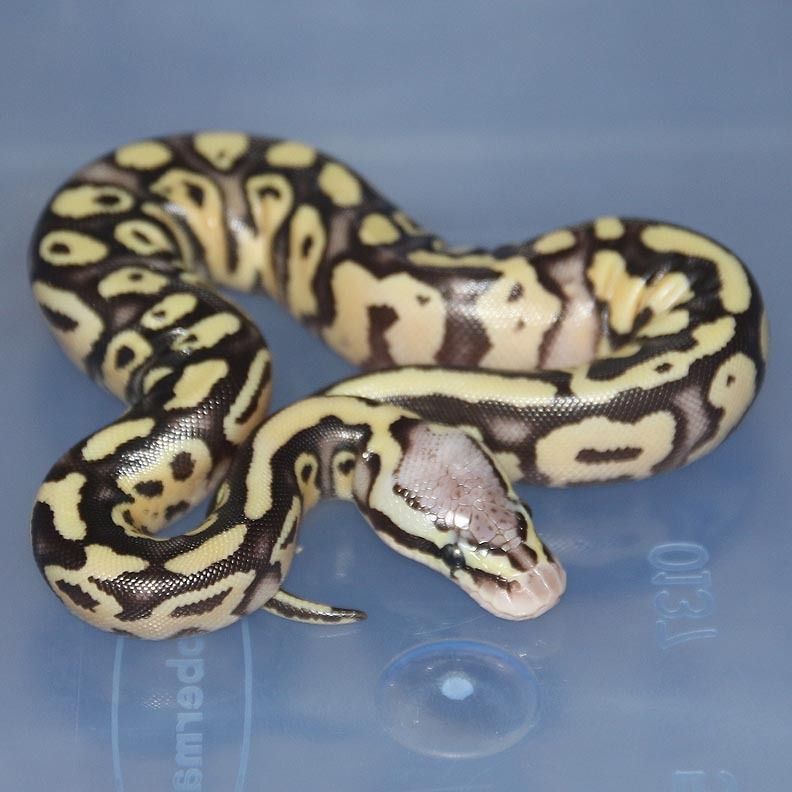 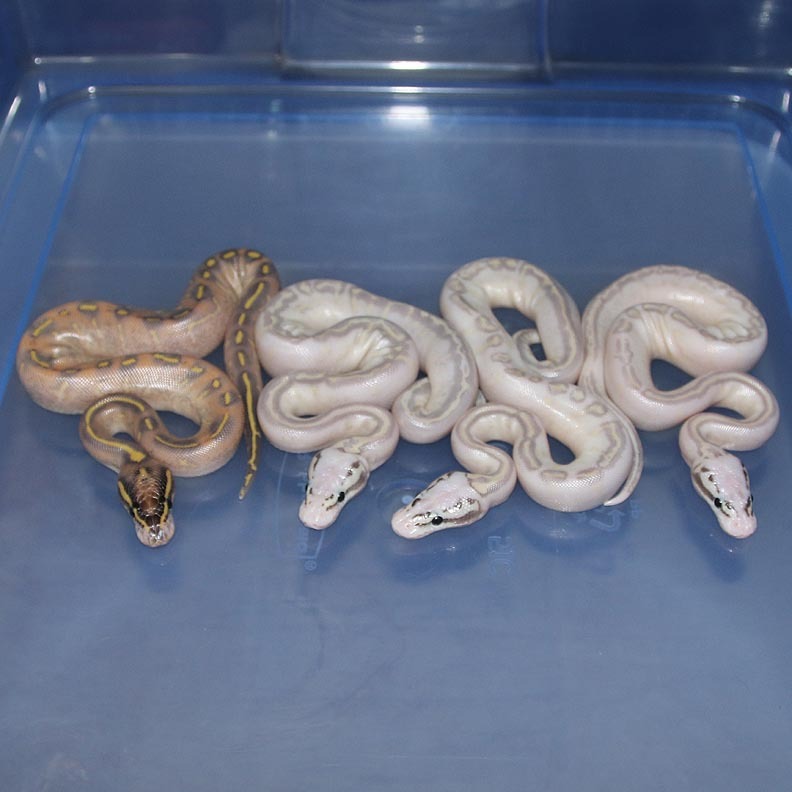 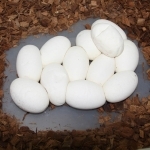 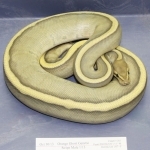 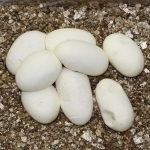 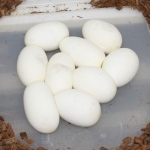 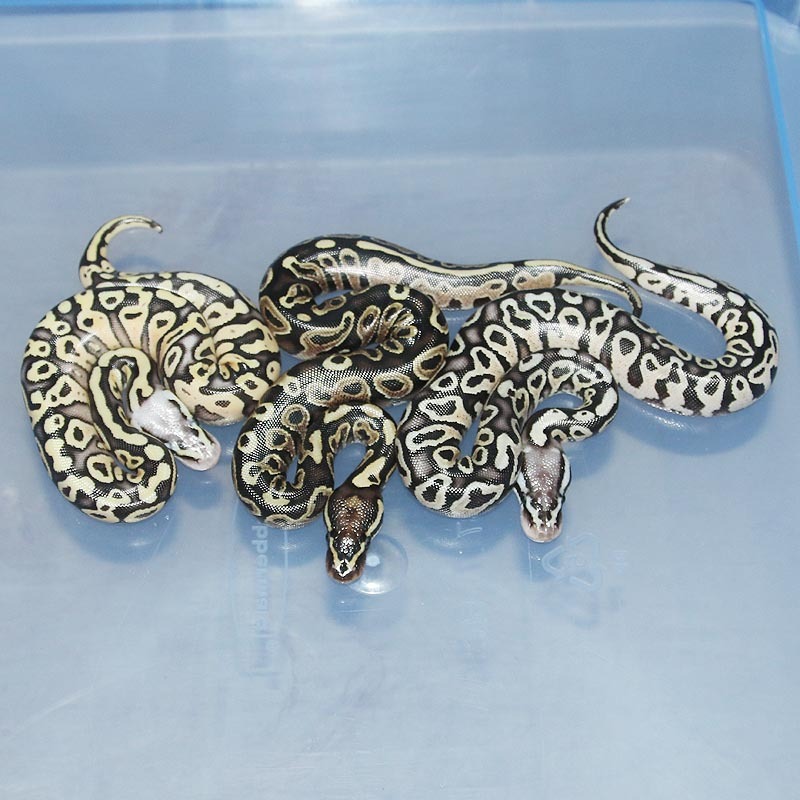 Description: Pastel Lesser YB Het Green Ghost 1/13 x Pastel Green Ghost Lesser 1/07. 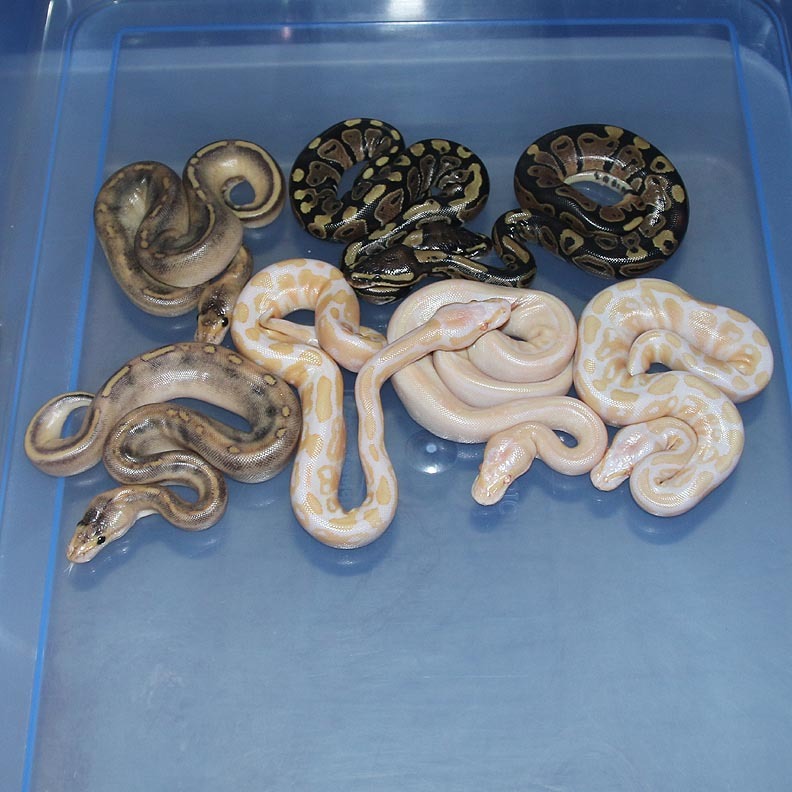 If you are interested in animals from clutch #73 please email or call 519-824-7377. Description: Lesser Mahogany HRA 1/13 x Red Axanthic Orange Ghost (RAOG) 1/11. 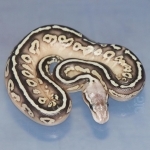 This confirms my Lesser Mahogany is a HRA! 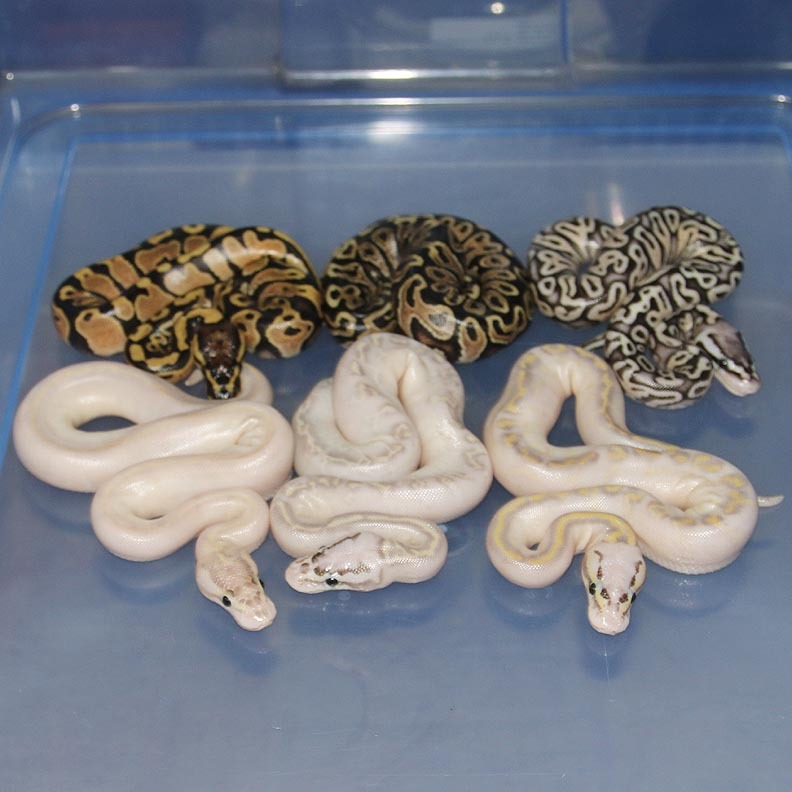 If you are interested in animals from clutch #74 please email or call 519-824-7377. 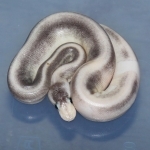 Description: Lavender Het Pied 1/12 x Pied 13/10. These Pieds are really nice!!! 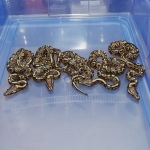 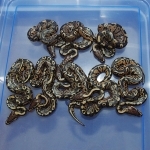 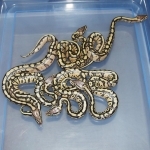 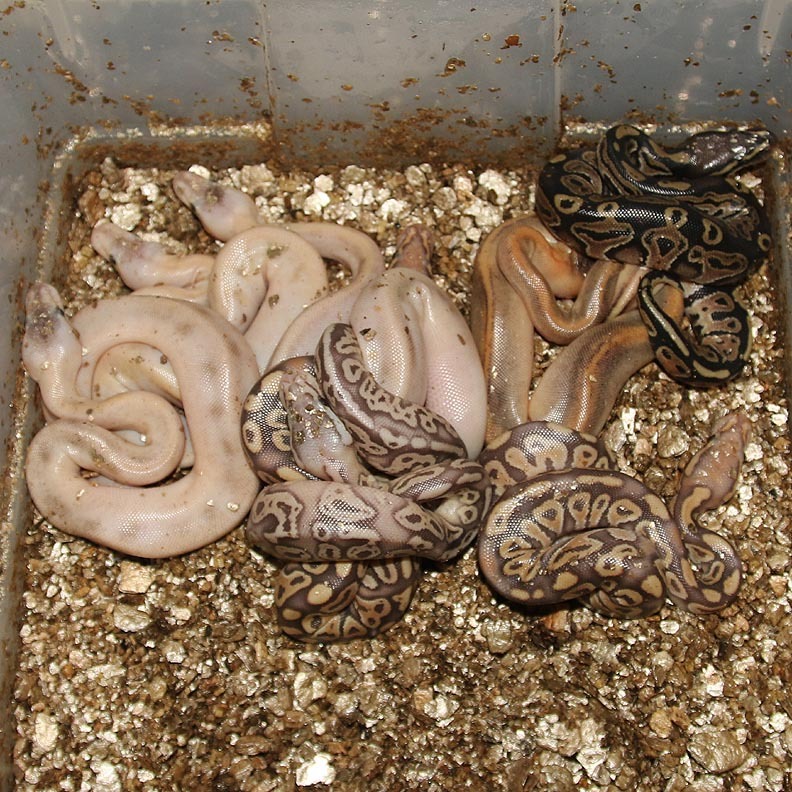 If you are interested in animals from clutch #75 please email or call 519-824-7377. 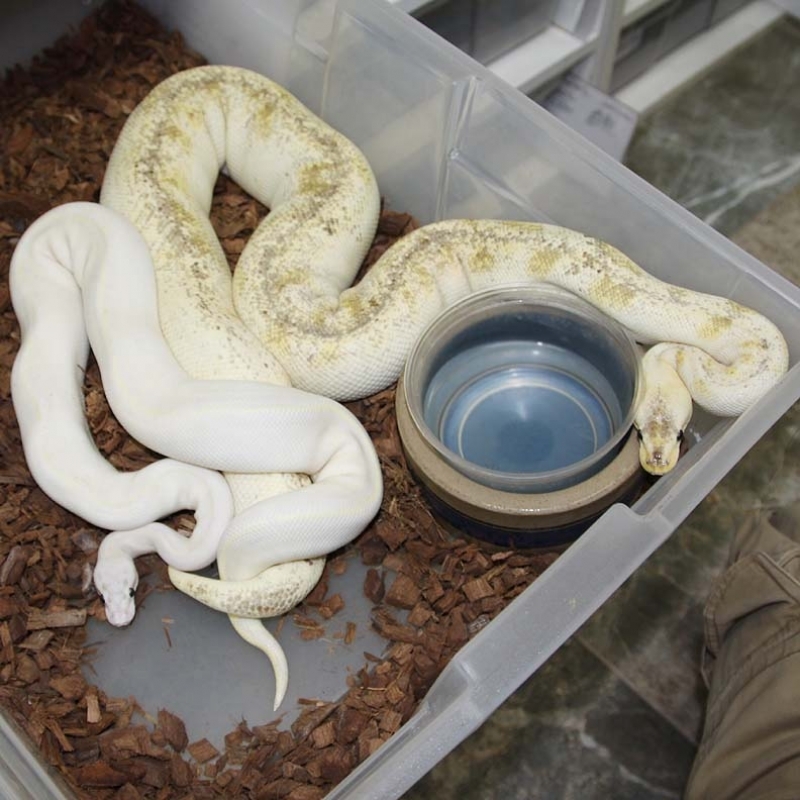 Description: Albino YB 1/12 x Albino "YB" 1/11. 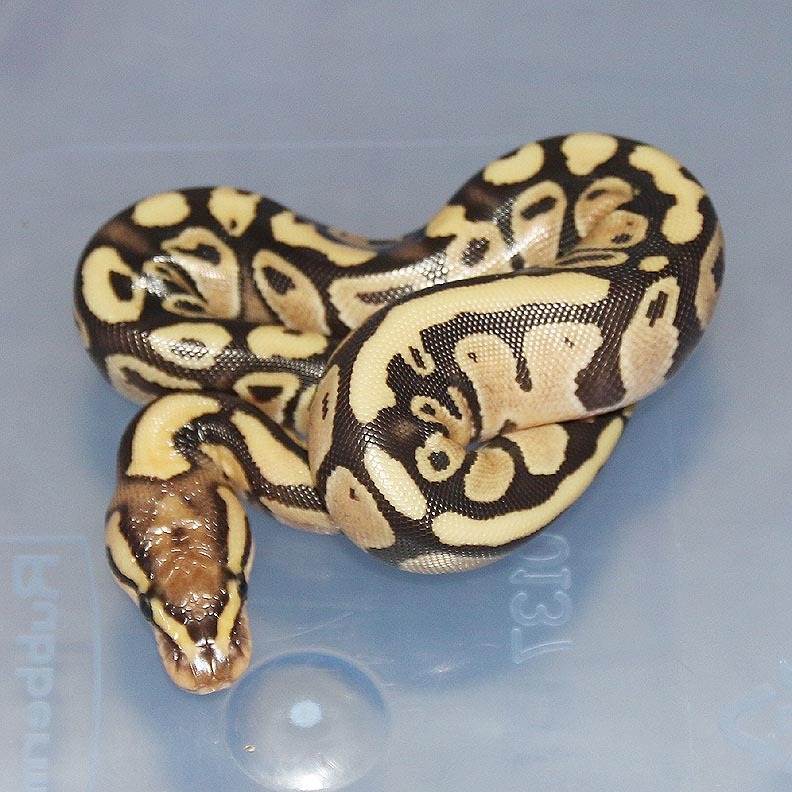 This female was sold to me as a YB but proved last year to not be one. The male YB is a replacement for an Albion YB male that proved out to be just an Albino. 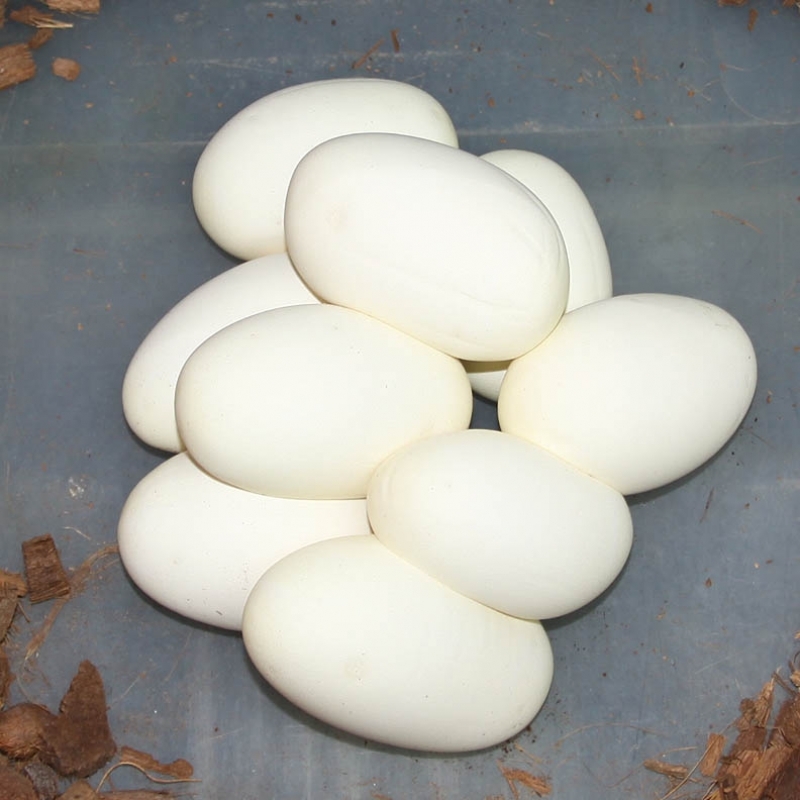 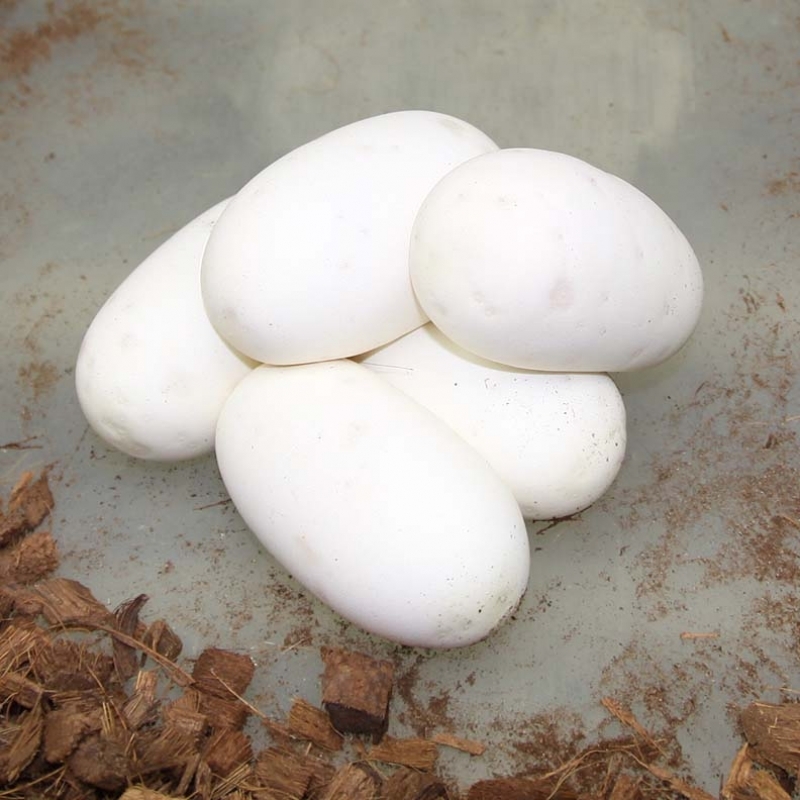 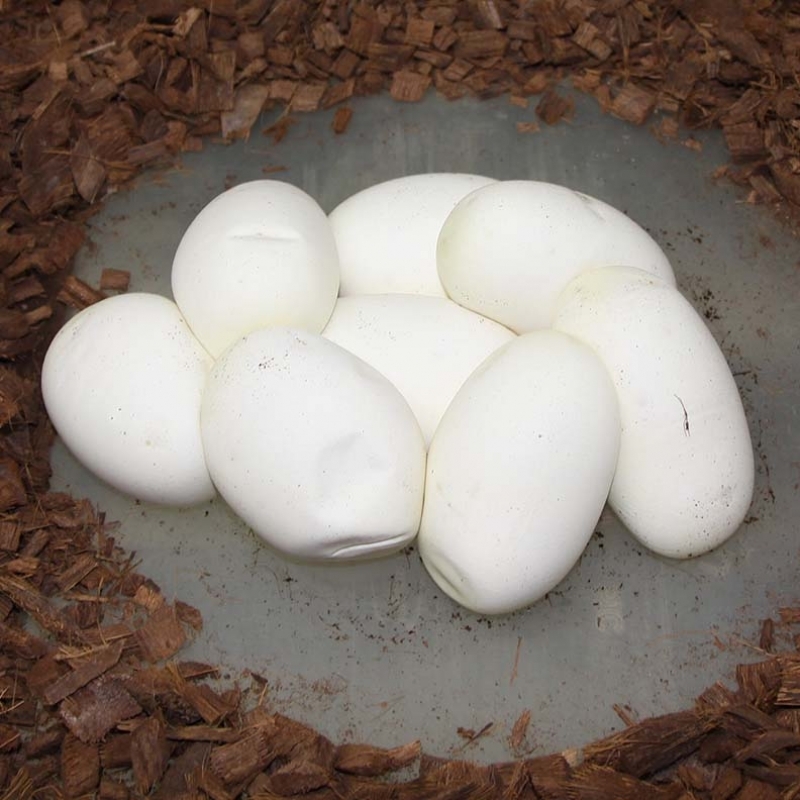 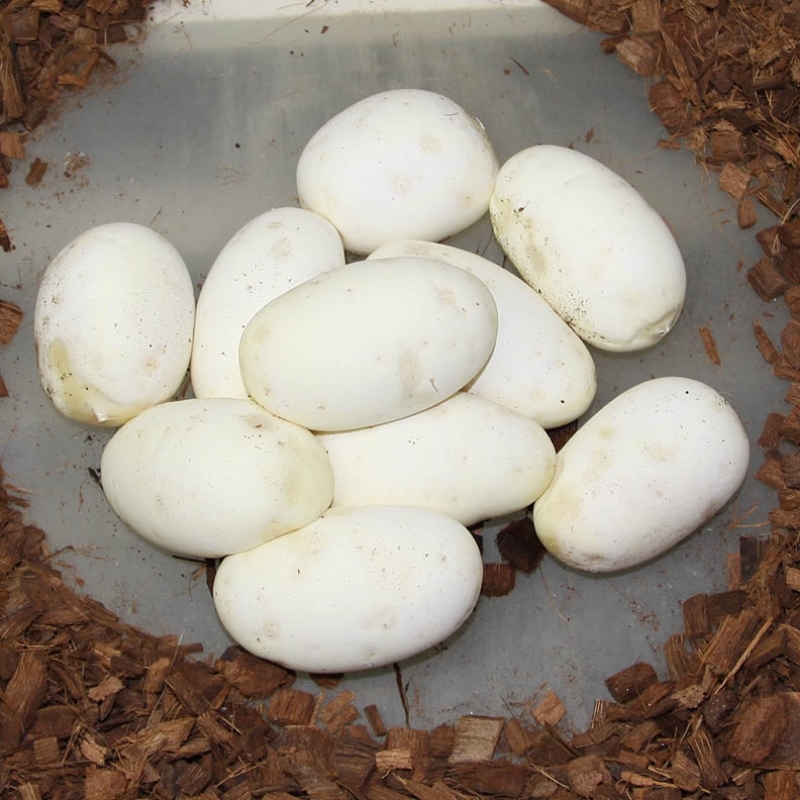 So, this clutch is to just produce more Albino YB's to eventually produce Albino Ivorys, Albino Pumas, Albino Highways....etc. 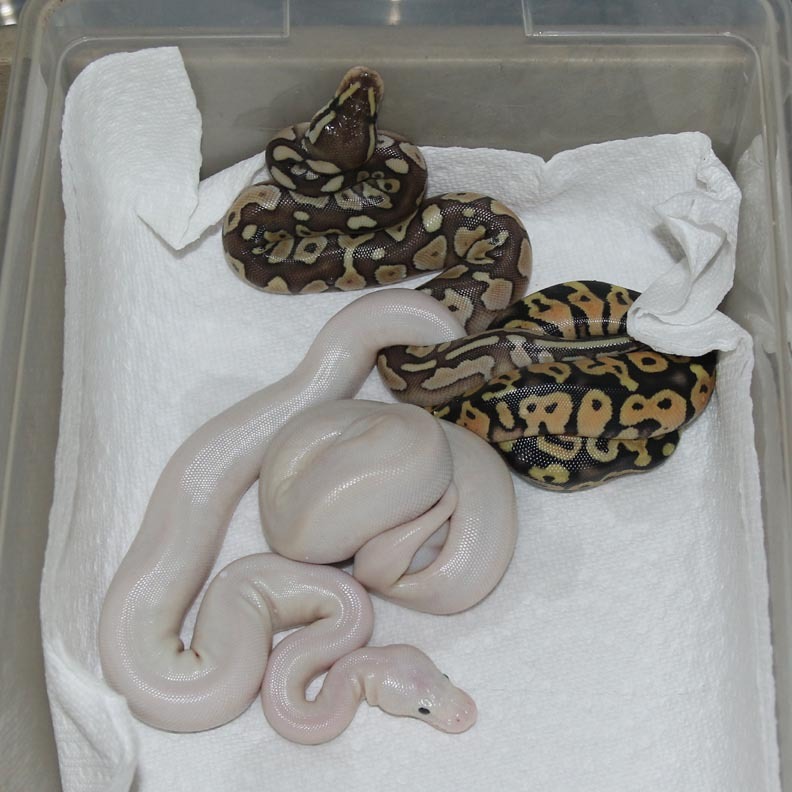 If you are interested in animals from clutch #76 please email or call 519-824-7377. 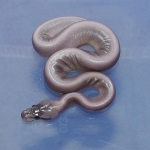 Description: Lesser Ivory 1/12 x Lesser "Burgandy" 1/10. 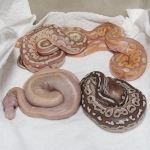 If you are interested in animals from clutch #77 please email or call 519-824-7377. 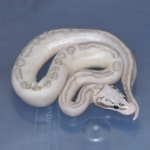 Description: Mutation X Pastel Lesser 1/13 x Mutation X 1/12. 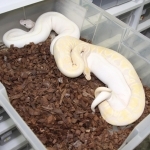 I haven't produced a ton of Mutation X Pastel Lessers. 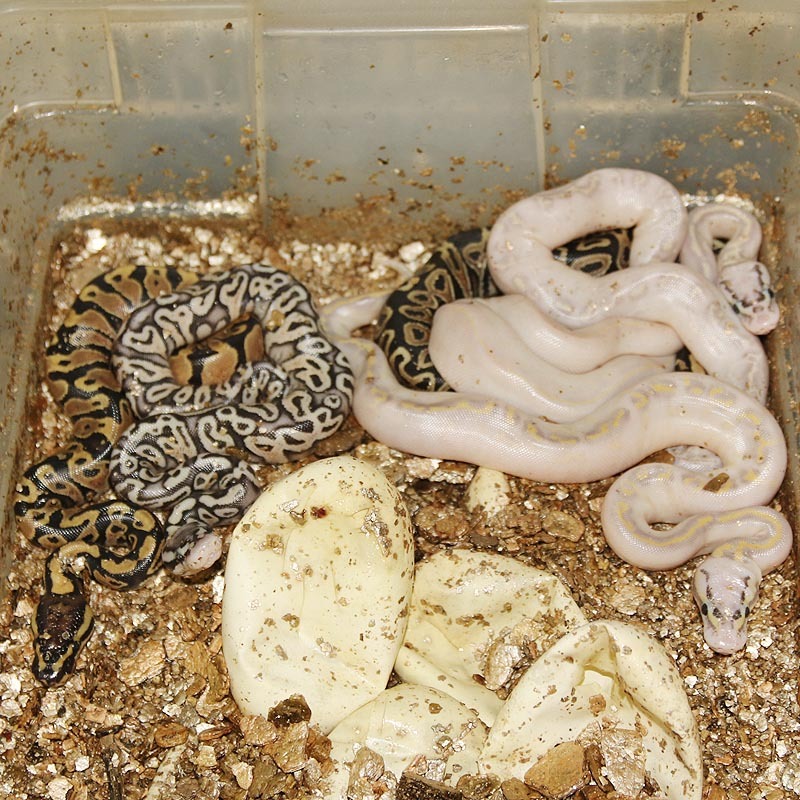 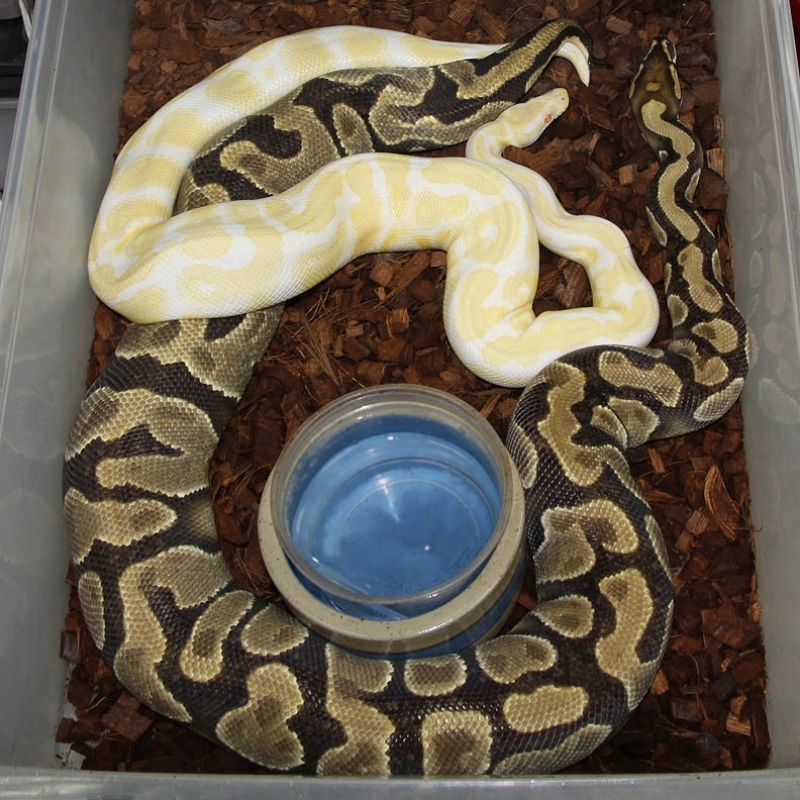 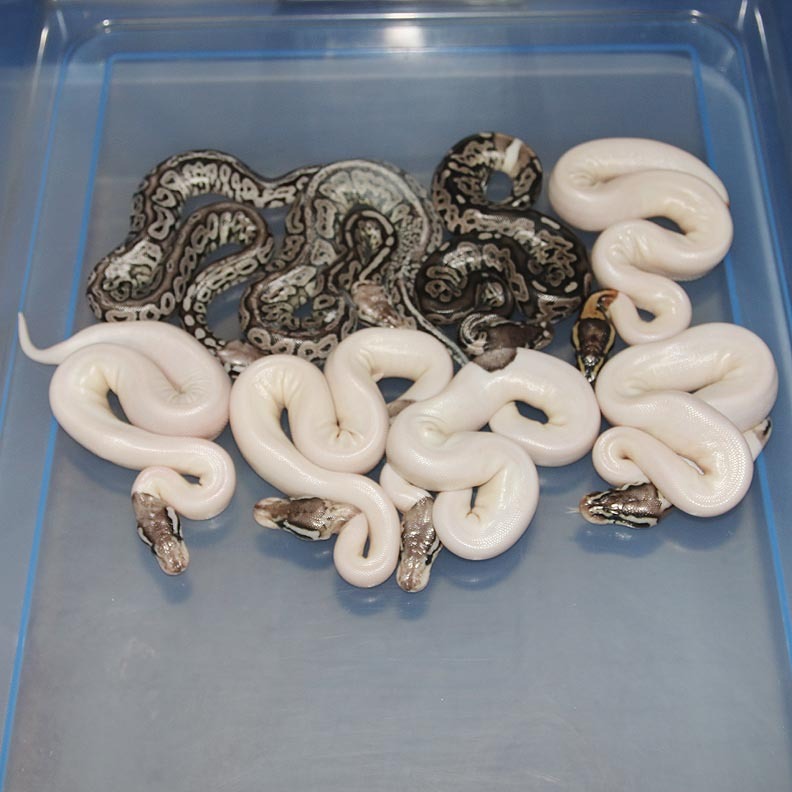 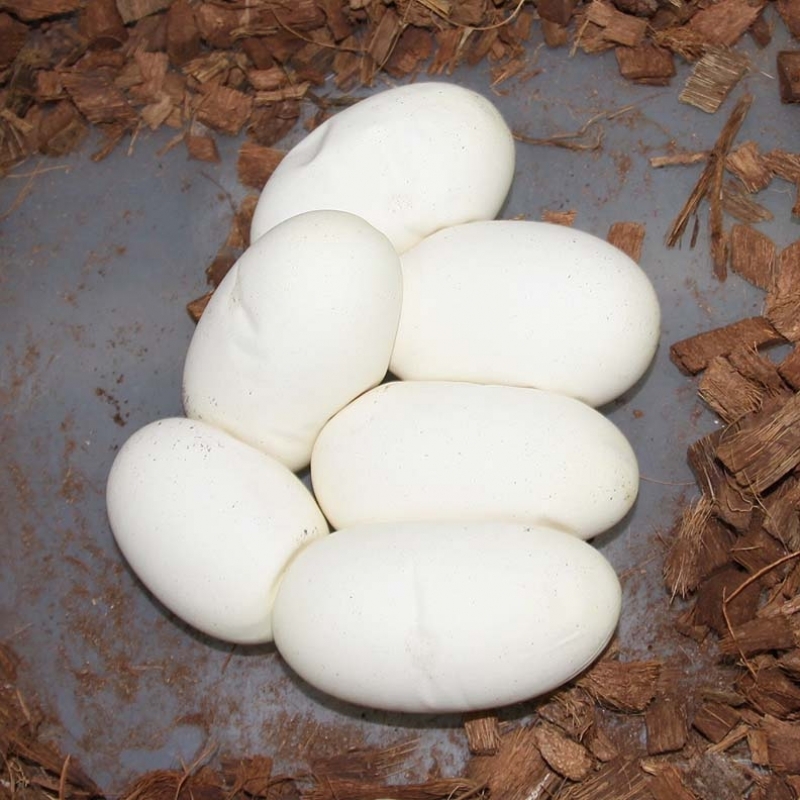 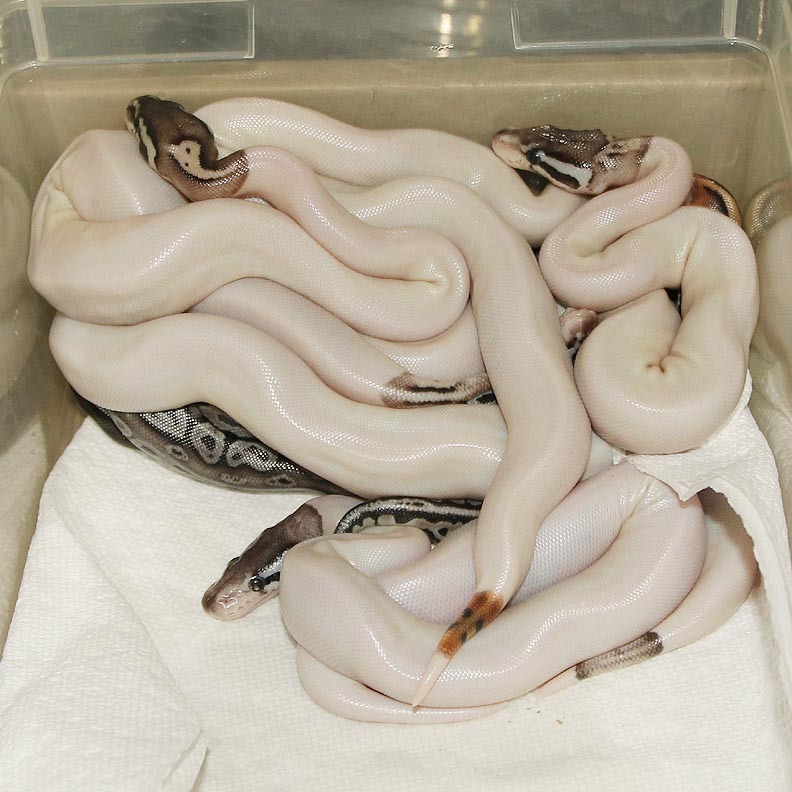 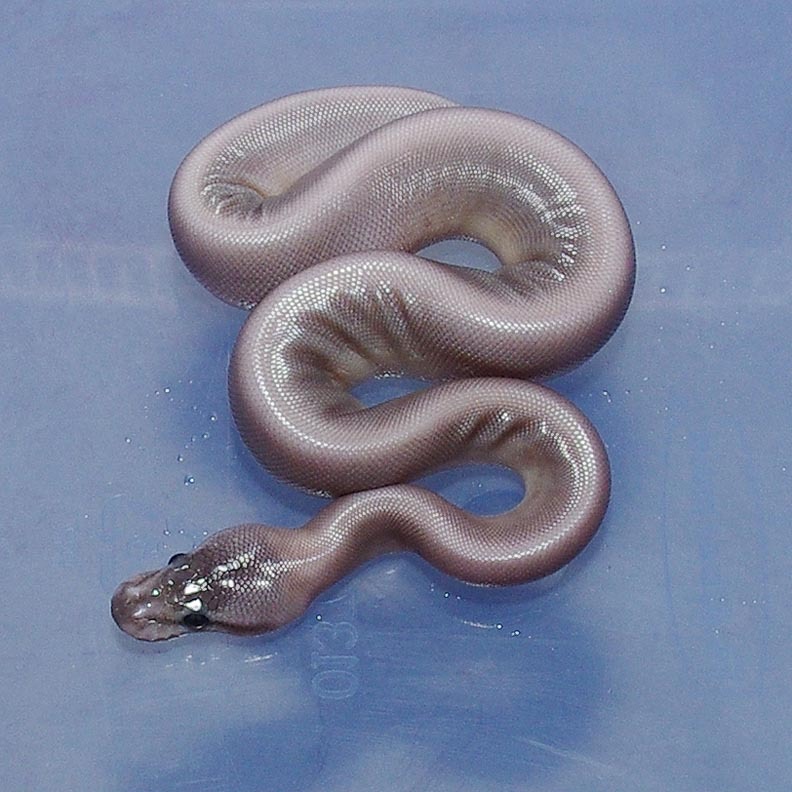 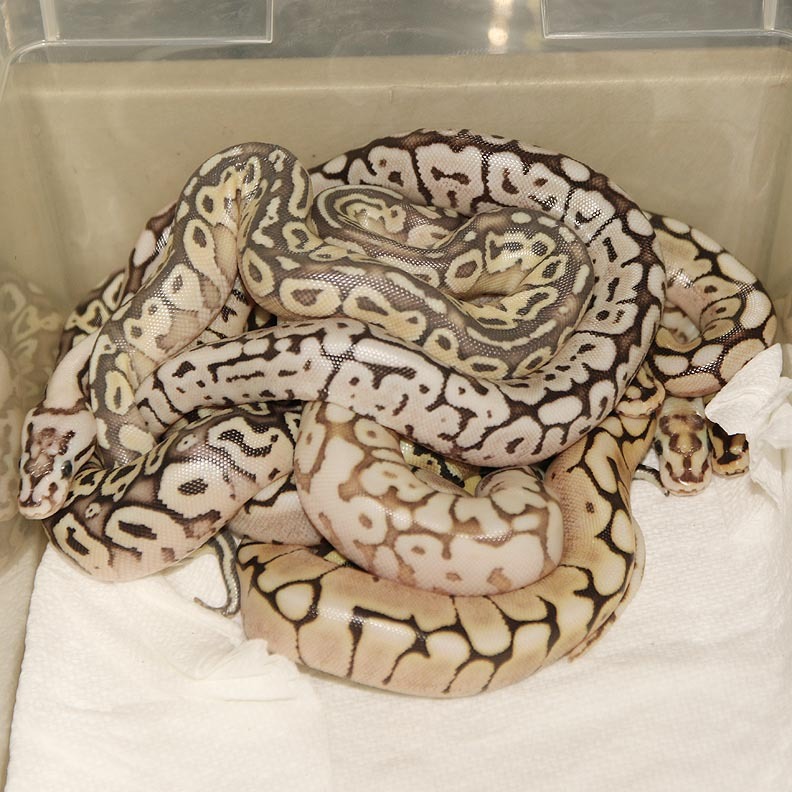 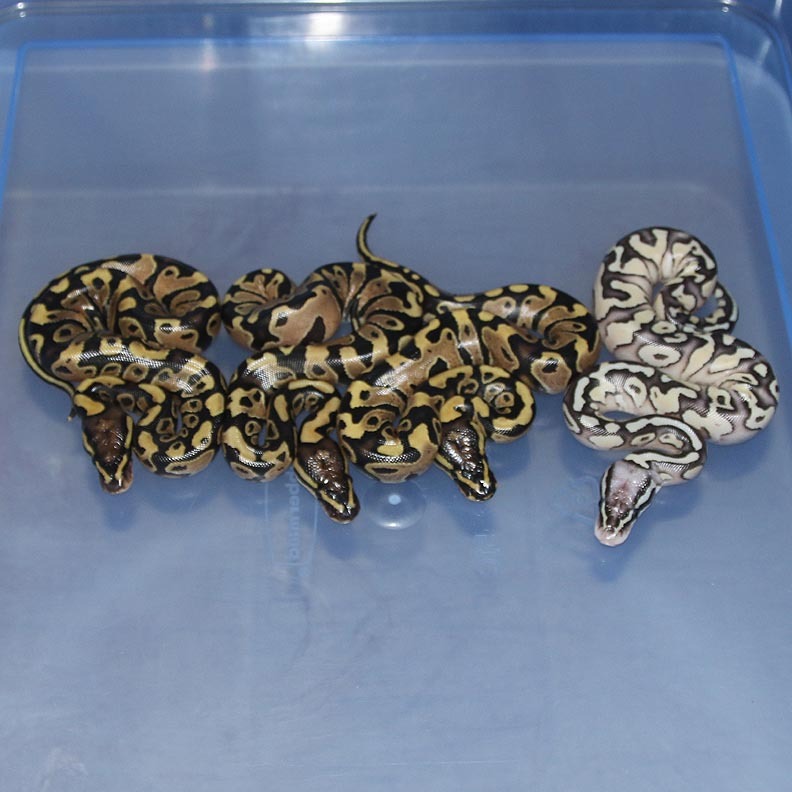 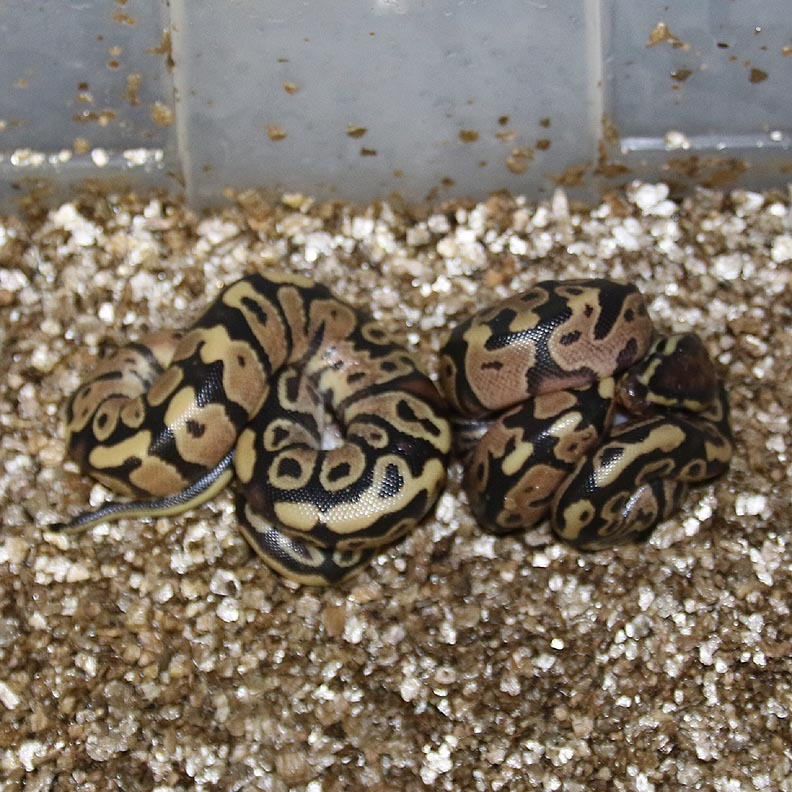 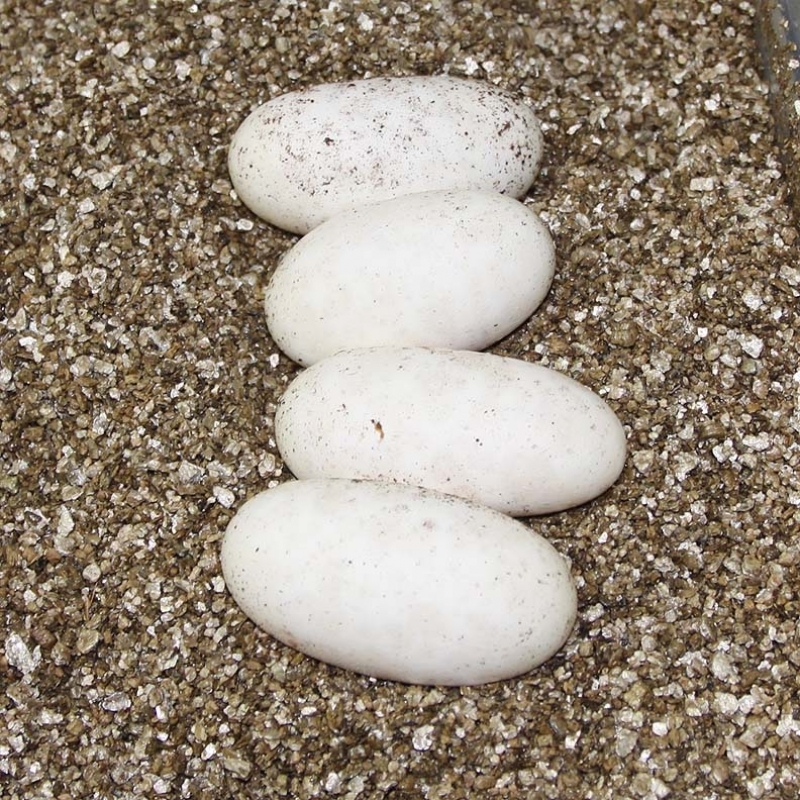 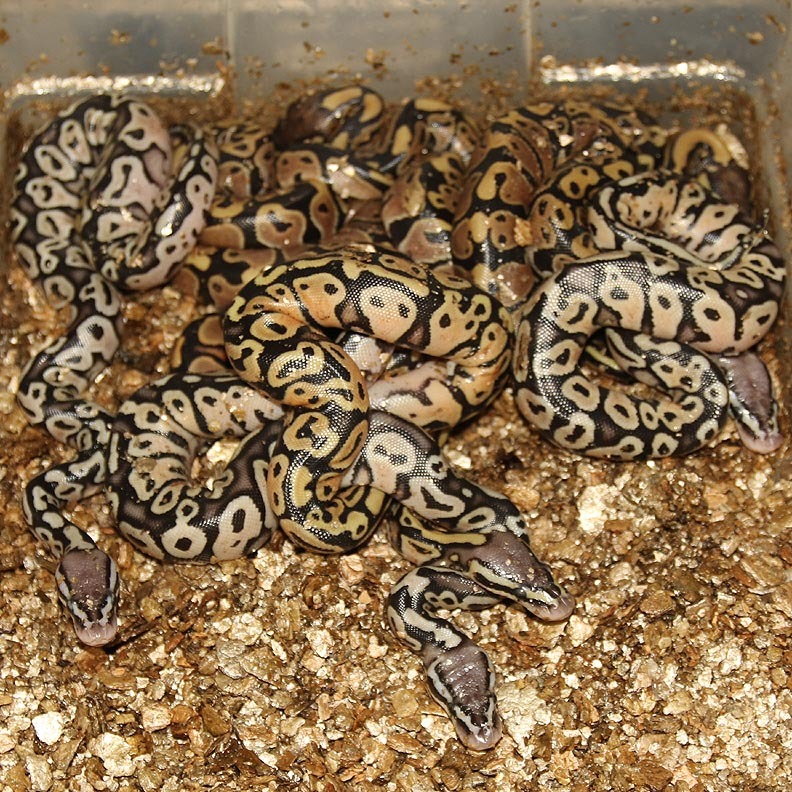 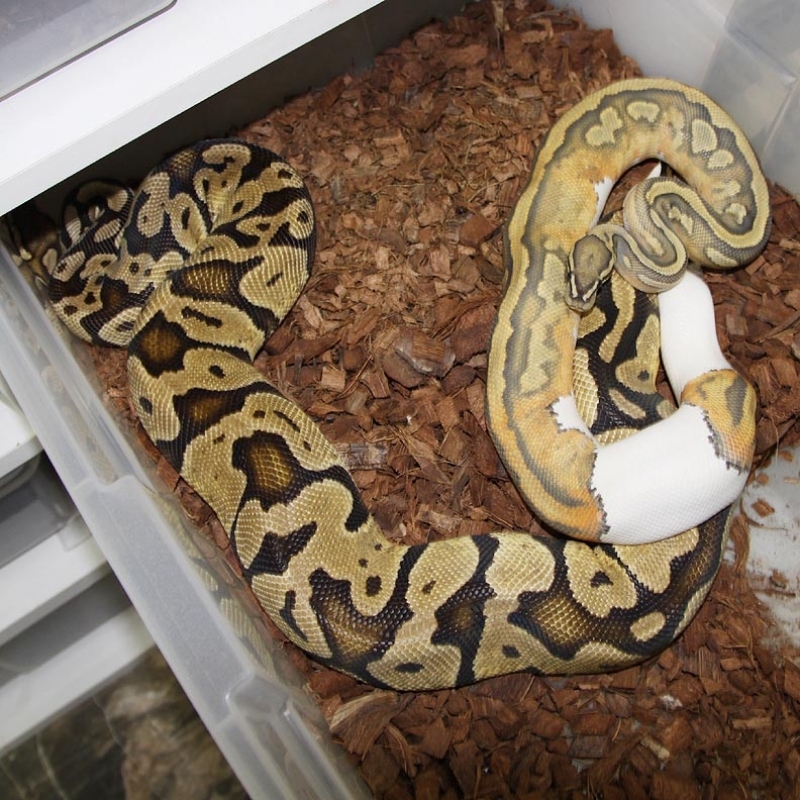 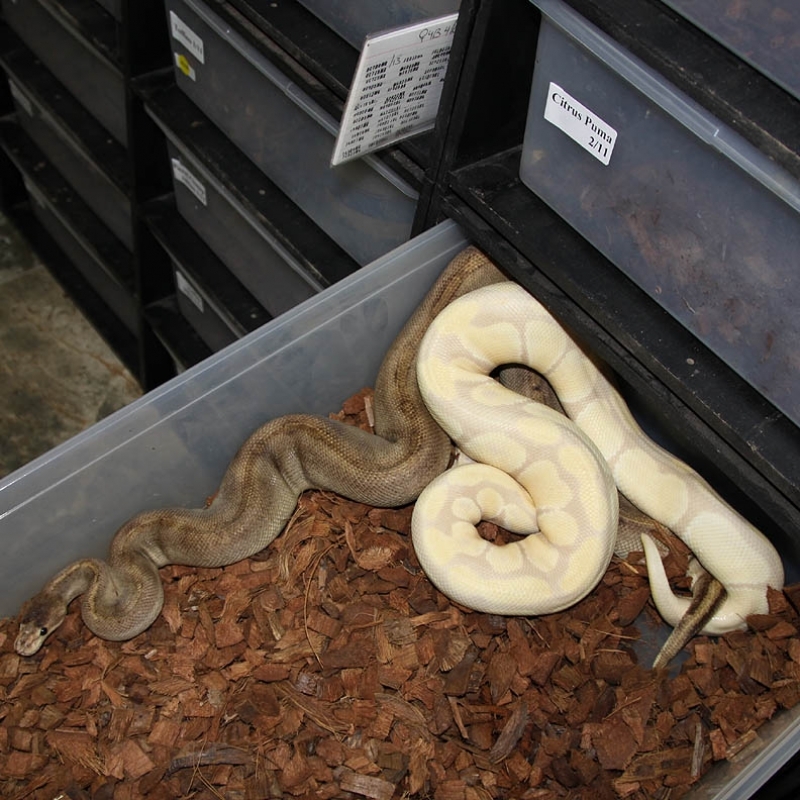 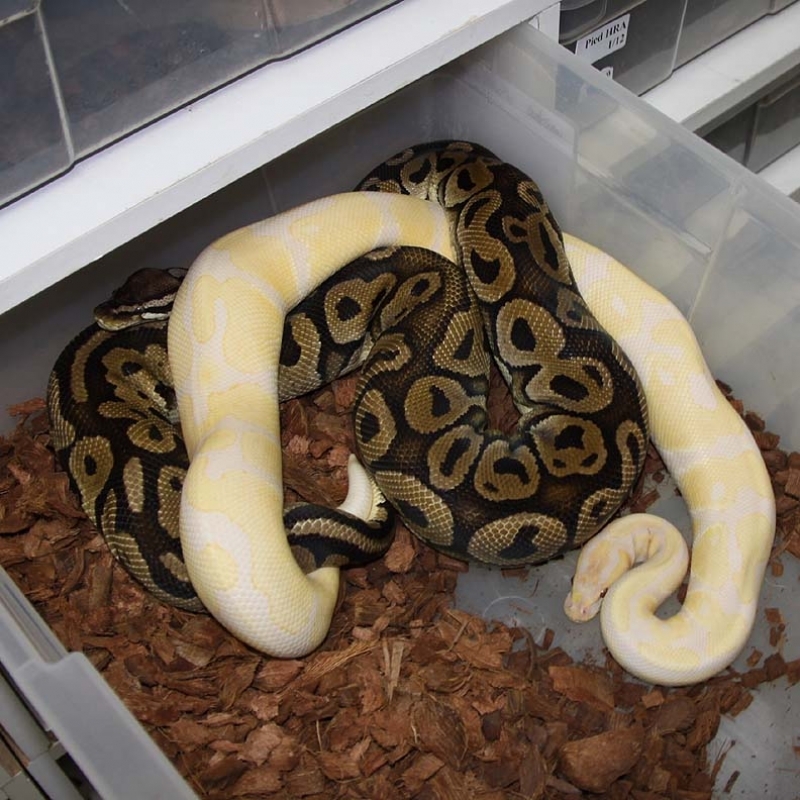 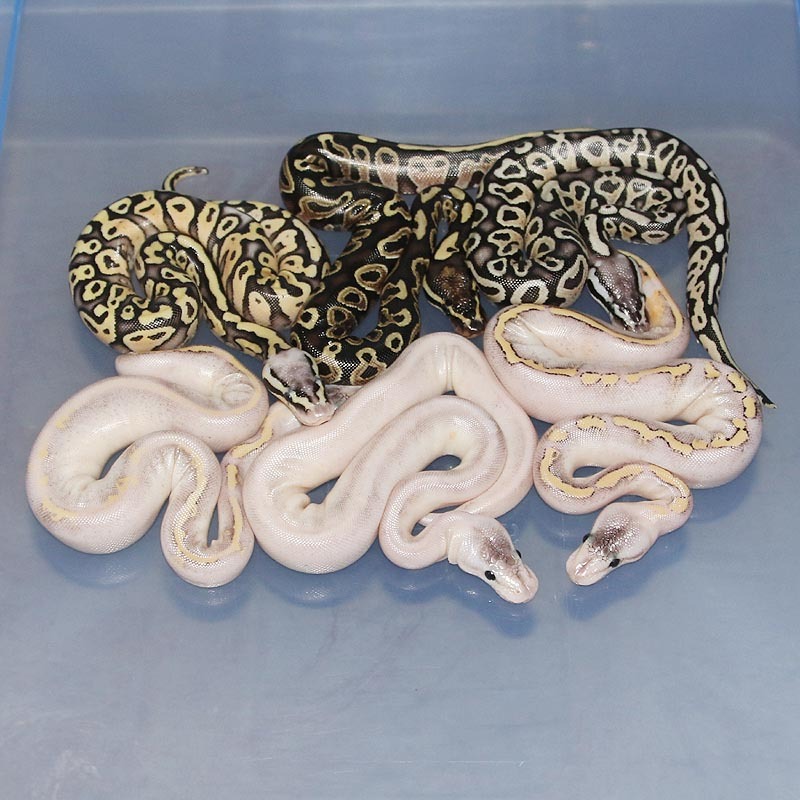 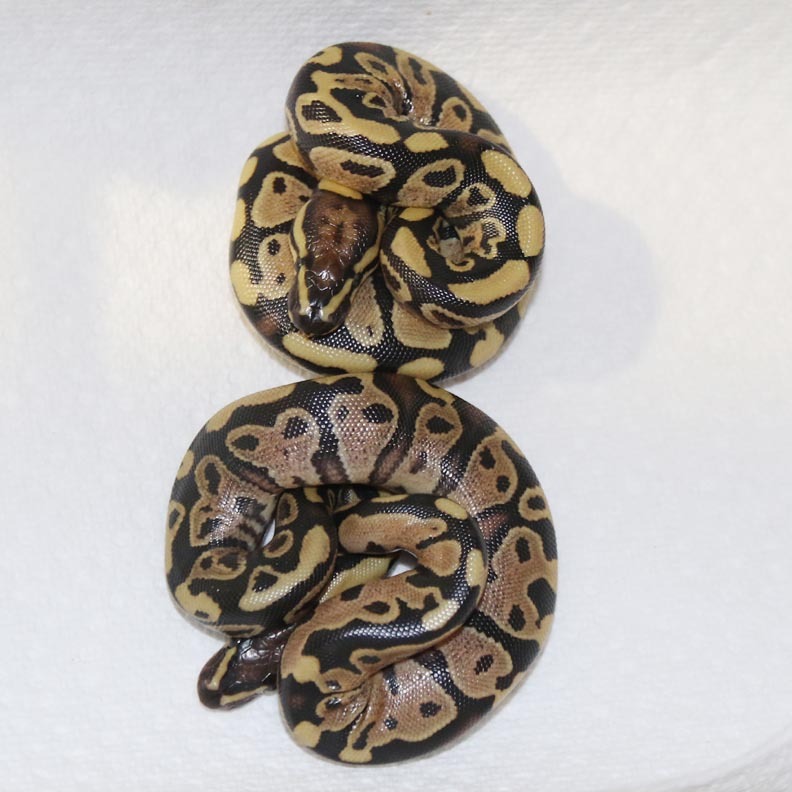 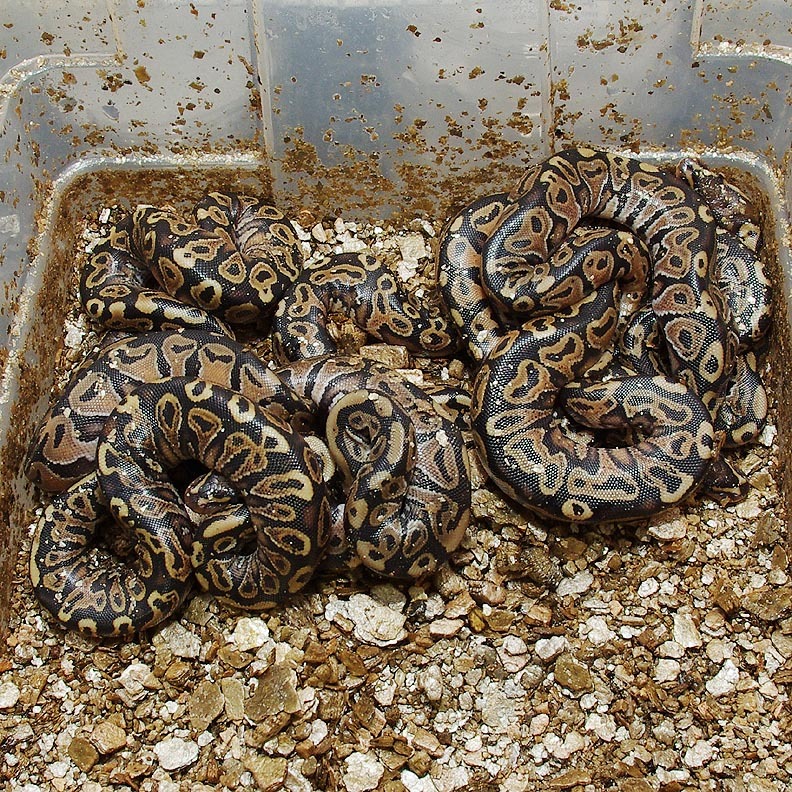 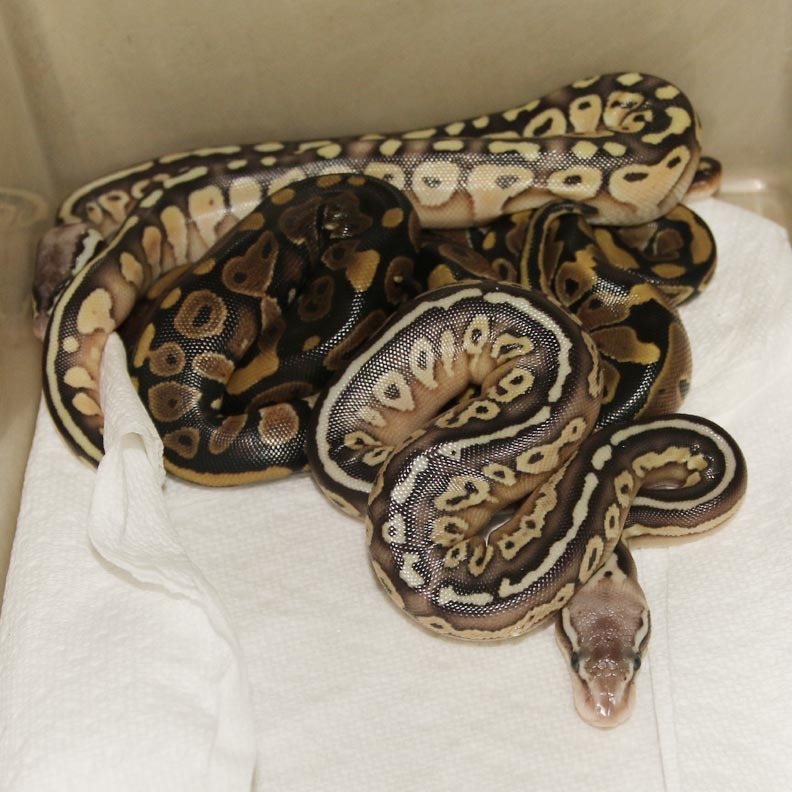 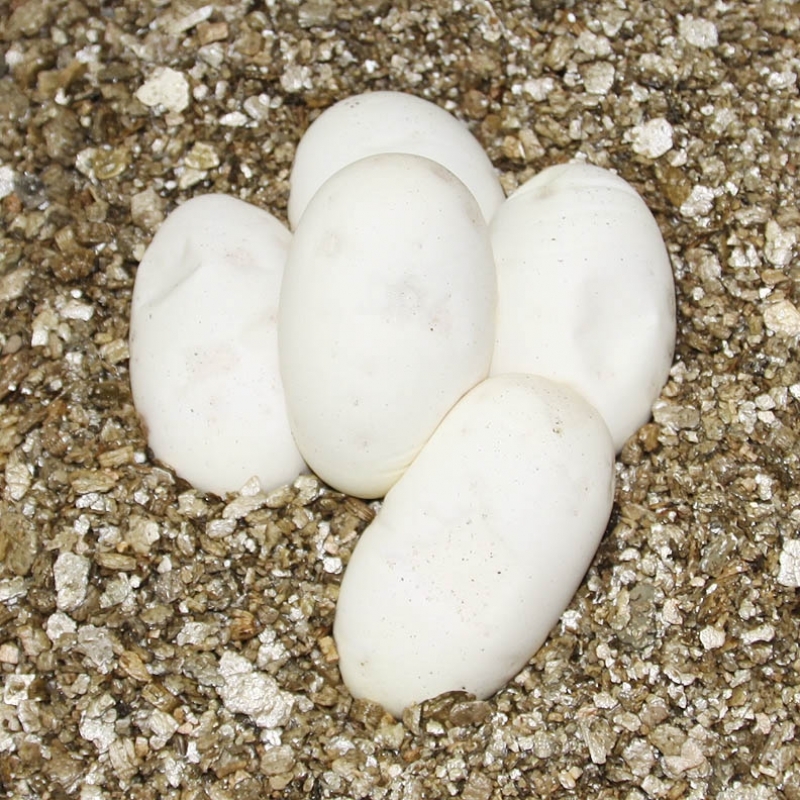 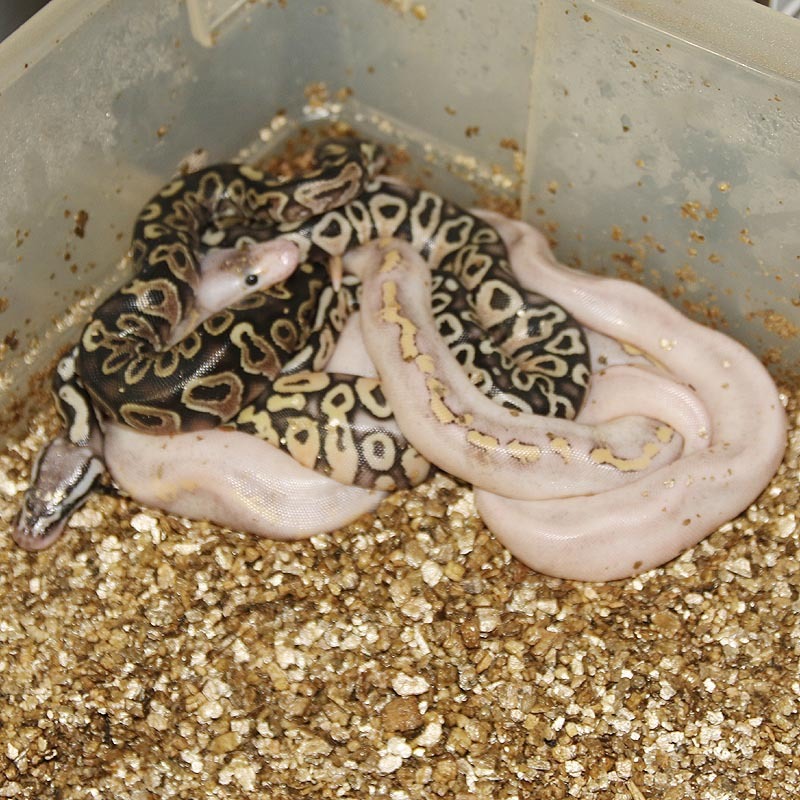 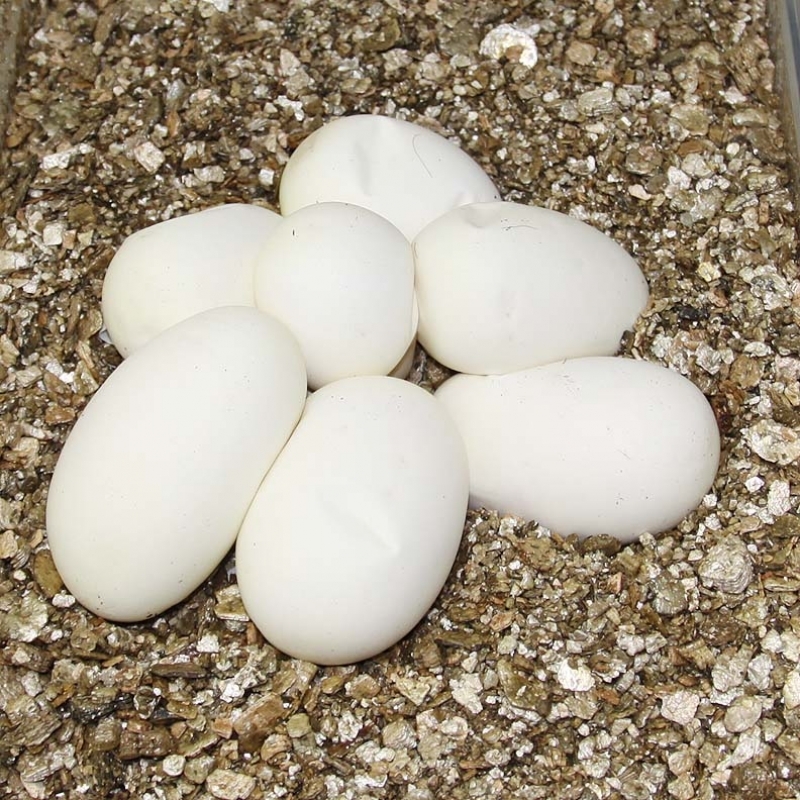 However, there are 2 really light ones in the clutch and then a Mutation X Pastel Lesser. 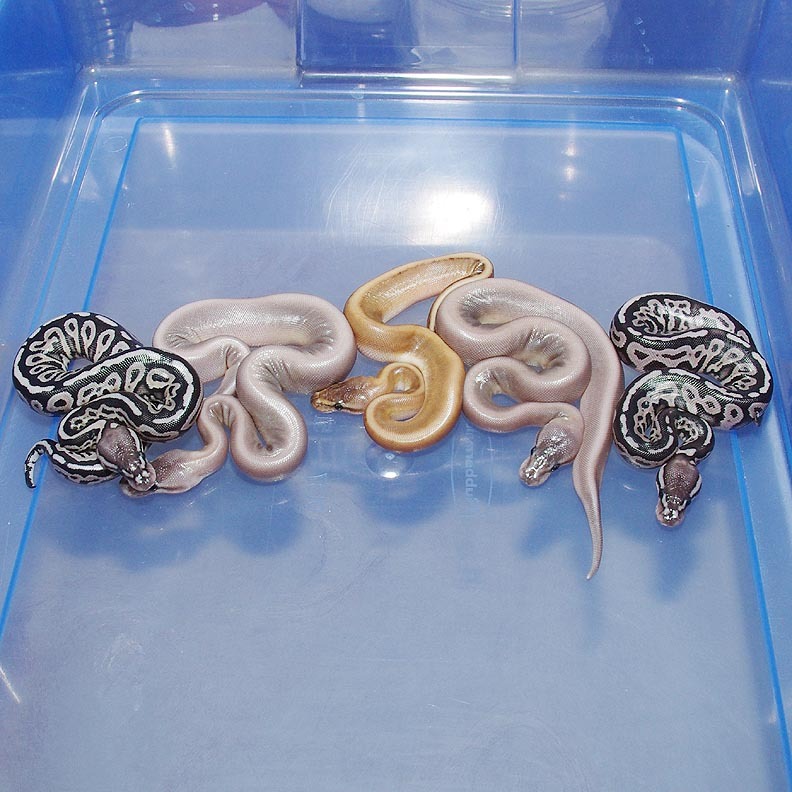 Could these be the Super Mutation X???? 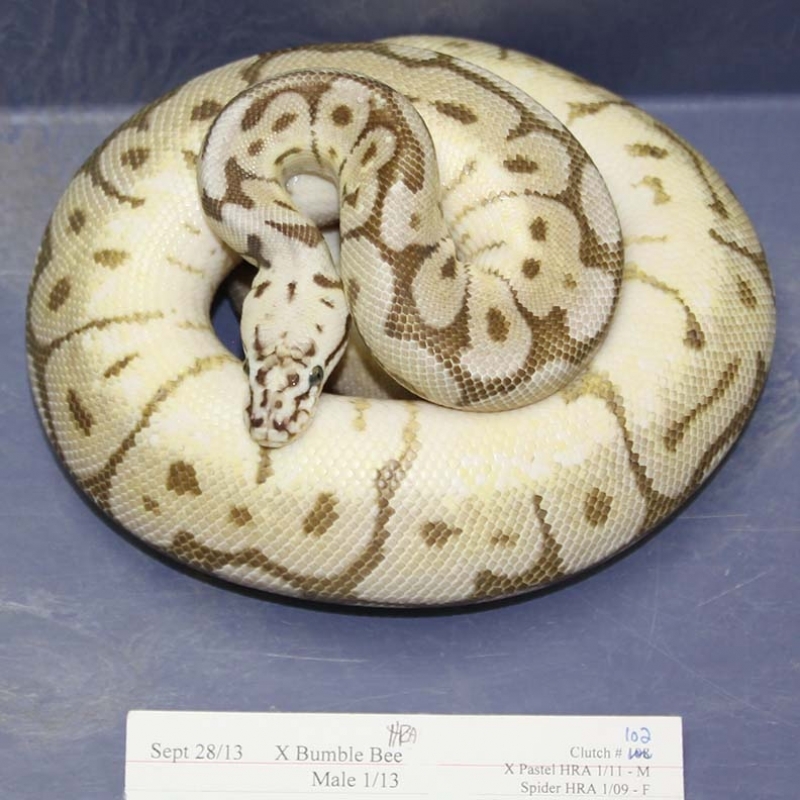 The next clutch of X x X should help me figure that out. It is very possible that the Super Mutation X is a lighter version of the Mutation X. 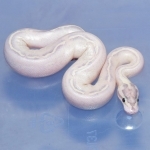 Such as Super Pastels are a lighter version of the Pastel....etc. If you are interested in animals from clutch #78 please email or call 519-824-7377. Description: Citrus Puma 1/11 x HY YB 2/09. 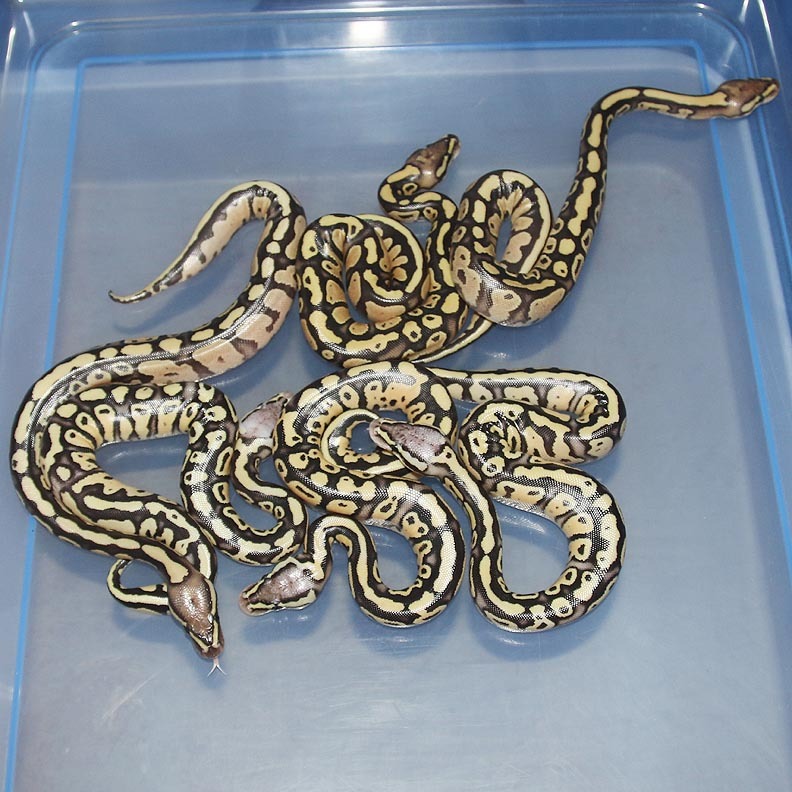 If you are interested in animals from clutch #79 please email or call 519-824-7377. 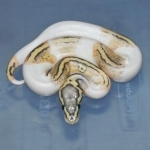 Description: Toffino 1/11 x Pin Champ Het Albino 2/10. 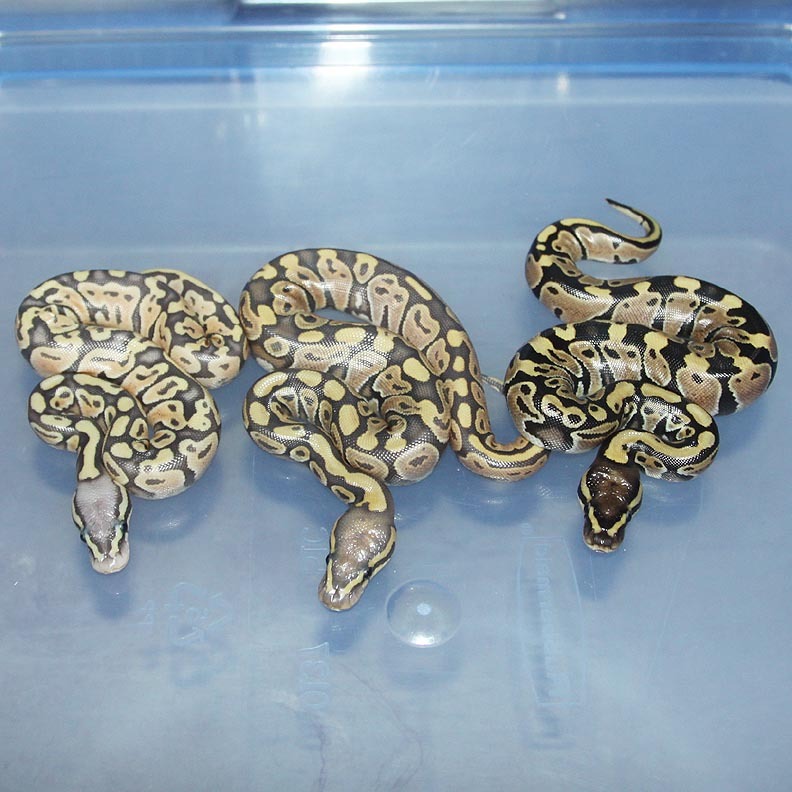 If you are interested in animals from clutch #80 please email or call 519-824-7377. Description: Pastel Lesser YB Het Green Ghost 1/13 x Green Ghost 1/08. If you are interested in animals from clutch #81 please email or call 519-824-7377. 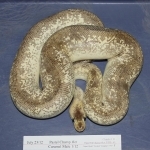 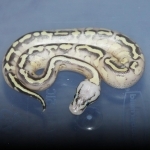 Description: Pin Champagne Het RA Het Pied 1/13 x Het RA Het Pied 13/10. 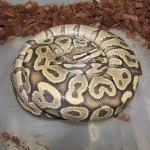 If you are interested in animals from clutch #82 please email or call 519-824-7377. 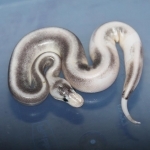 Description: Lavender Het Pied 1/12 x Pastel Het Pied 2/11. 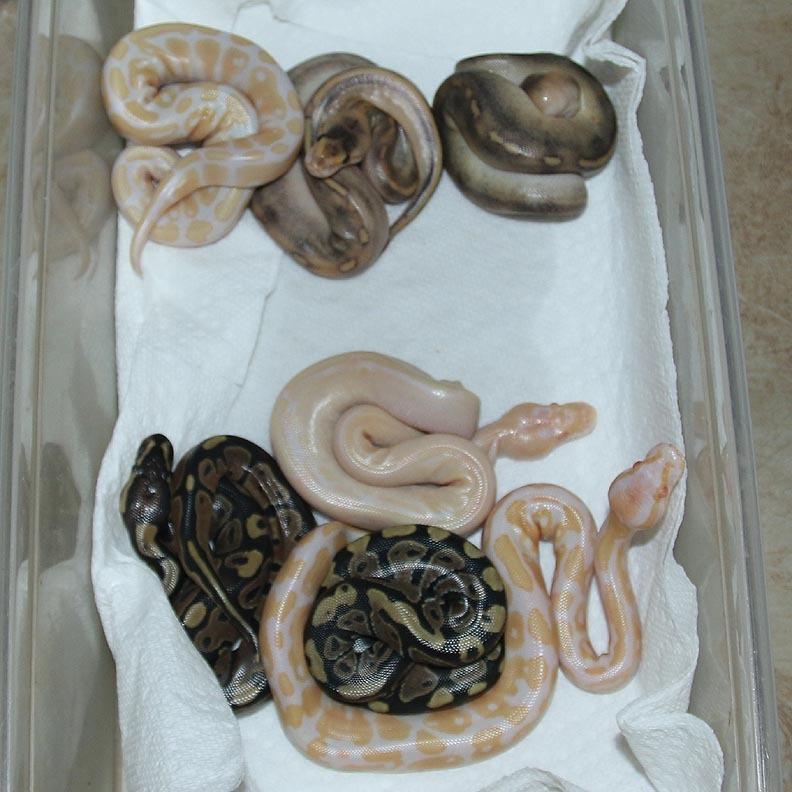 If you are interested in animals from clutch #83 please email or call 519-824-7377. Description: Pastel Mahogany 1/13 x Lesser Het Burgandy 1/06. 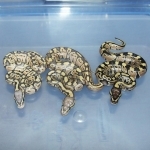 If you are interested in animals from clutch #84 please email or call 519-824-7377. 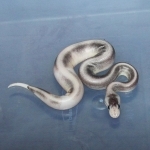 Description: Pin Champ Het RA Het Pied 1/13 x Het RA Het Pied 14/10. 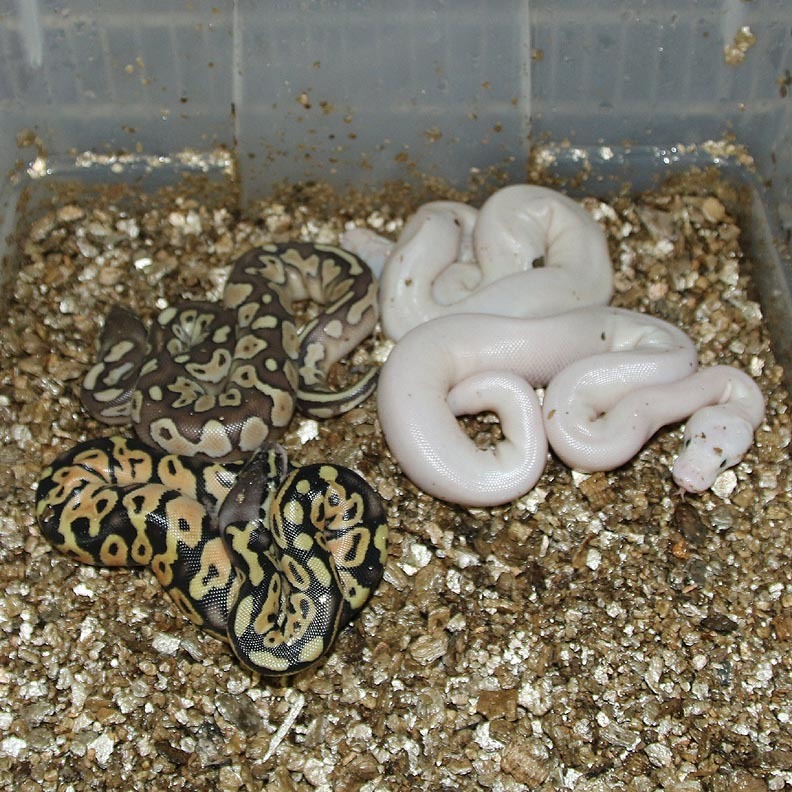 Also, the regular Pieds in this clutch are really low white! 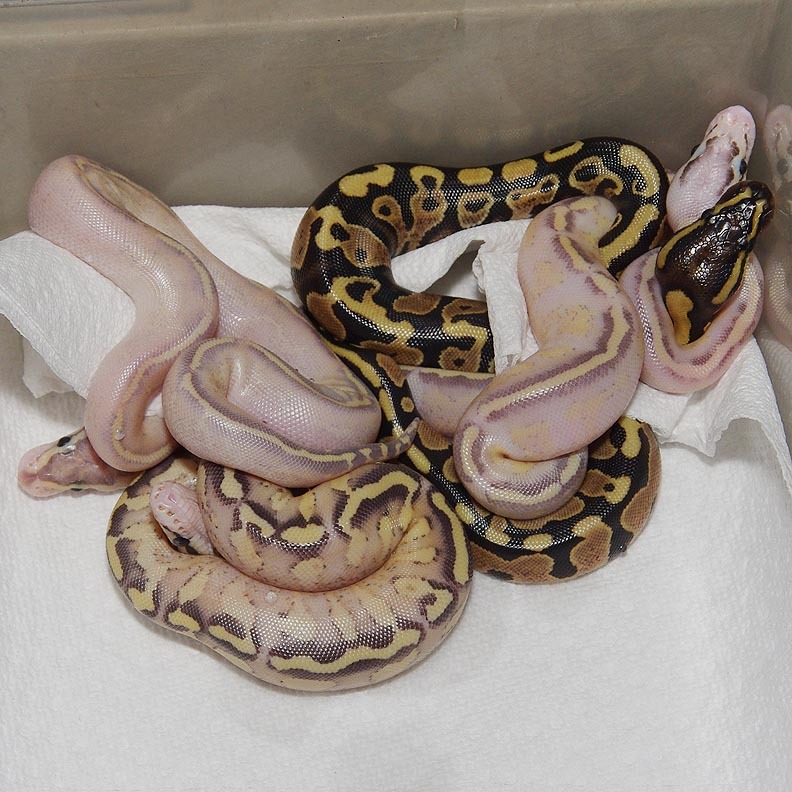 I don't produce a lot of low white pieds so it's neat to have a couple hatch out. 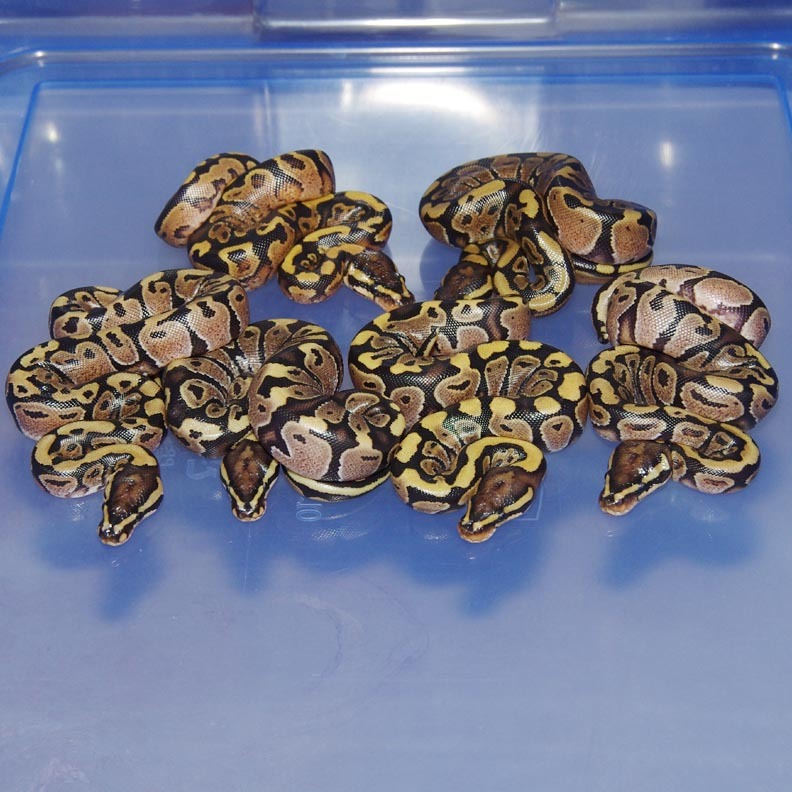 If you are interested in animals from clutch #85 please email or call 519-824-7377. 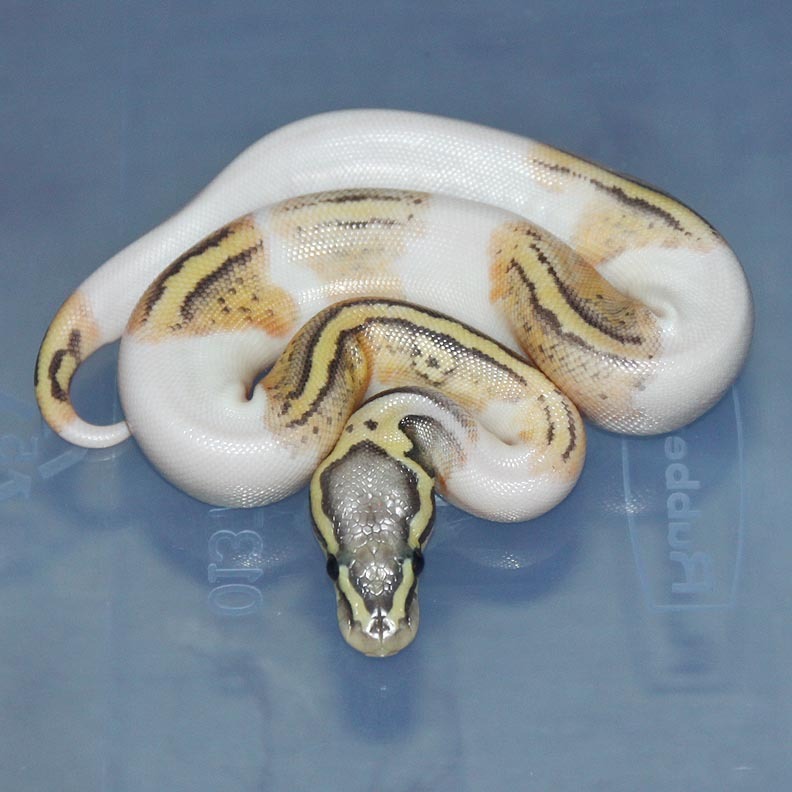 Description: Gold Stripe Het RA PH Pied 2/13 x King Pin 1/10. 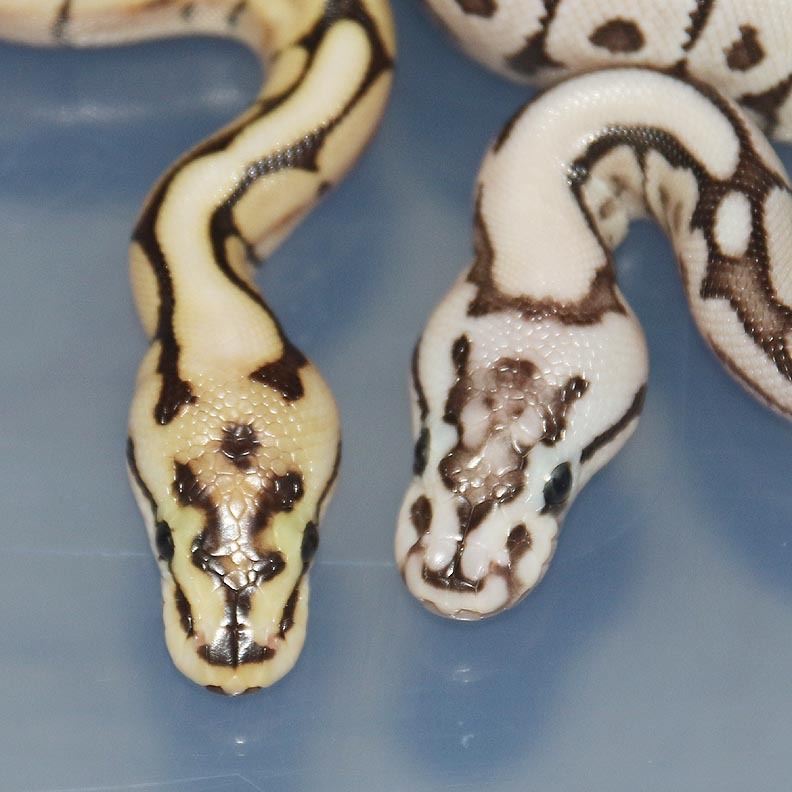 Not saying the Gold Stripe is genetic. 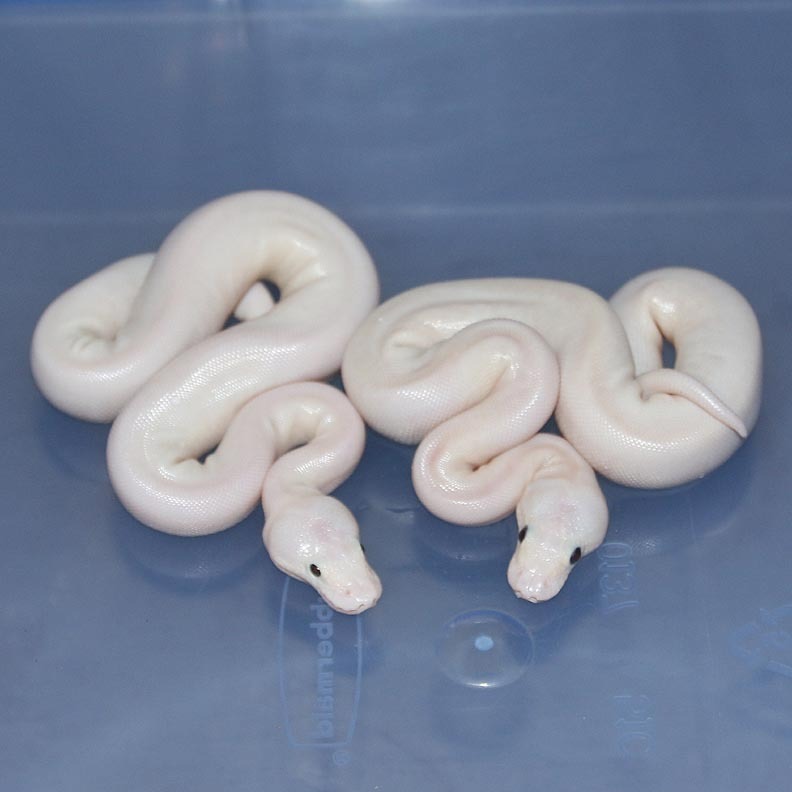 But, if it was these would be hets. 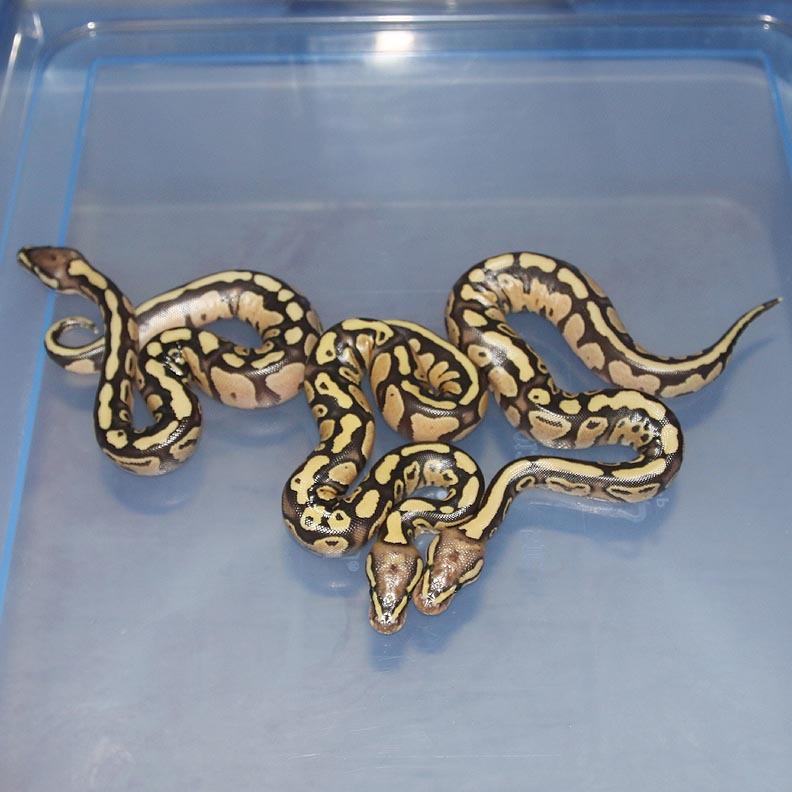 If you are interested in animals from clutch #86 please email or call 519-824-7377. 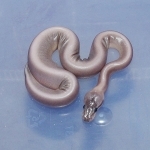 Description: Lesser Chocolate 1/12 x Chocolate 3/11. I won't have a lot of Super Chocolates this year. 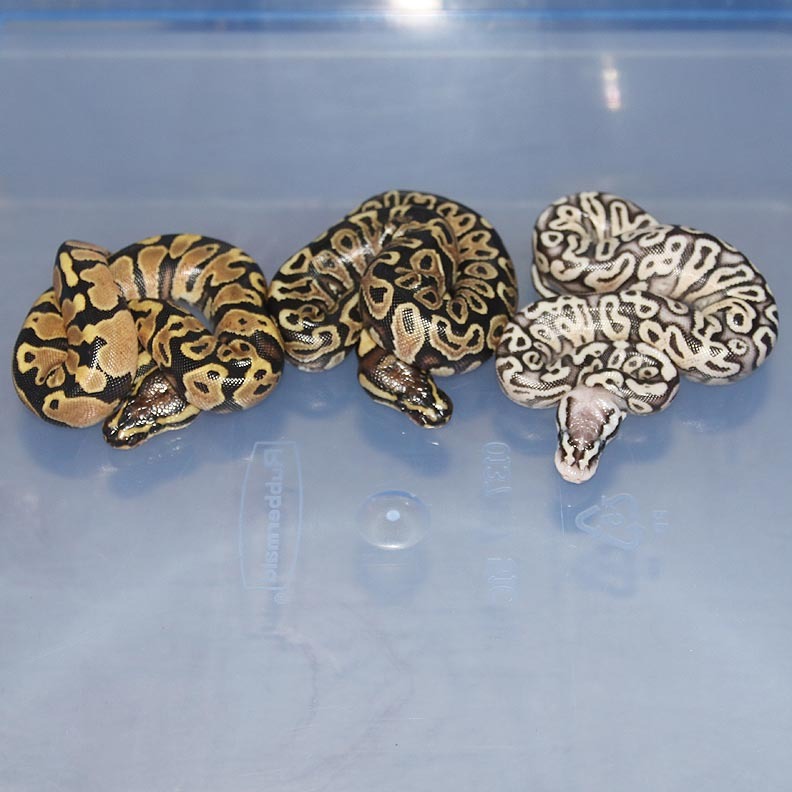 These guys are really awesome in person!! 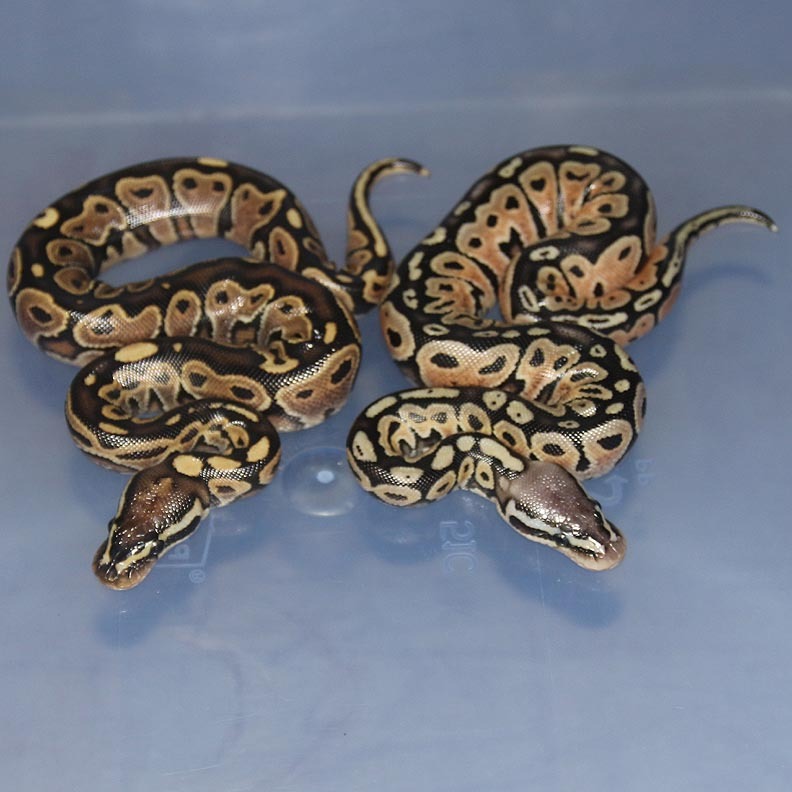 If you are interested in animals from clutch #87 please email or call 519-824-7377. 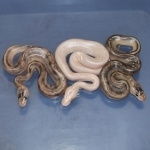 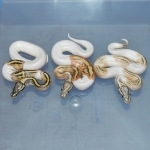 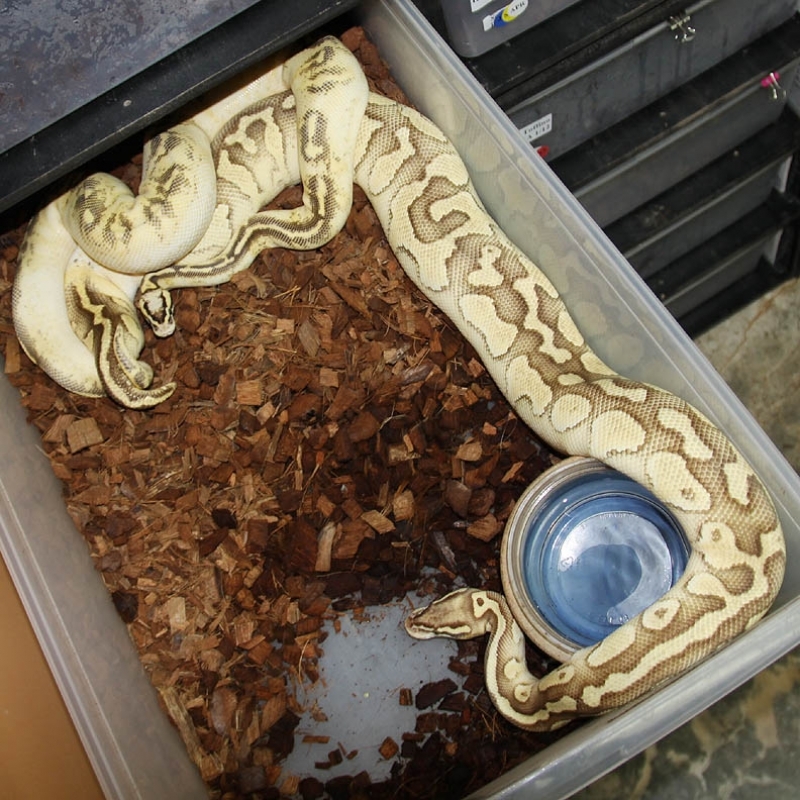 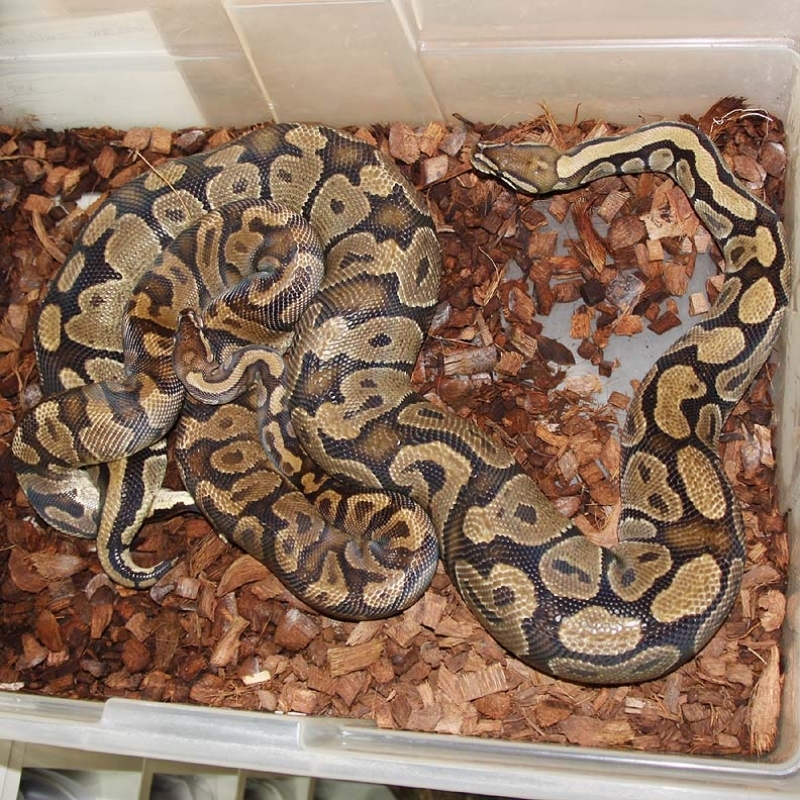 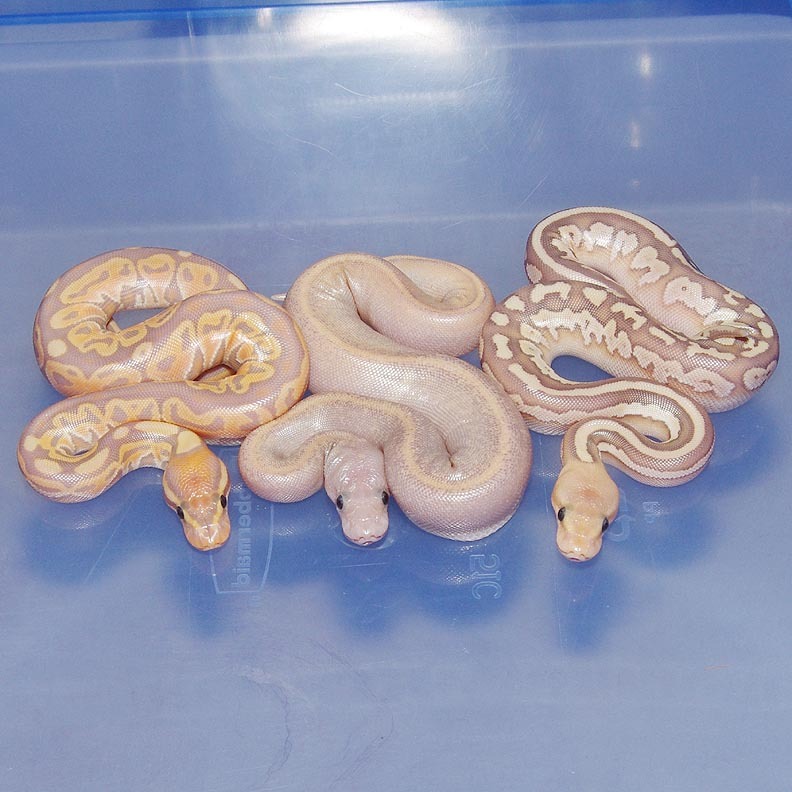 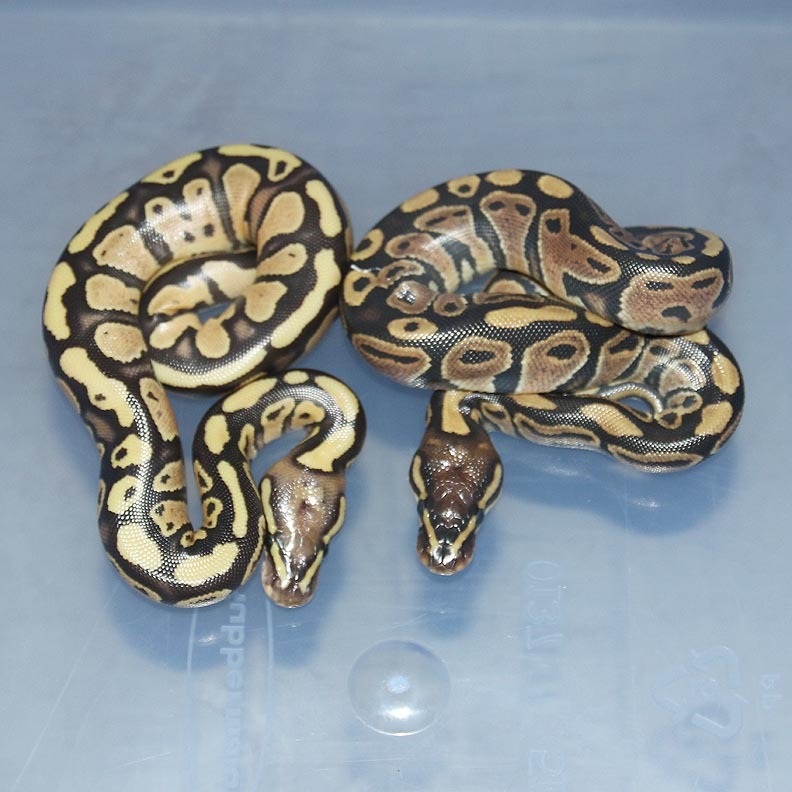 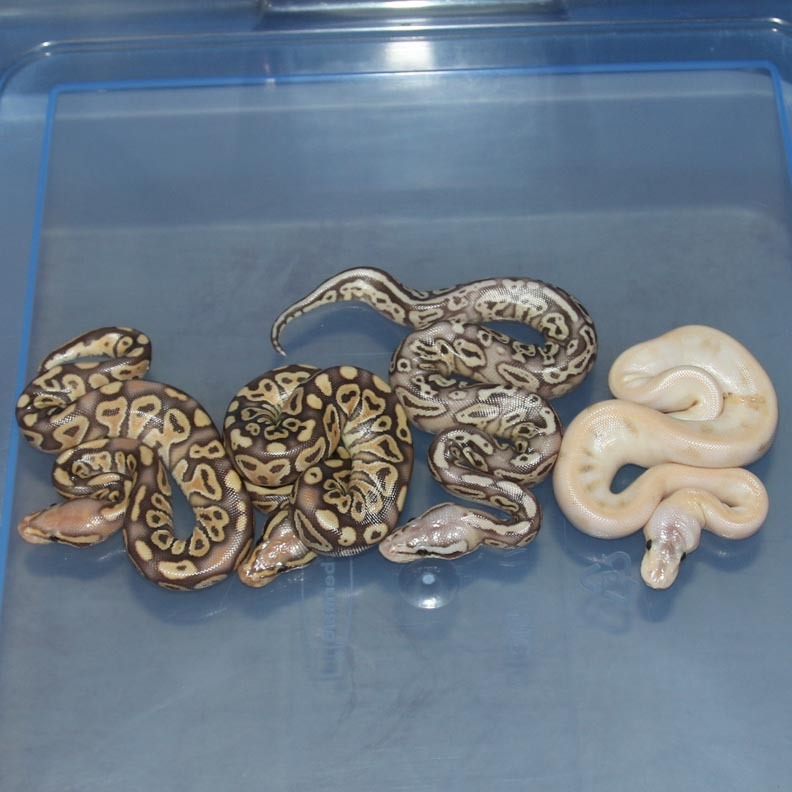 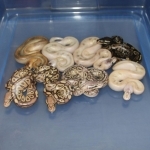 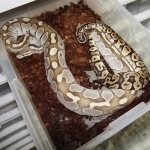 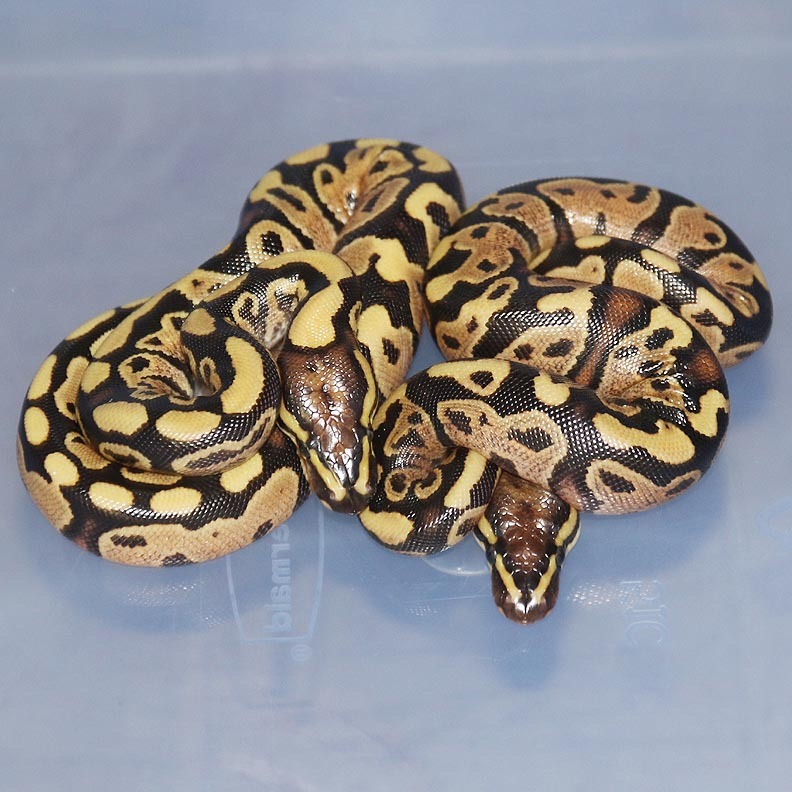 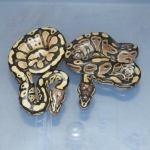 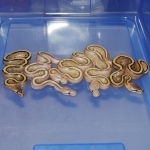 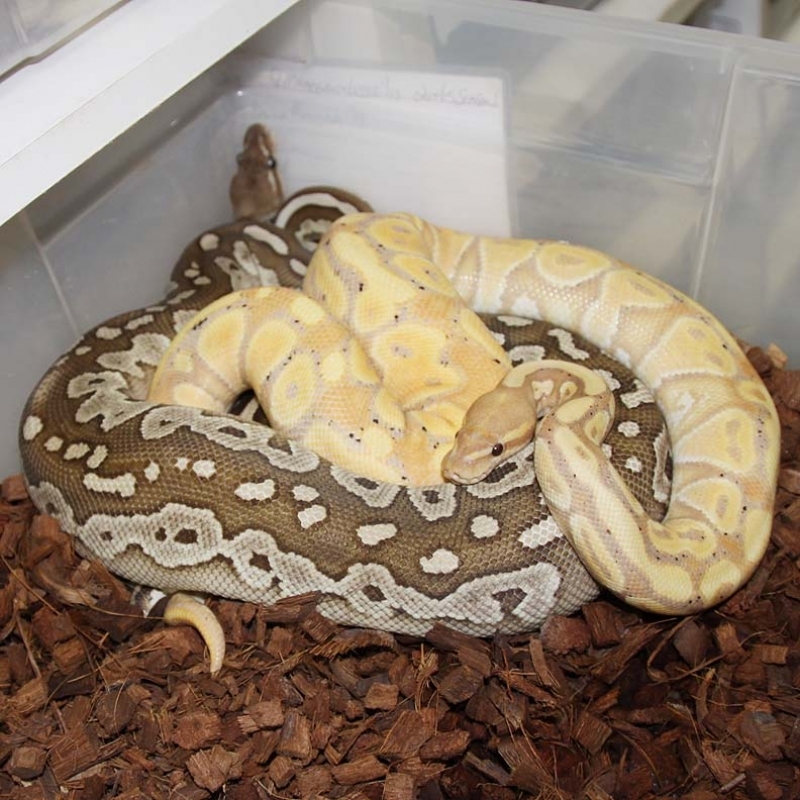 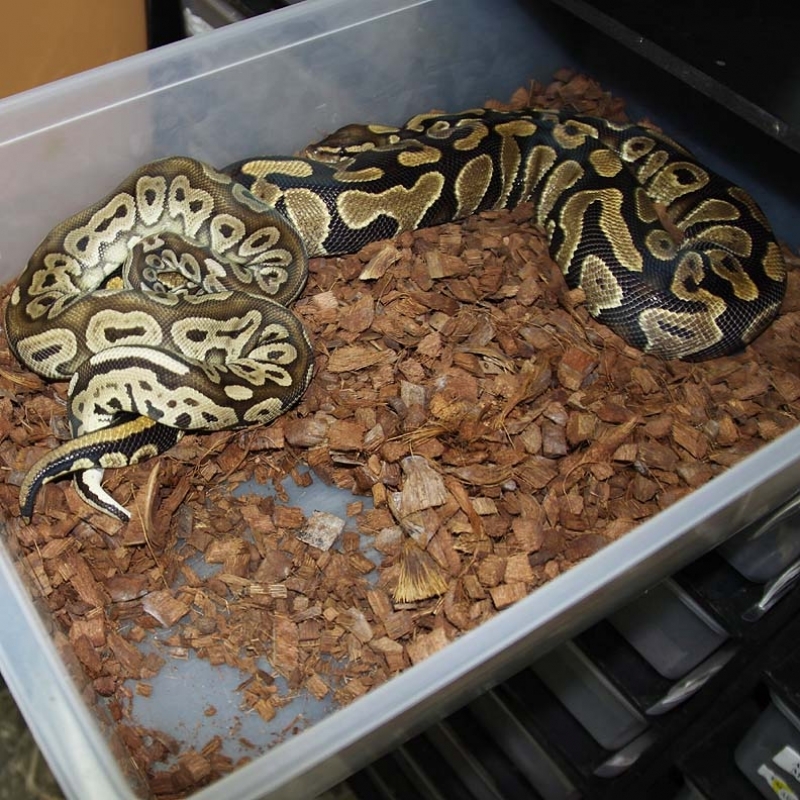 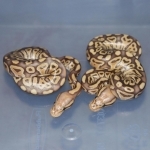 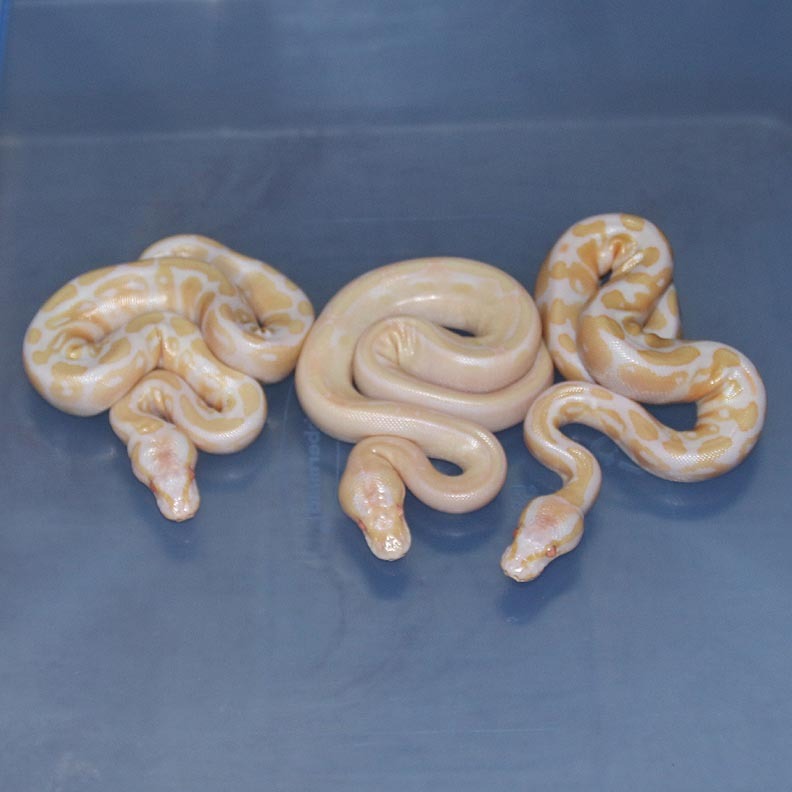 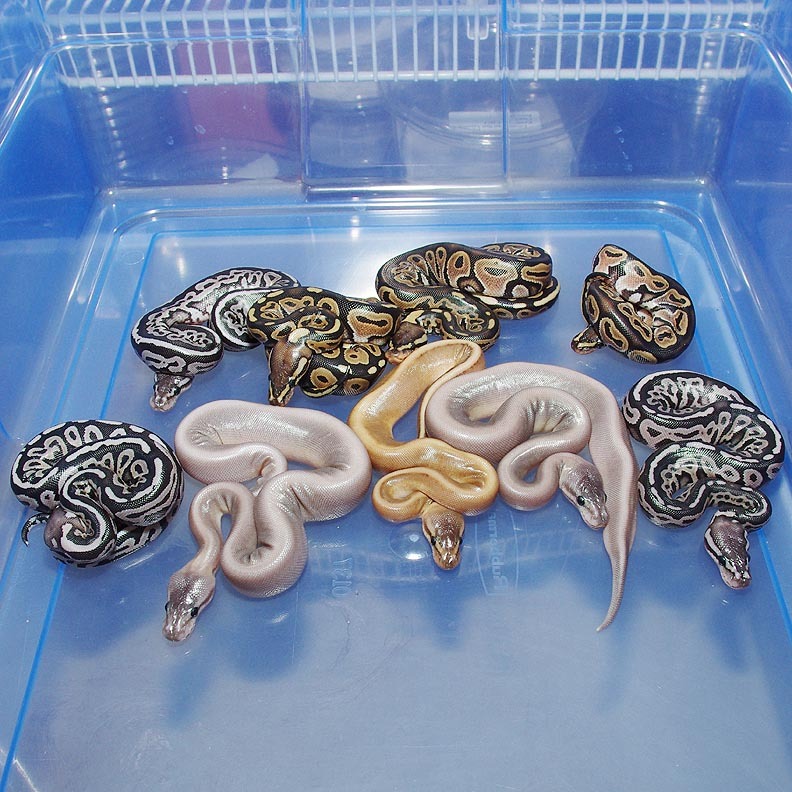 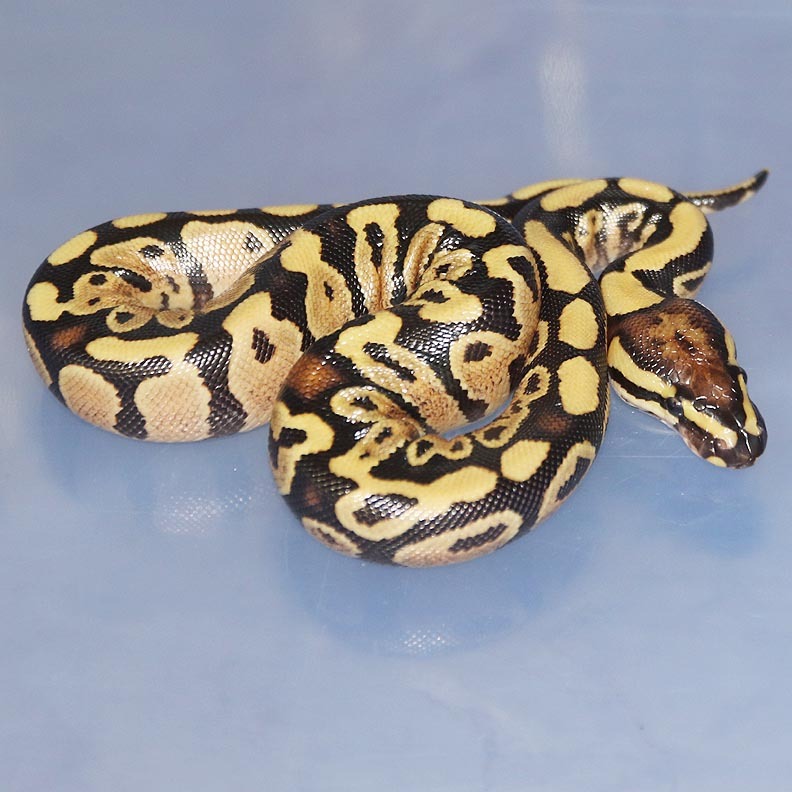 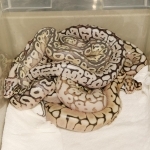 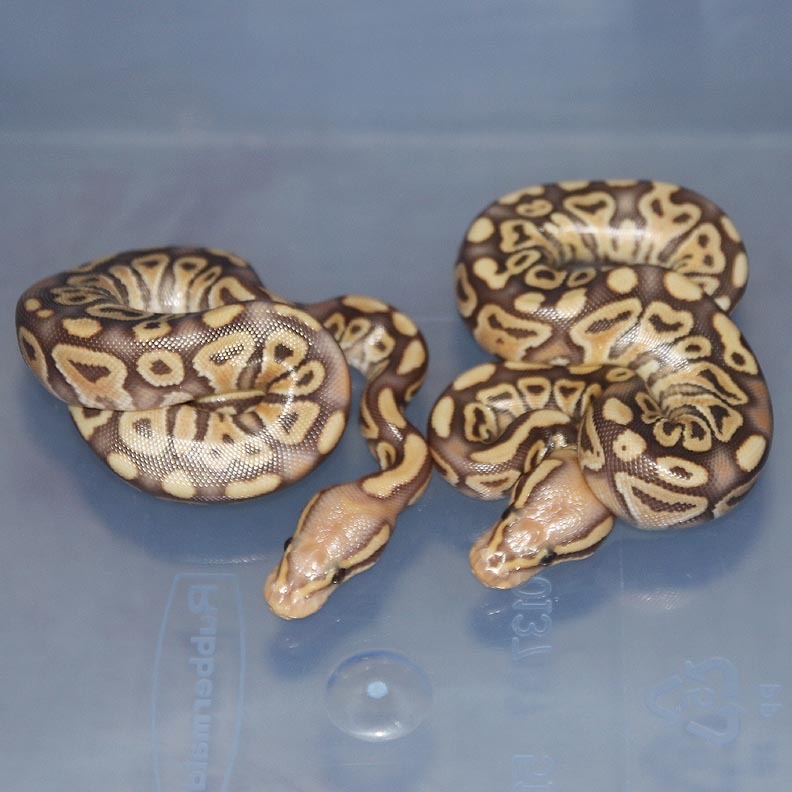 Description: Pastel Champagne HRA Het Caramel 2/12 x Pastel Het Caramel 2/06. 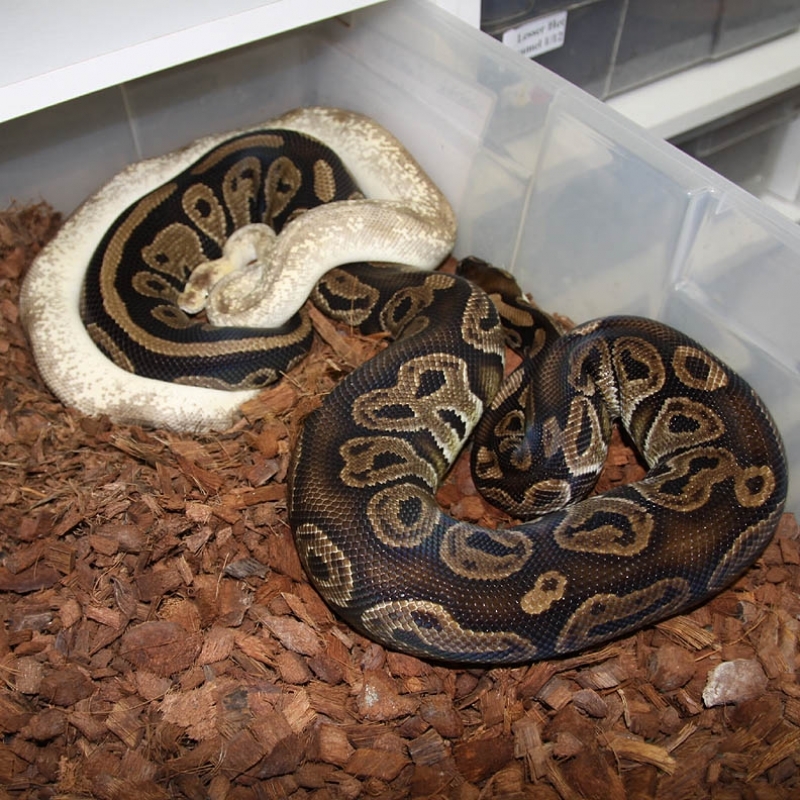 If you are interested in animals from clutch #88 please email or call 519-824-7377. 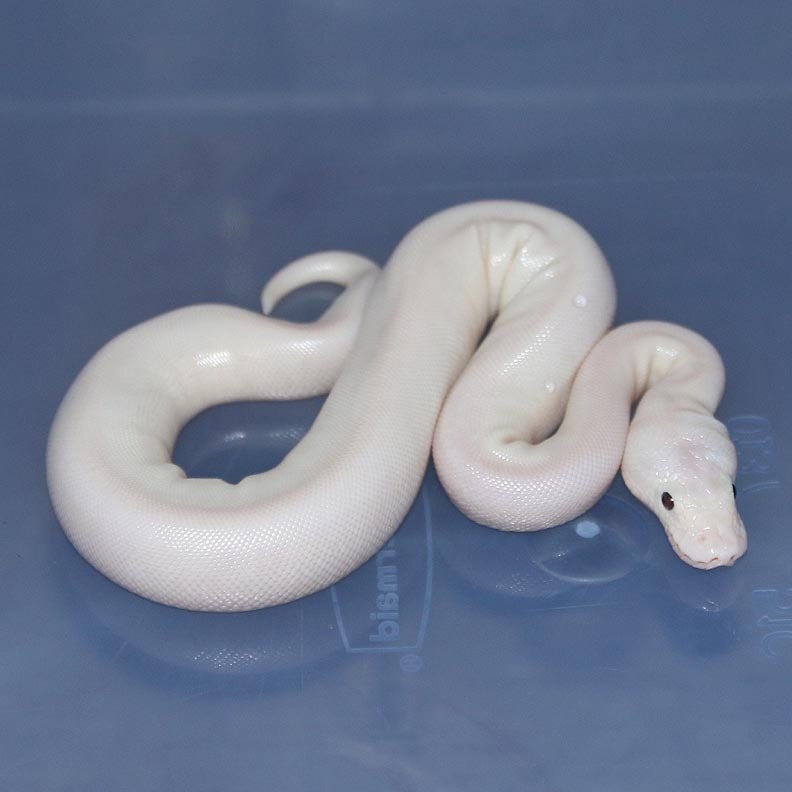 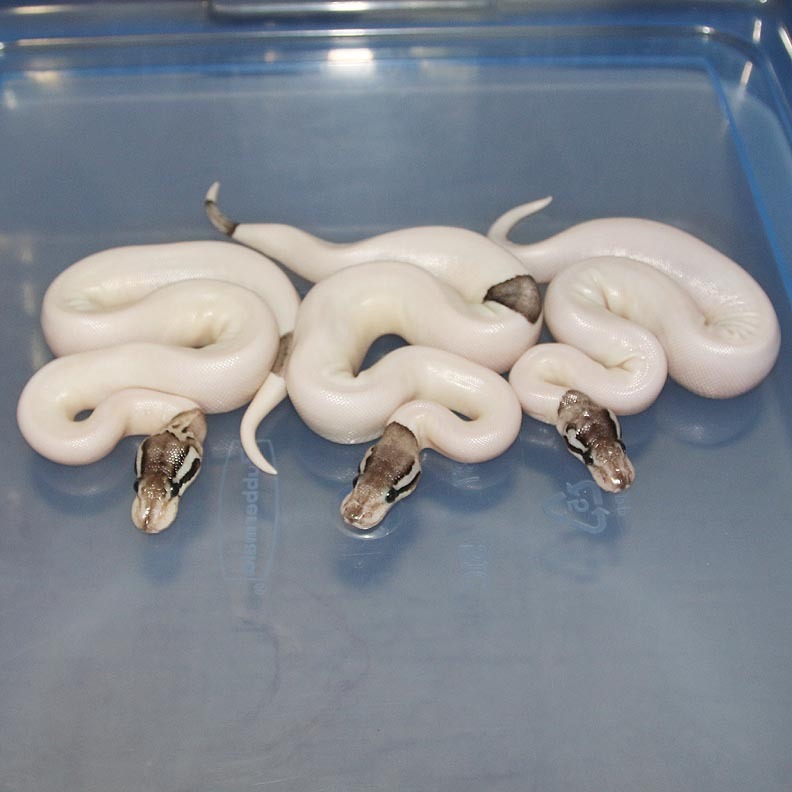 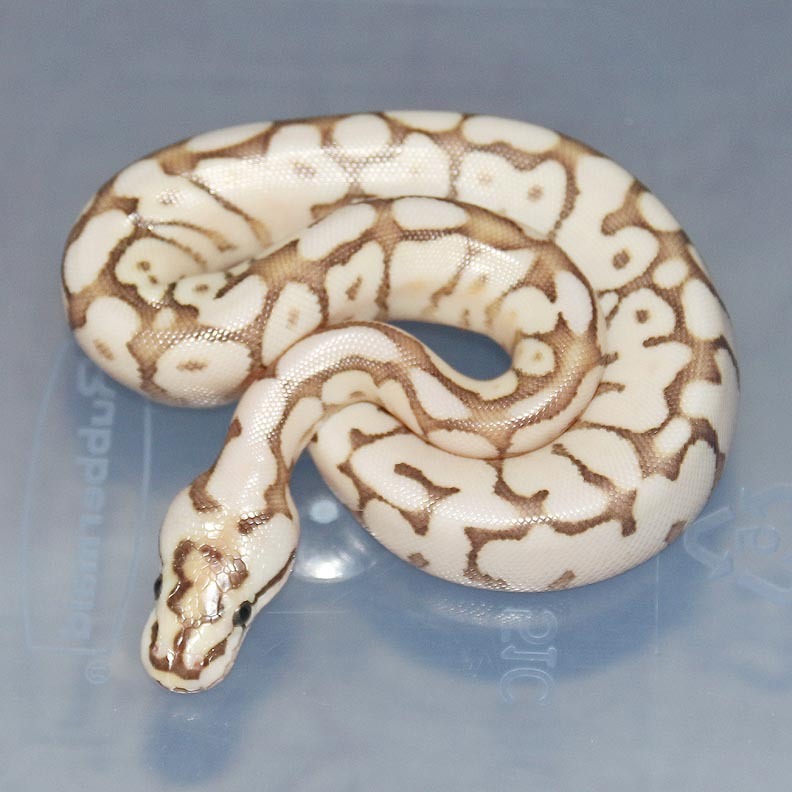 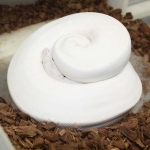 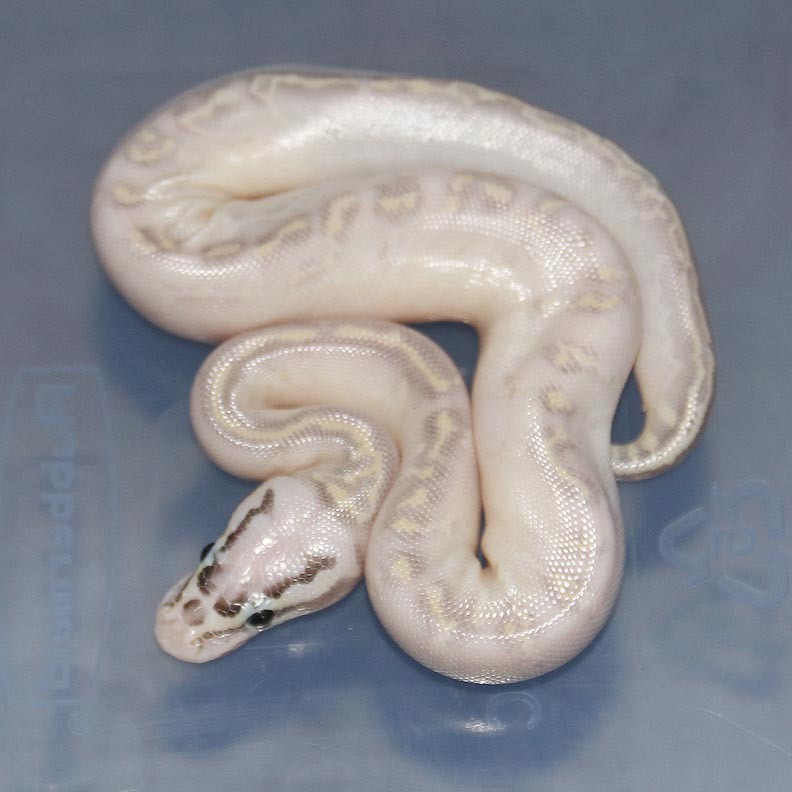 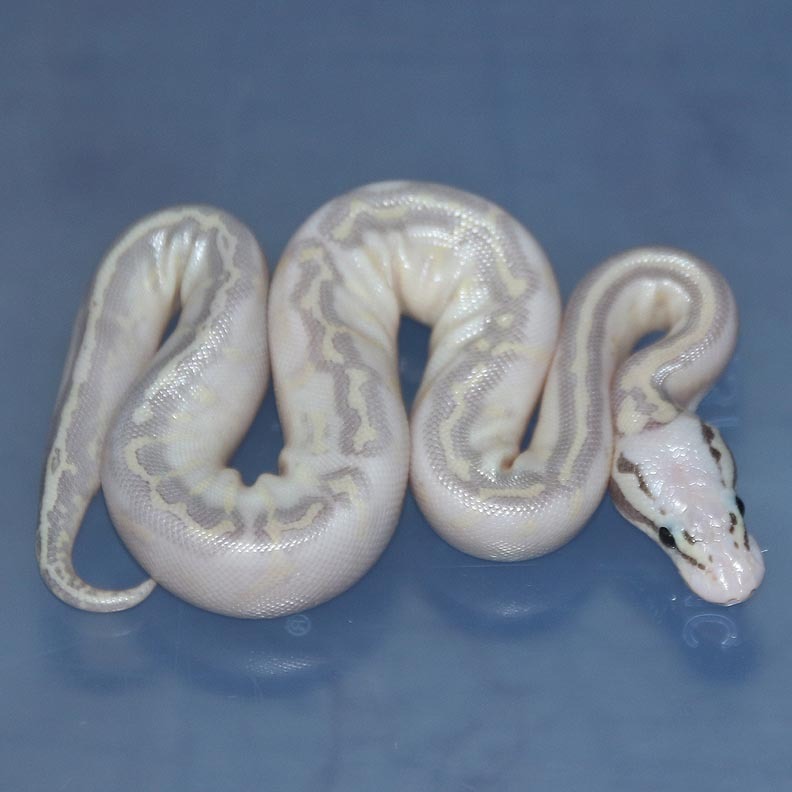 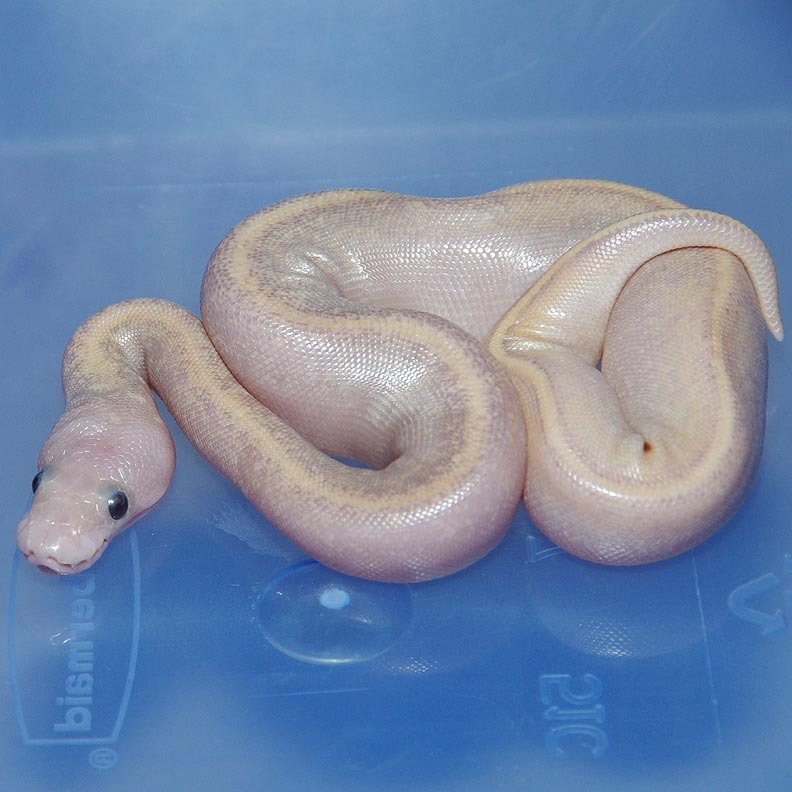 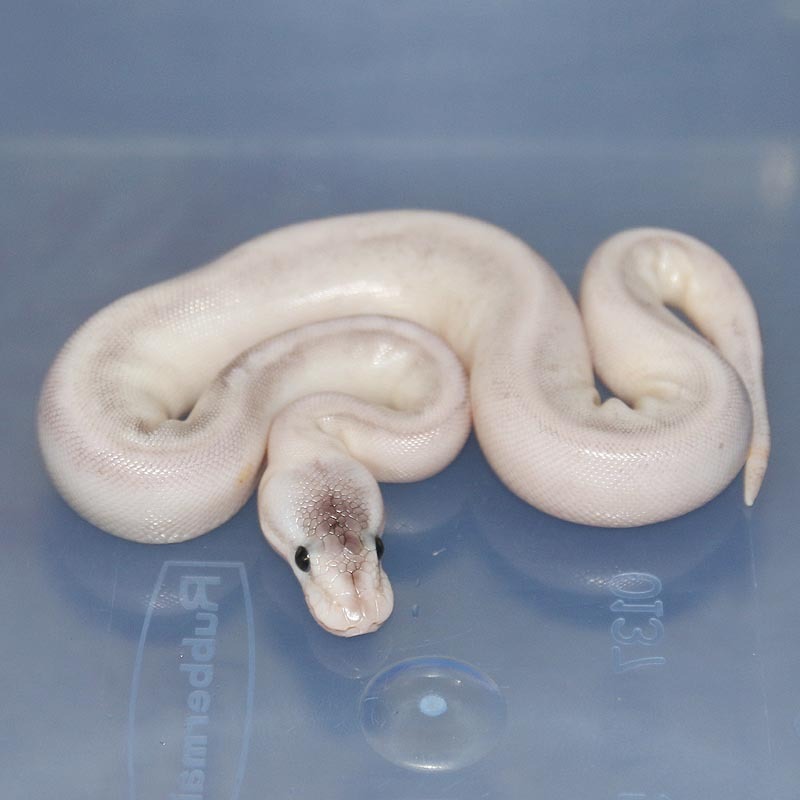 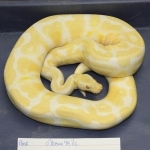 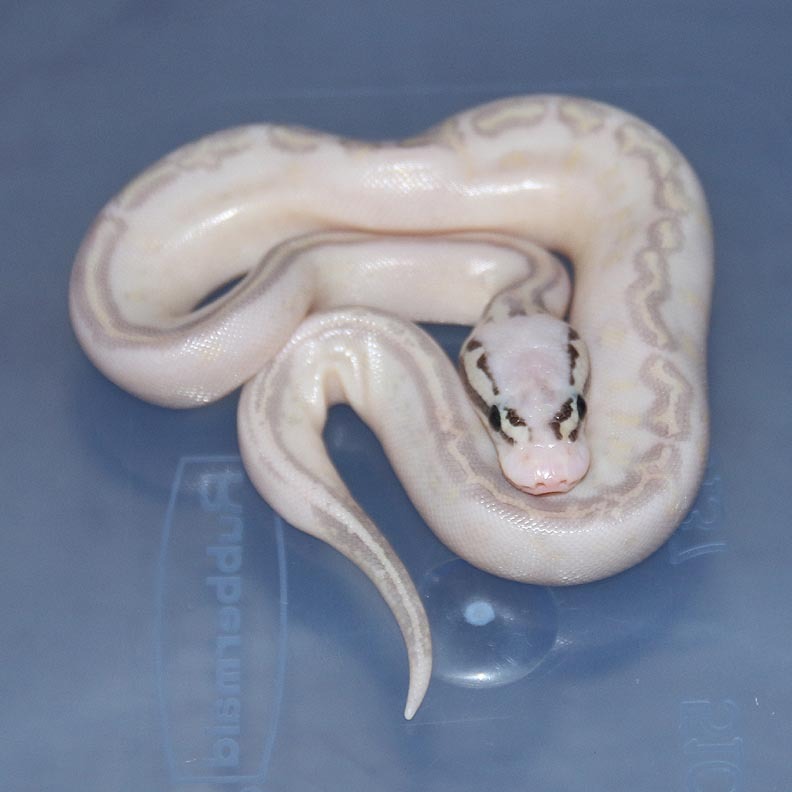 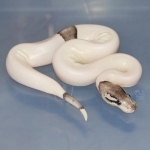 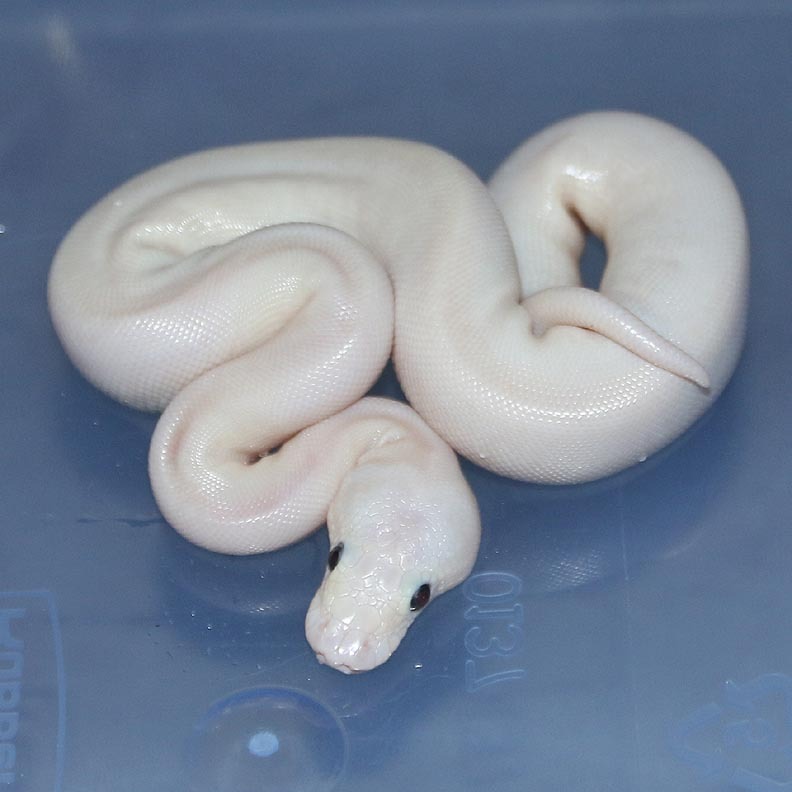 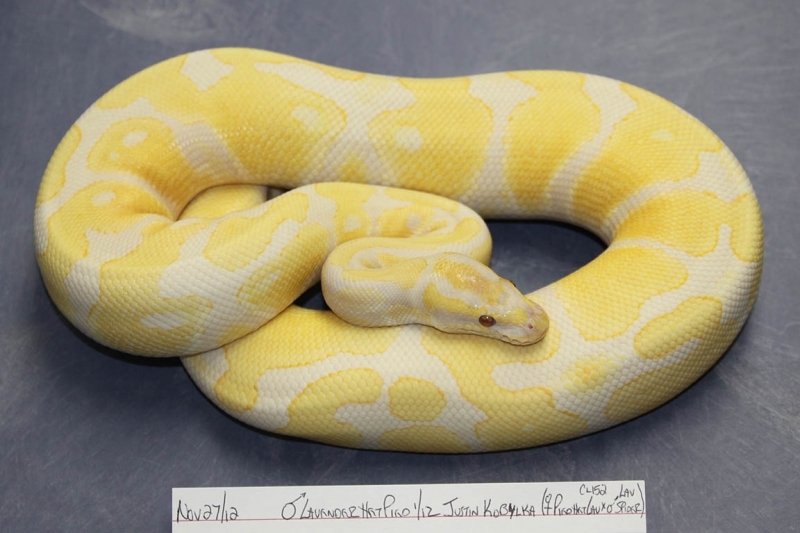 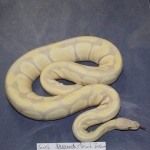 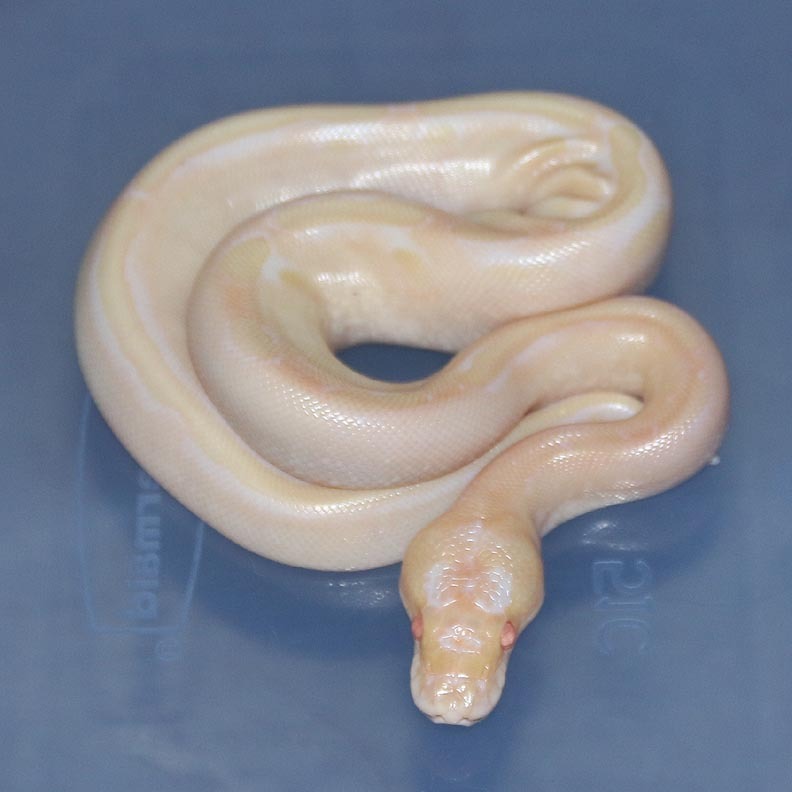 Description: Toffino 1/11 x Pastel Champagne Het Albino 1/11. 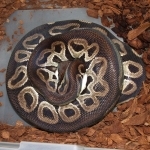 If you are interested in animals from clutch #89 please email or call 519-824-7377. 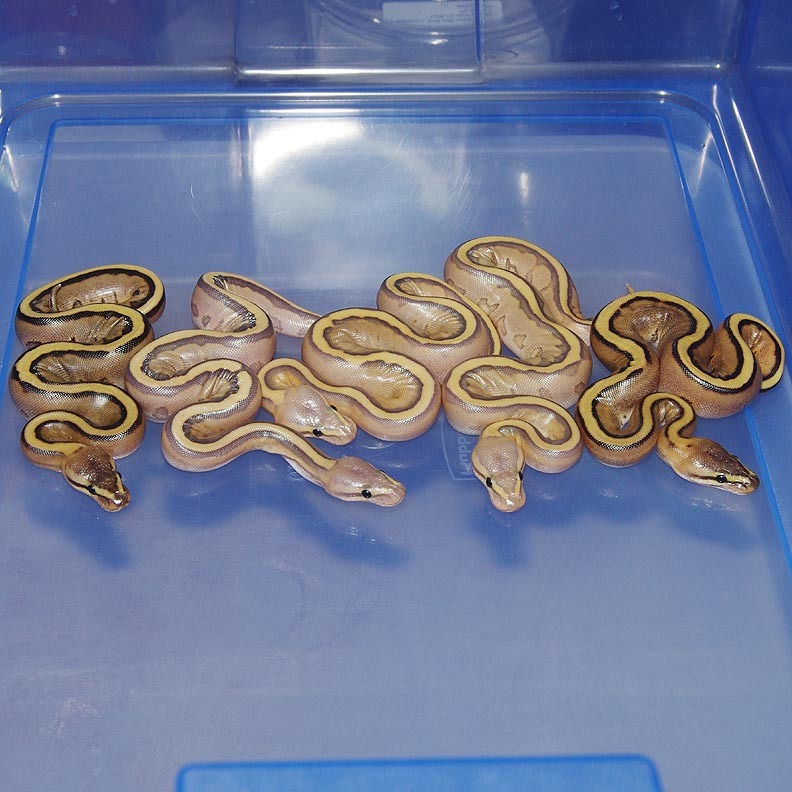 Description: Lesser Red Axanthic Het Green Ghost 1/13 x Pastel Lesser RA PHGG 2/11. 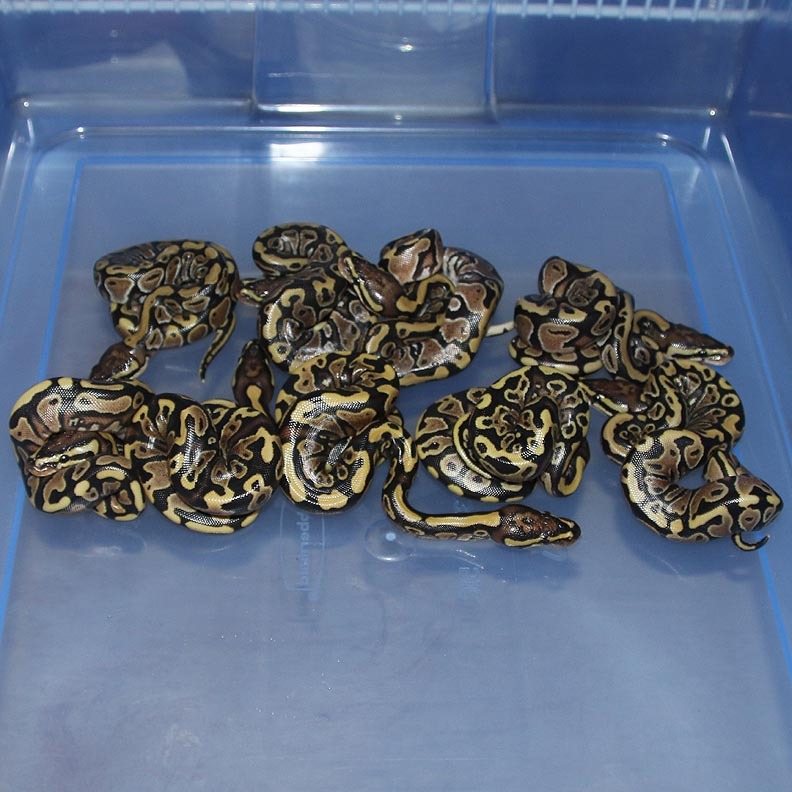 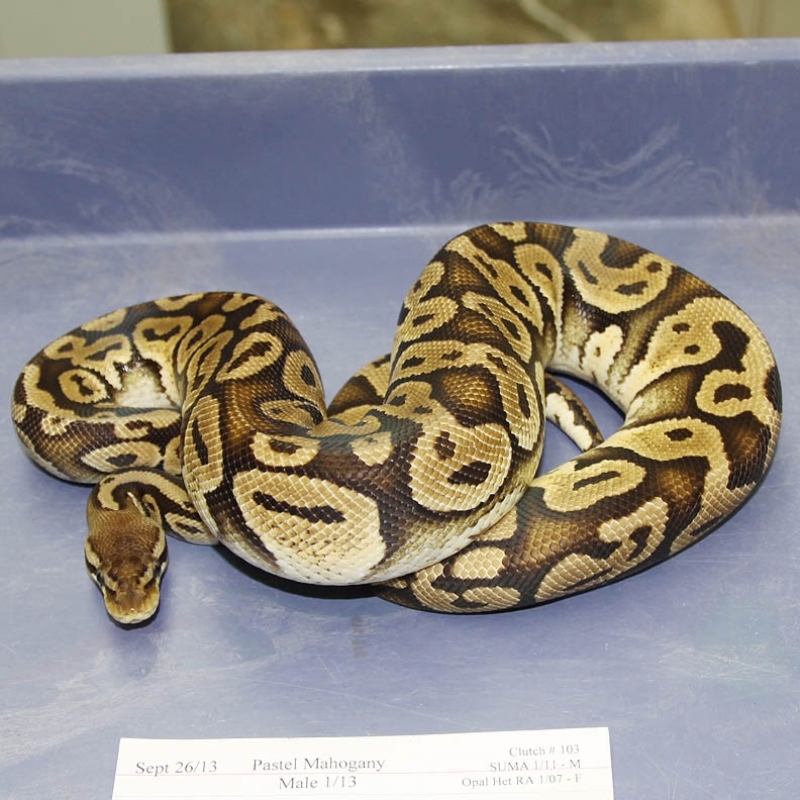 If you are interested in animals from clutch #90 please email or call 519-824-7377. Description: Red Axanthic Het Pied 1/12 x Red Axanthic PH Pied 1/13. 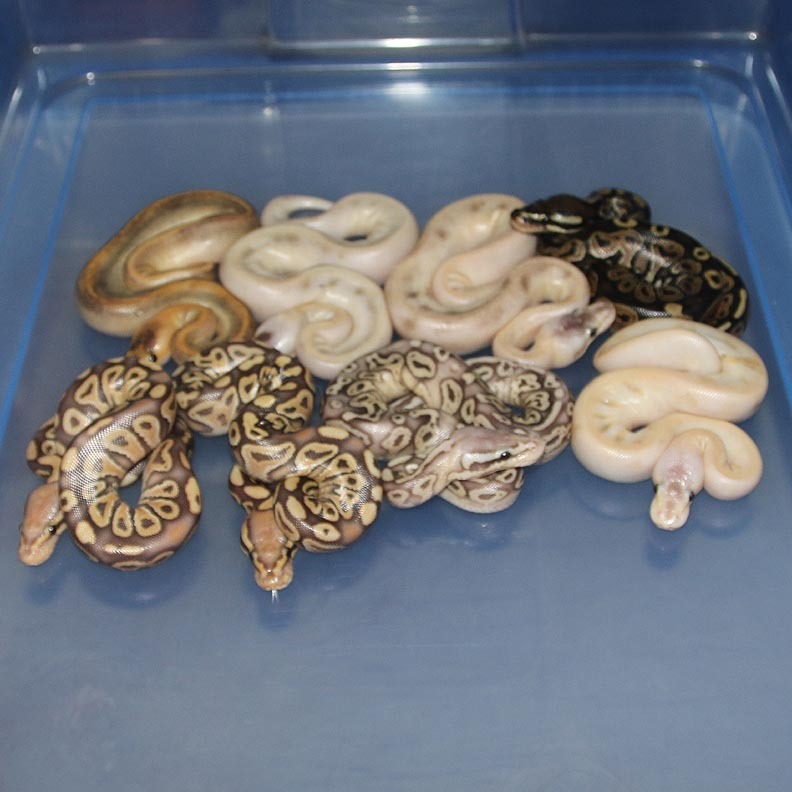 If you are interested in animals from clutch #91 please email or call 519-824-7377. 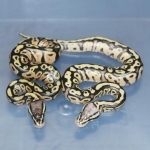 Description: Pastel Lesser DH GG/GS 1/11 x Lesser DH GG/GS 1/10. If you are interested in animals from clutch #92 please email or call 519-824-7377. 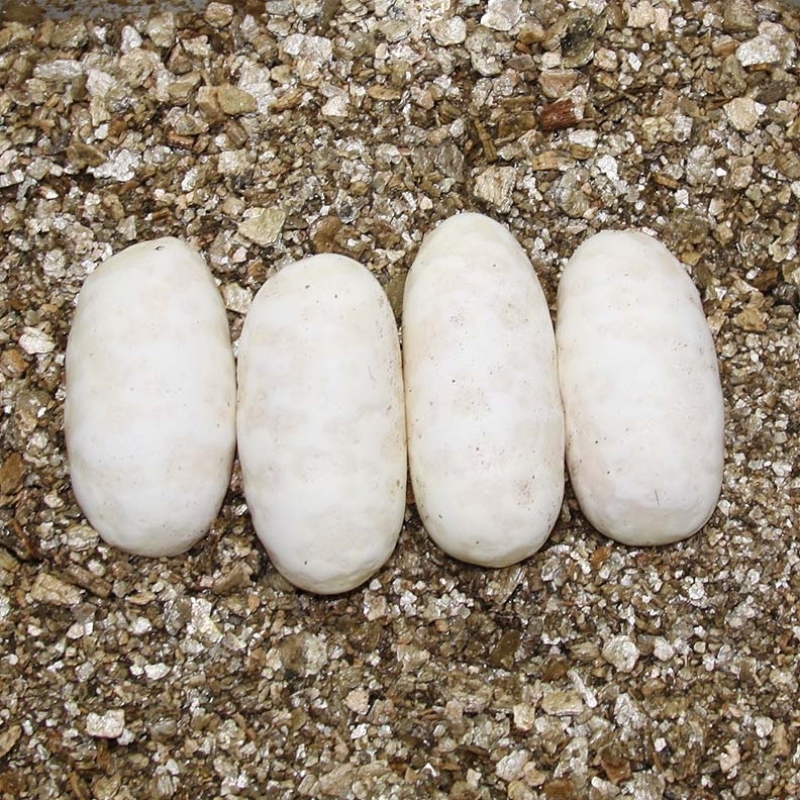 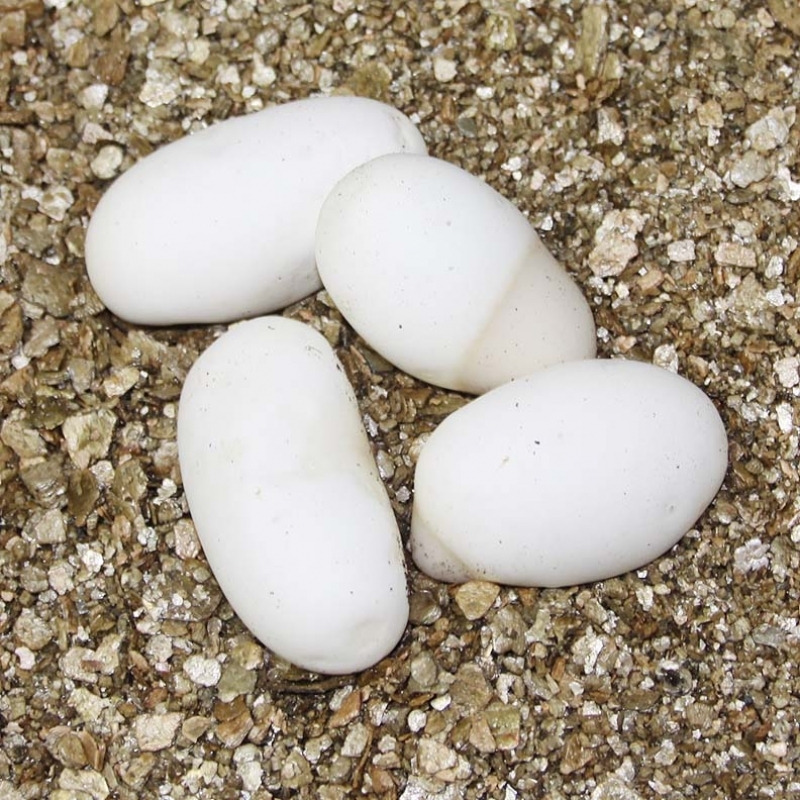 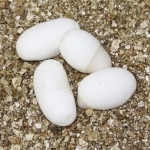 Description: Lemon Pastel Highway 1/13 x Pastel Lesser YB 1/10. 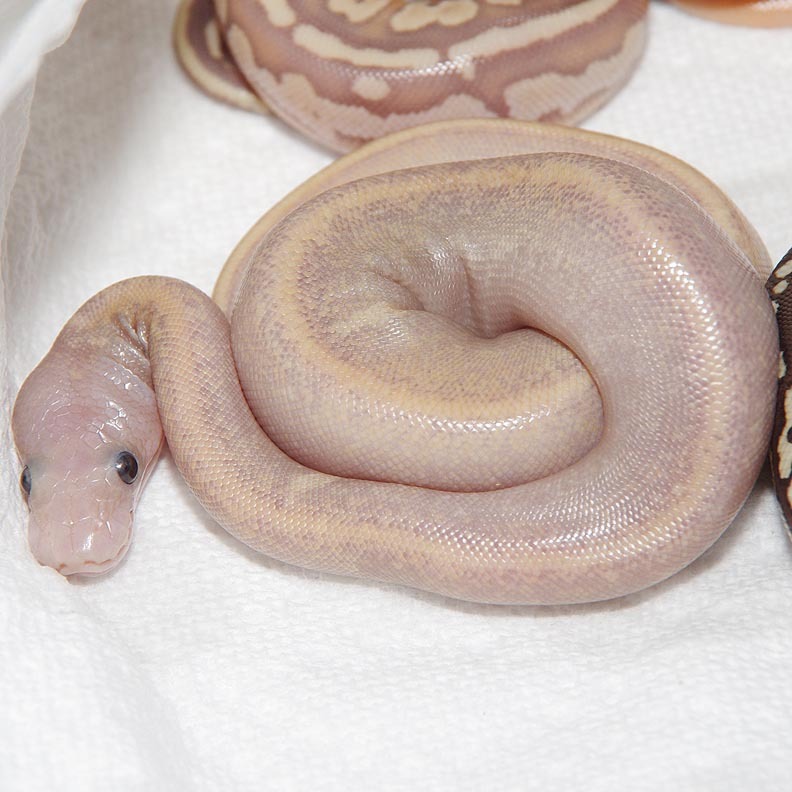 I really like the highways in this clutch! 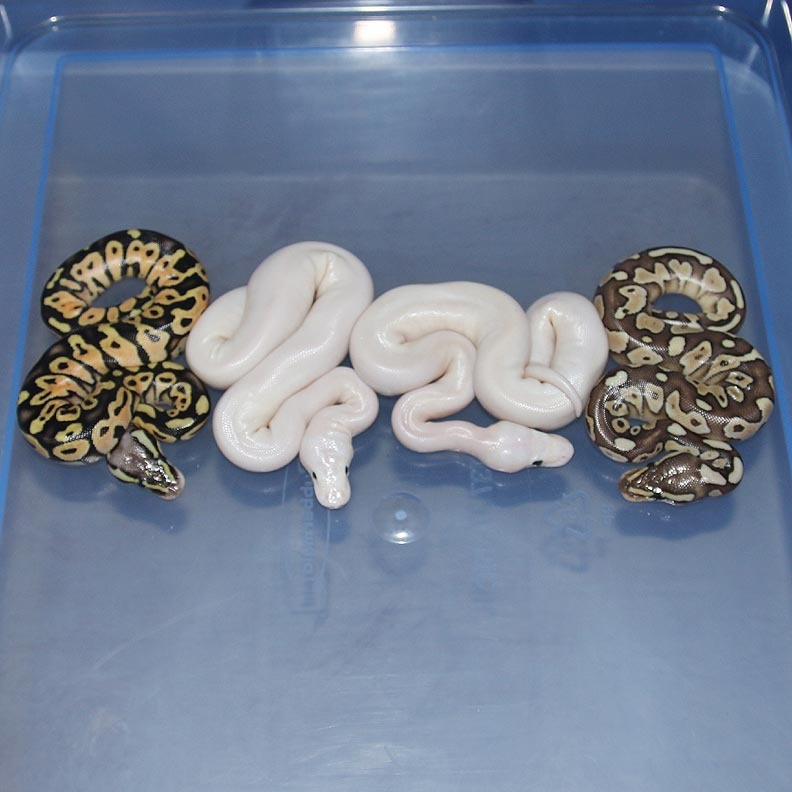 If you are interested in animals from clutch #93 please email or call 519-824-7377. Description: Toffino 1/11 x Champagne Het Albino 2/11. 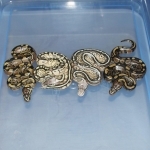 If you are interested in animals from clutch #94 please email or call 519-824-7377. 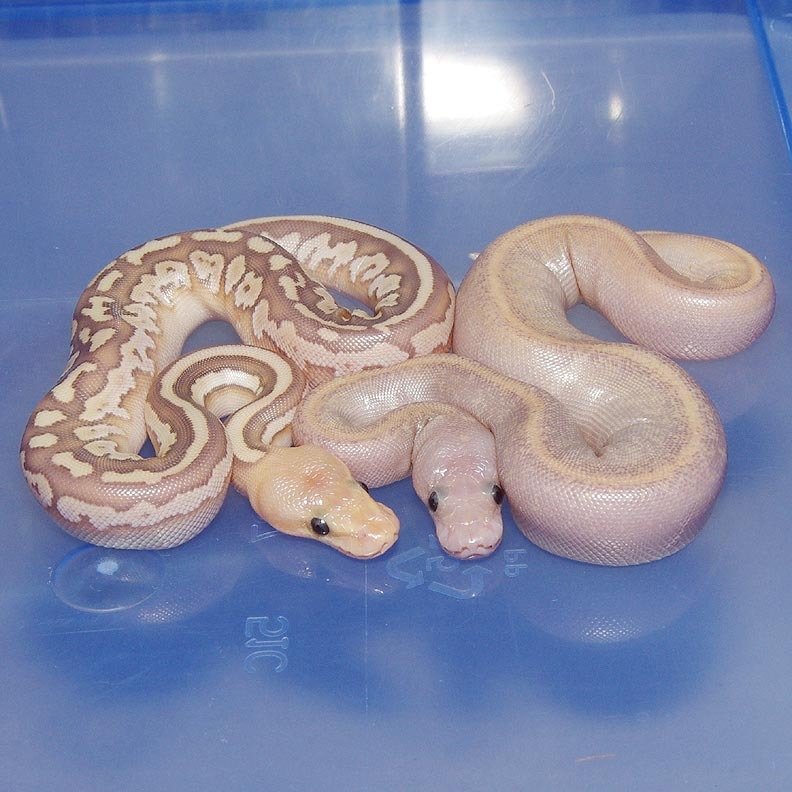 Description: Pastel Champagne Het Caramel 1/12 x Het RA Het Caramel 4/10. 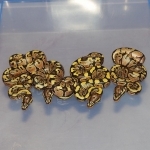 If you are interested in animals from clutch #95 please email or call 519-824-7377. 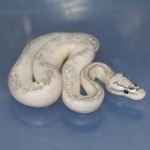 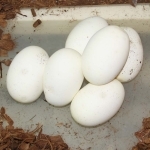 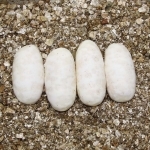 Description: Albino YB 1/12 x HY YB 6/09. 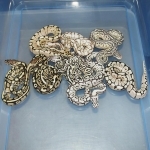 If you are interested in animals from clutch #96 please email or call 519-824-7377. 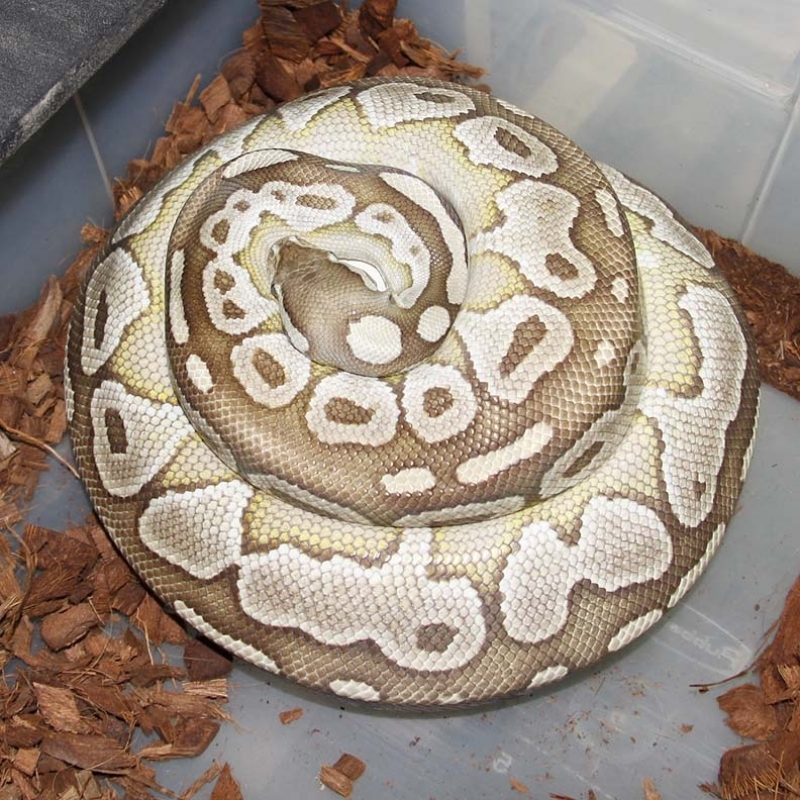 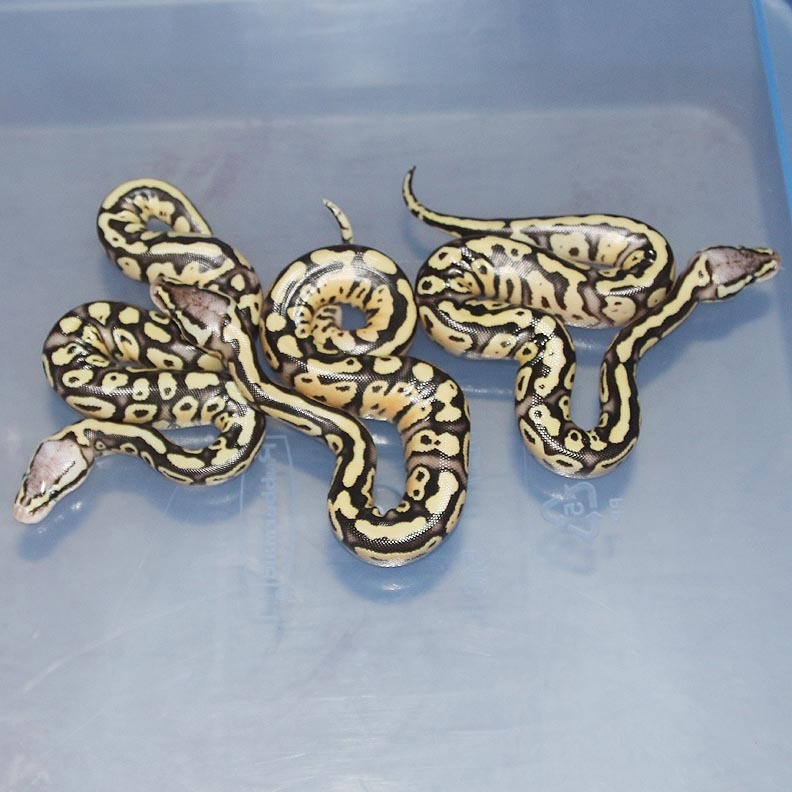 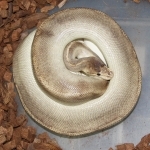 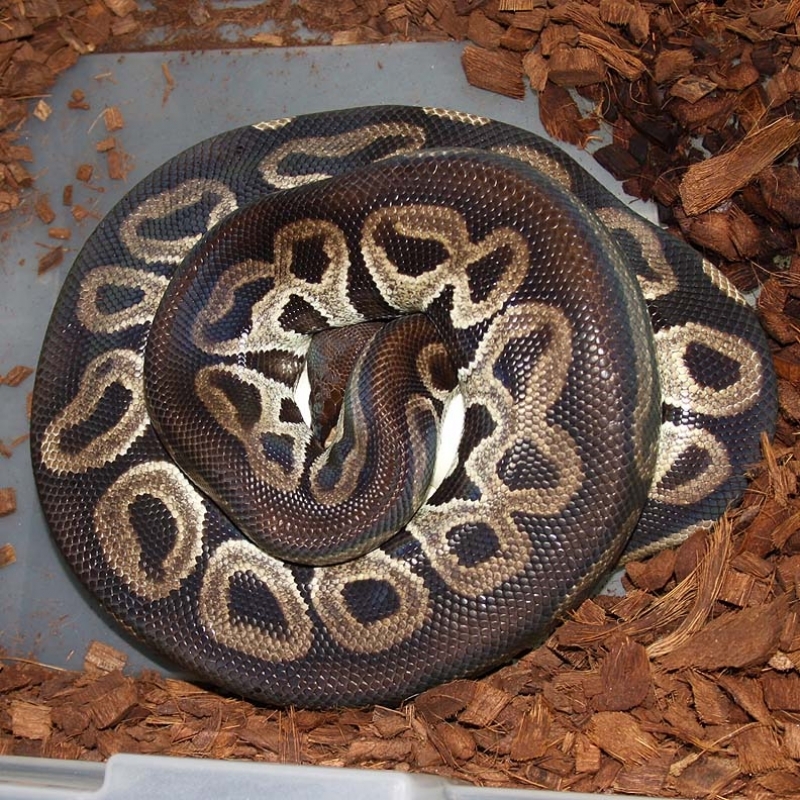 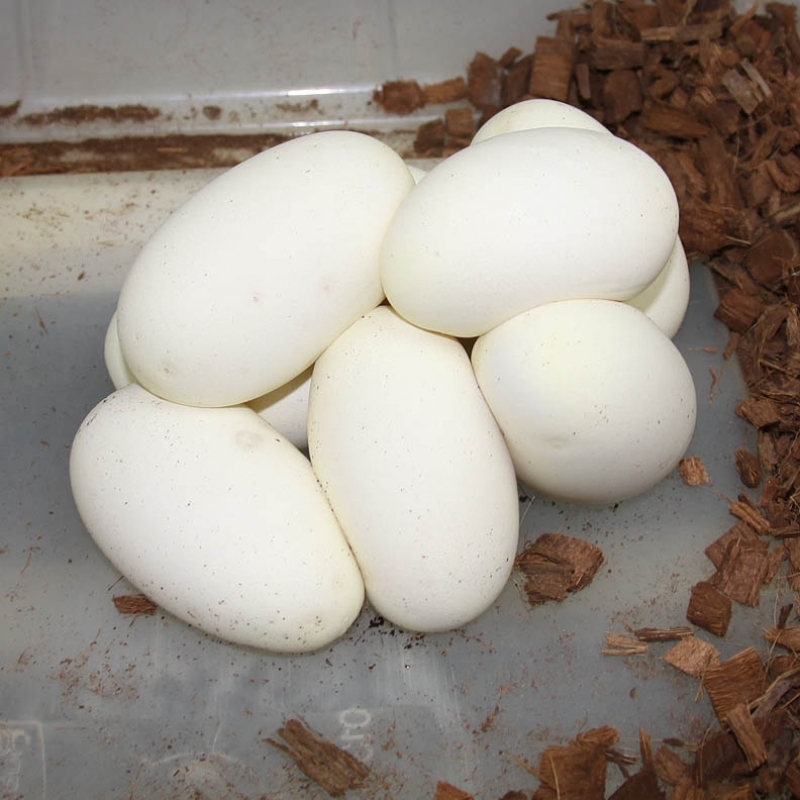 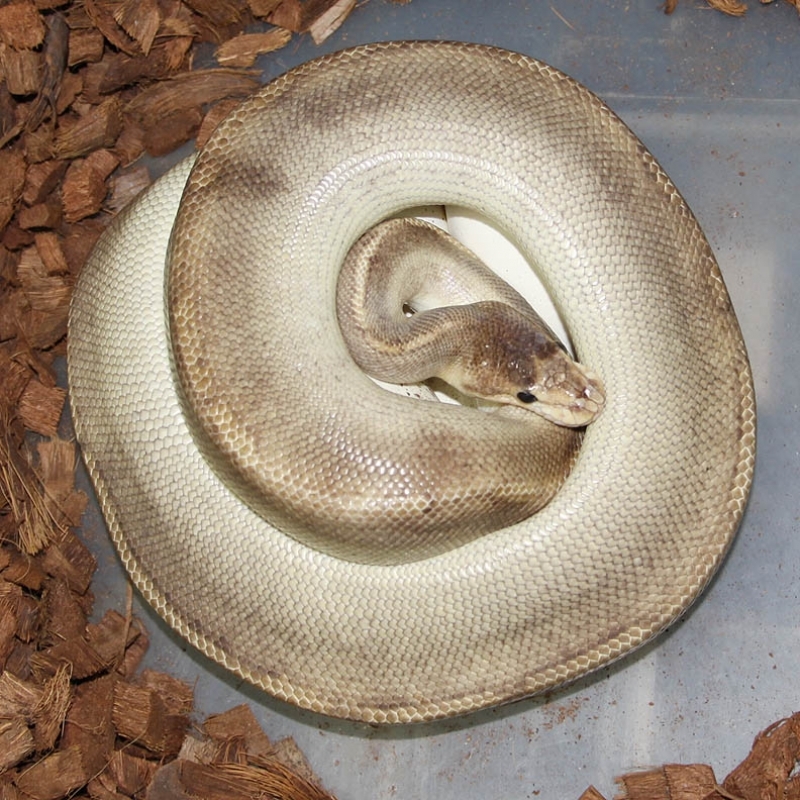 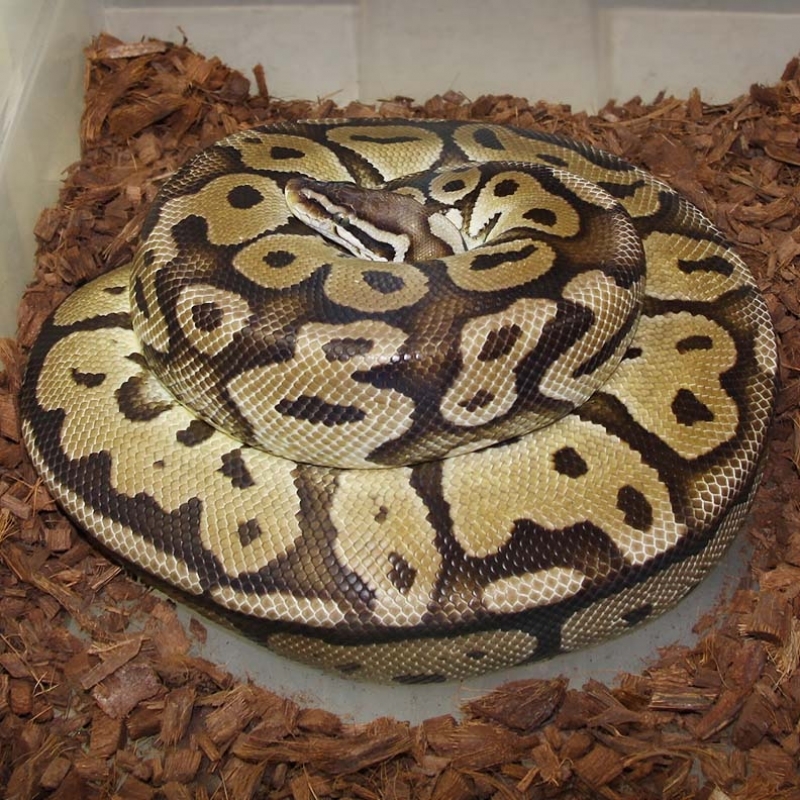 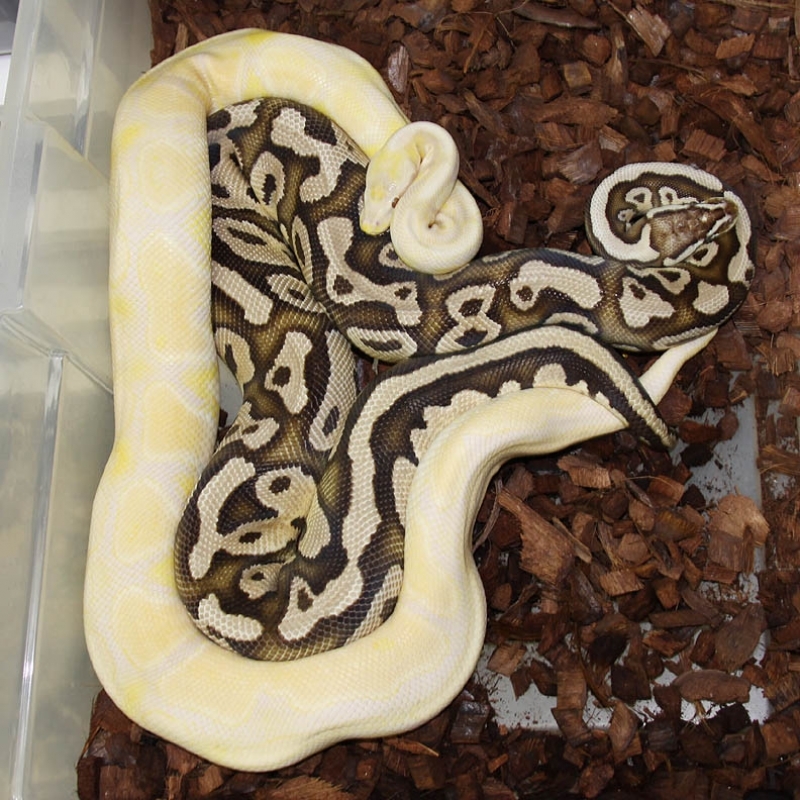 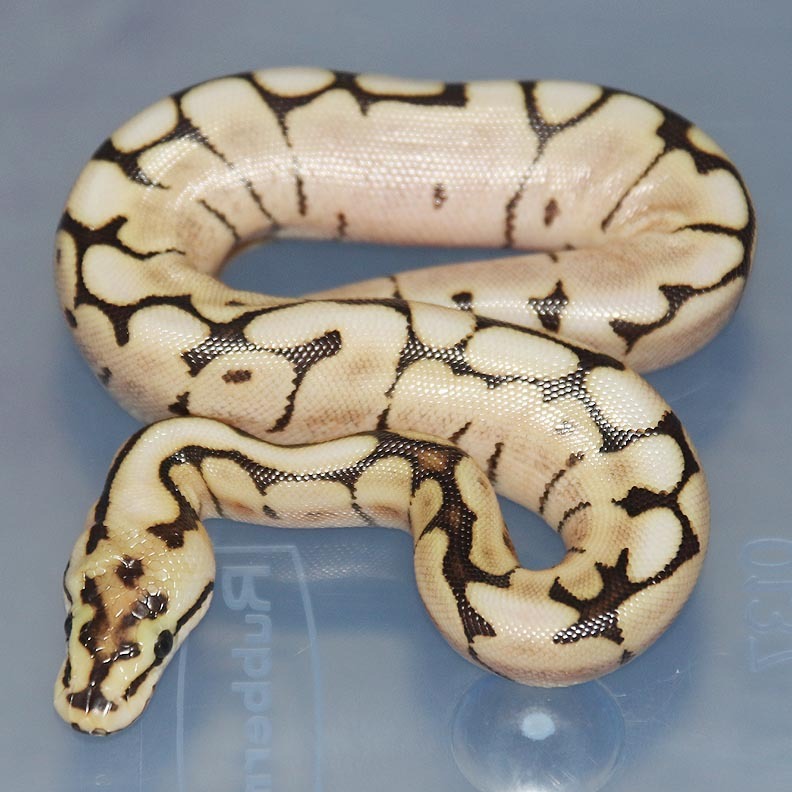 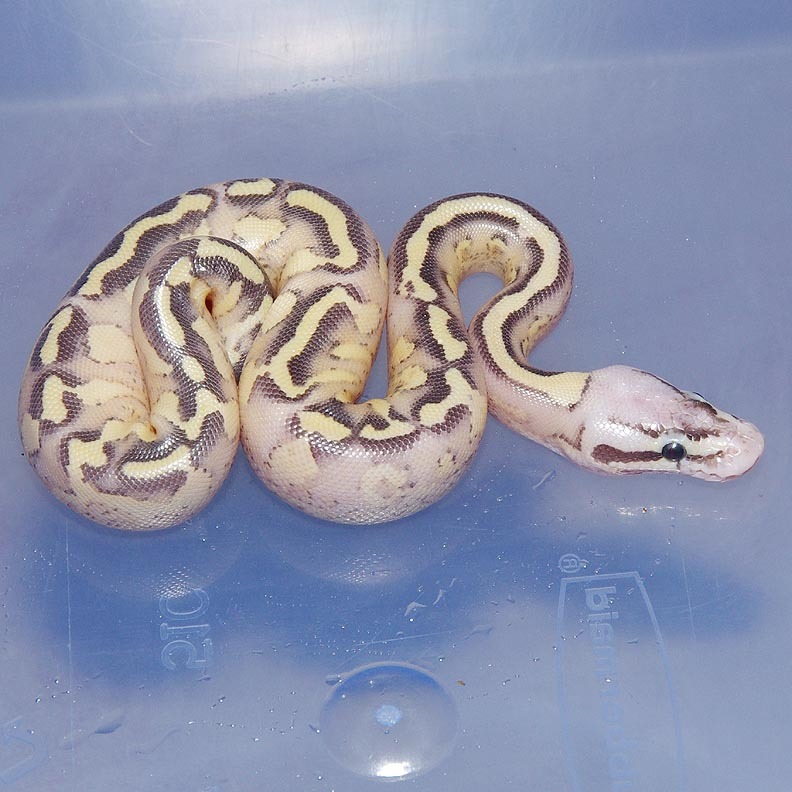 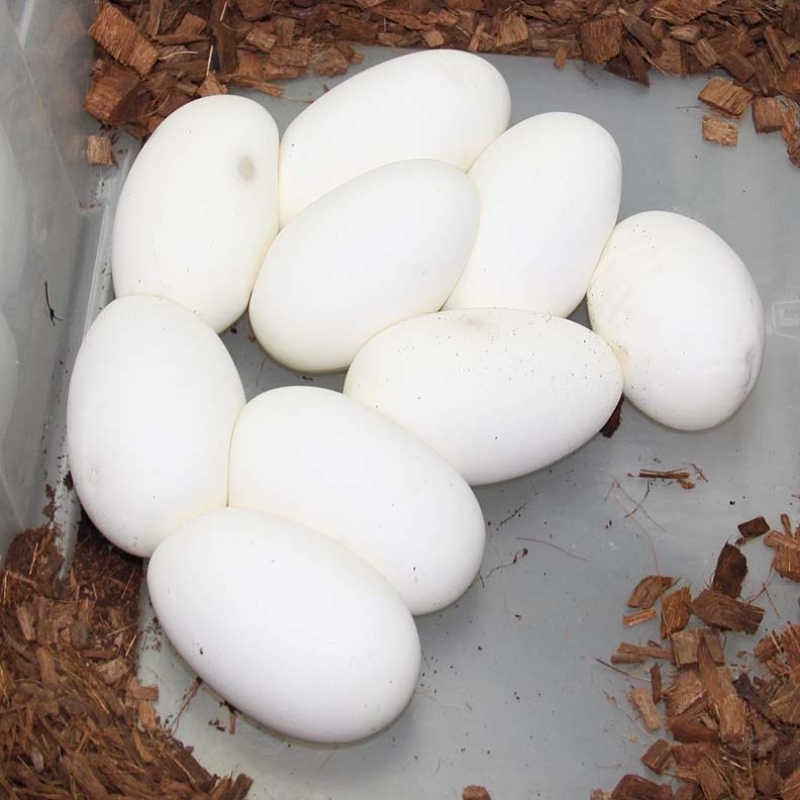 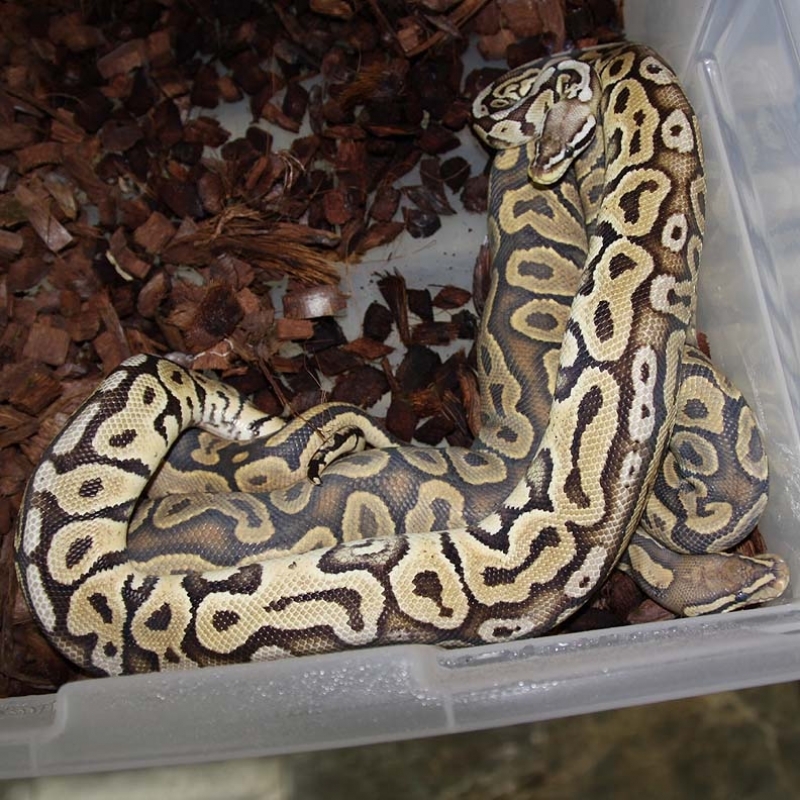 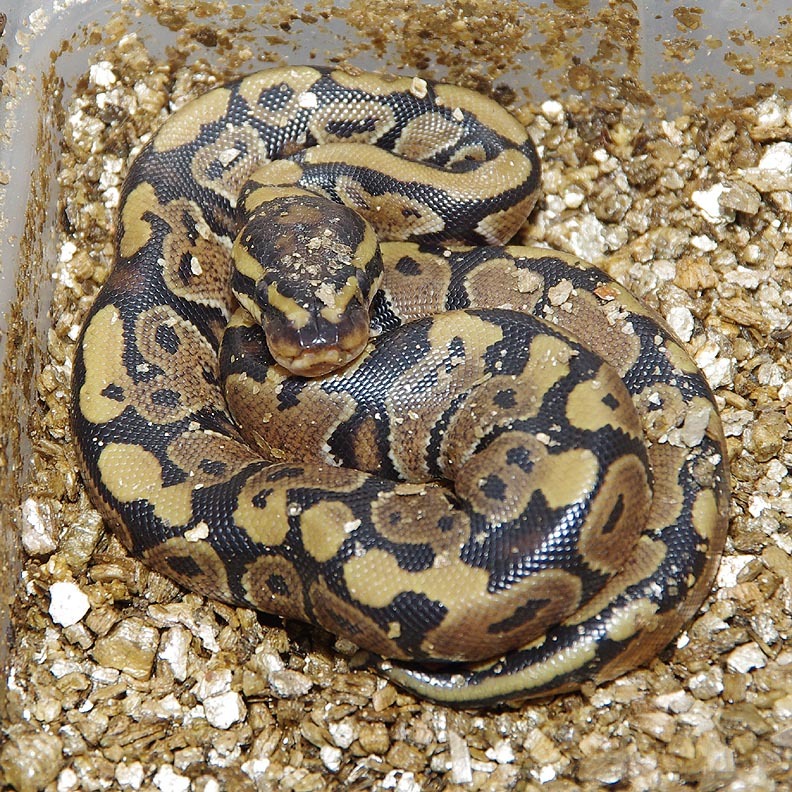 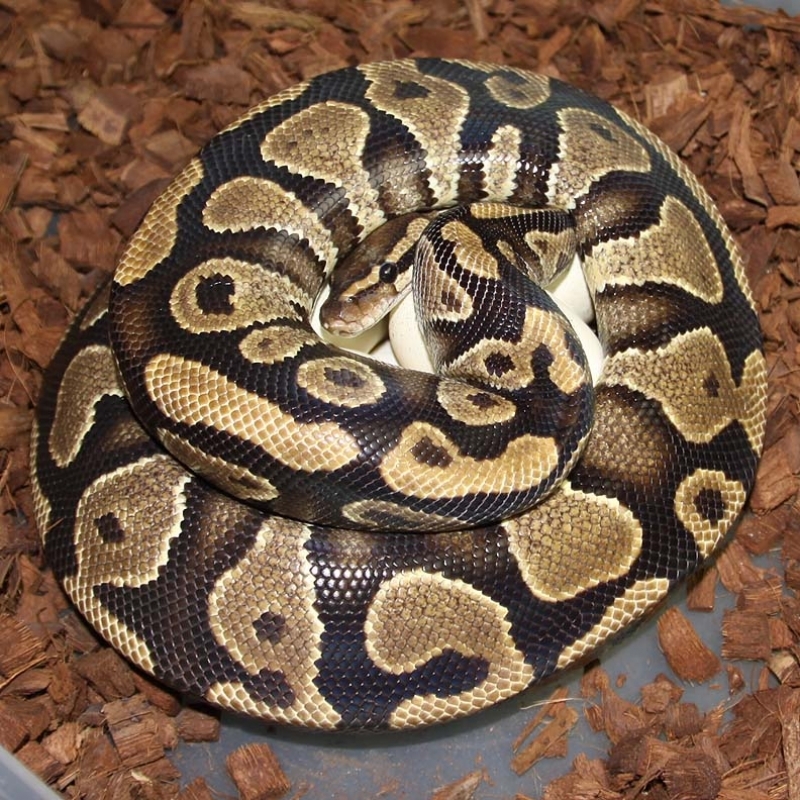 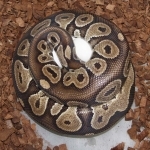 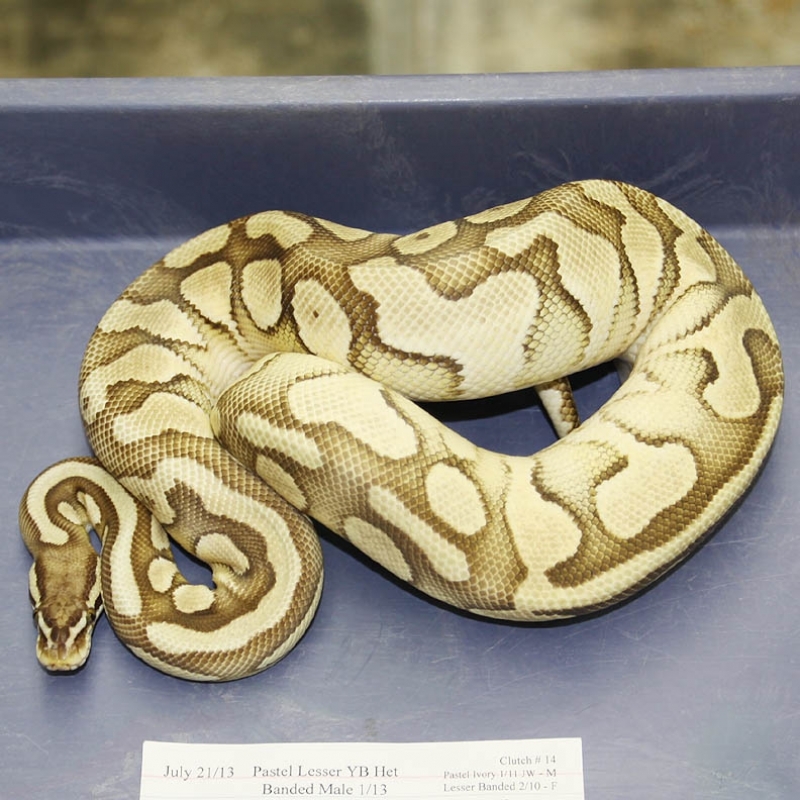 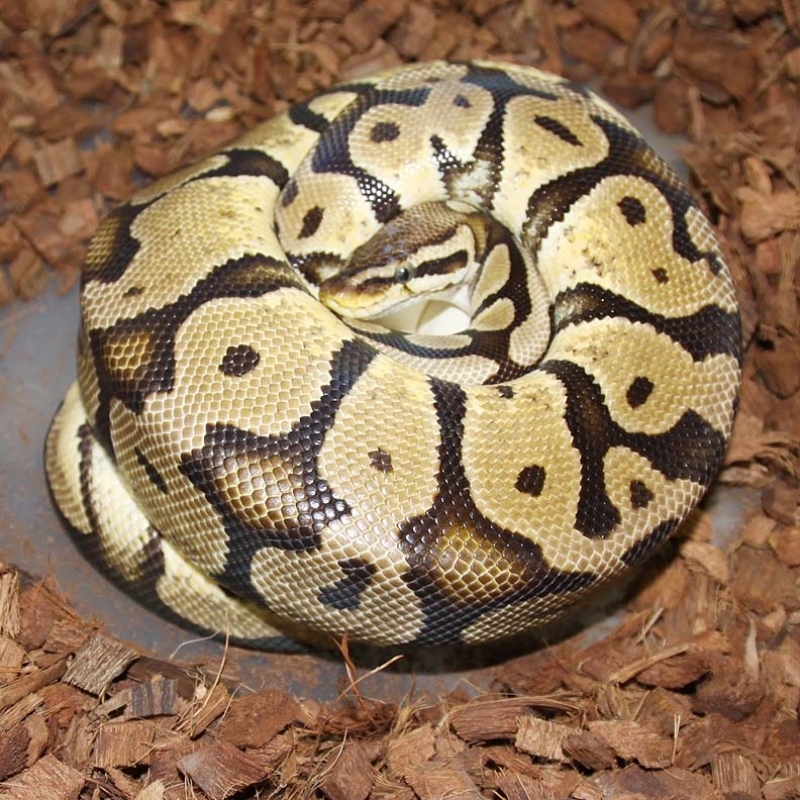 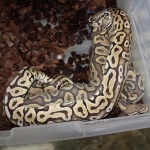 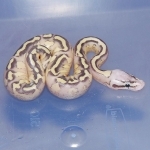 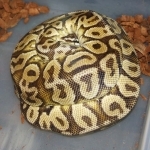 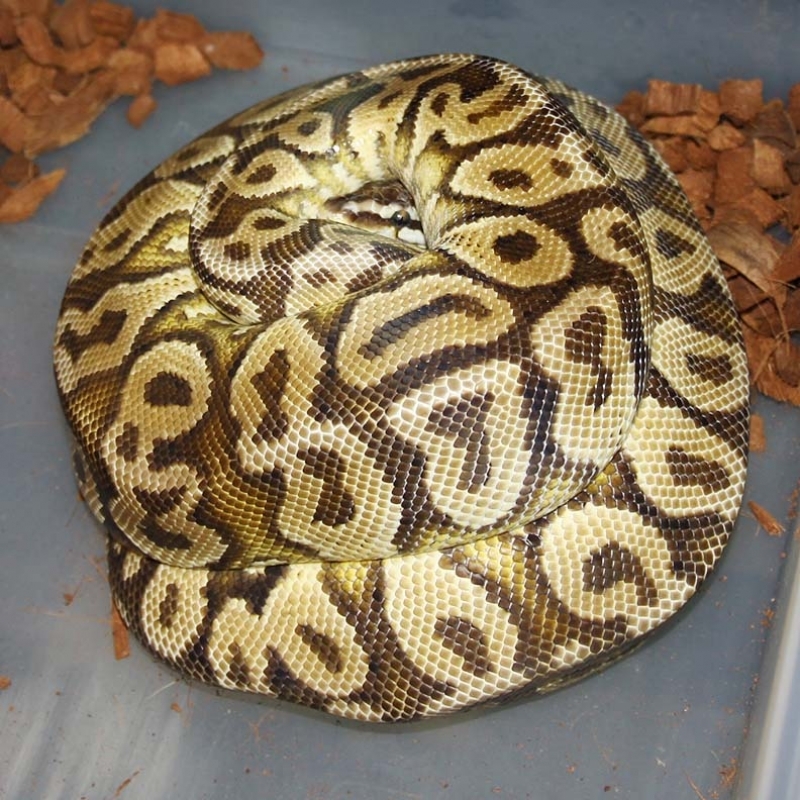 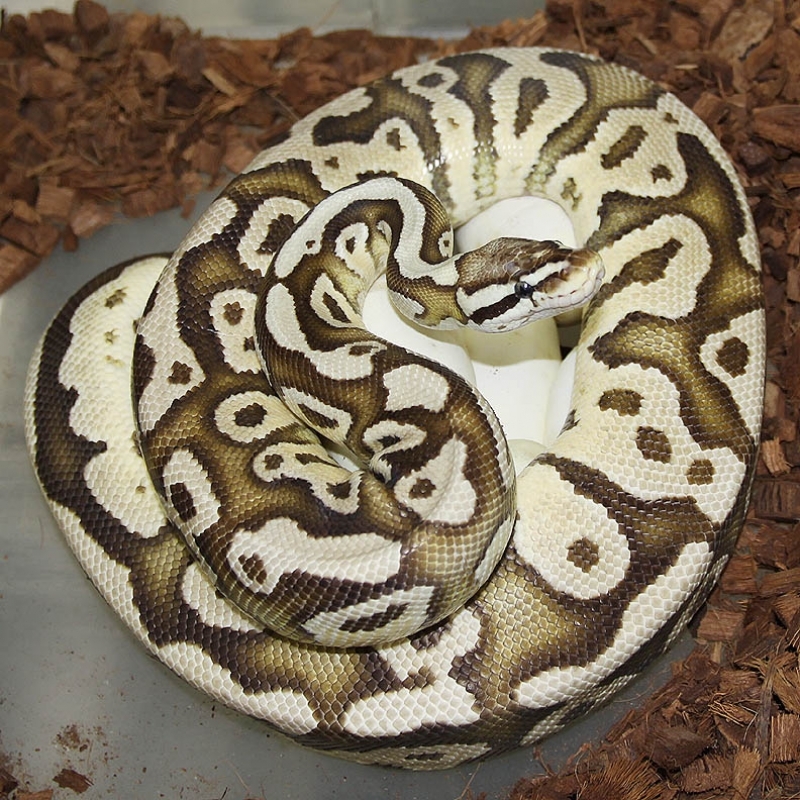 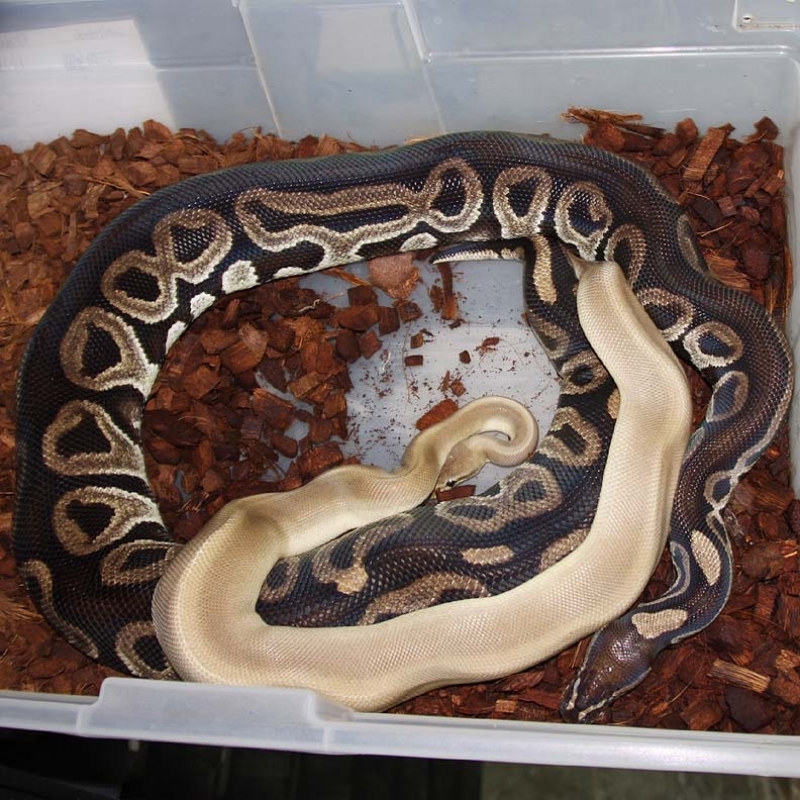 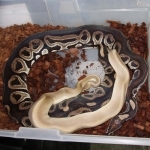 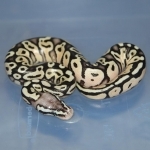 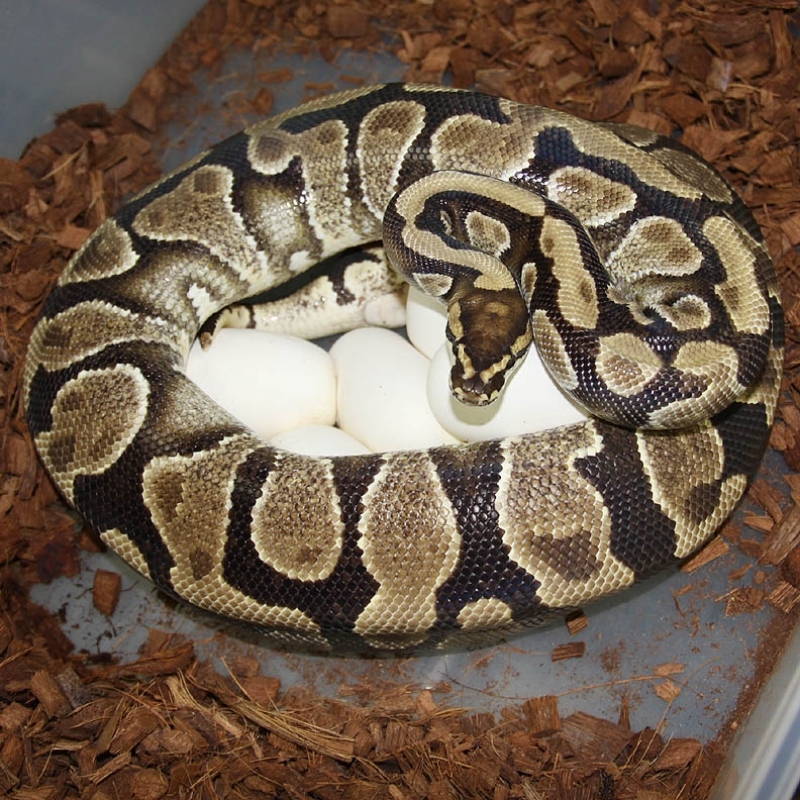 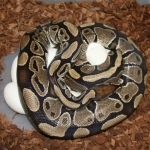 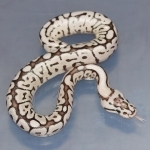 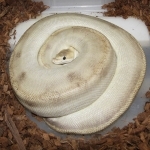 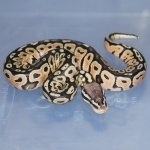 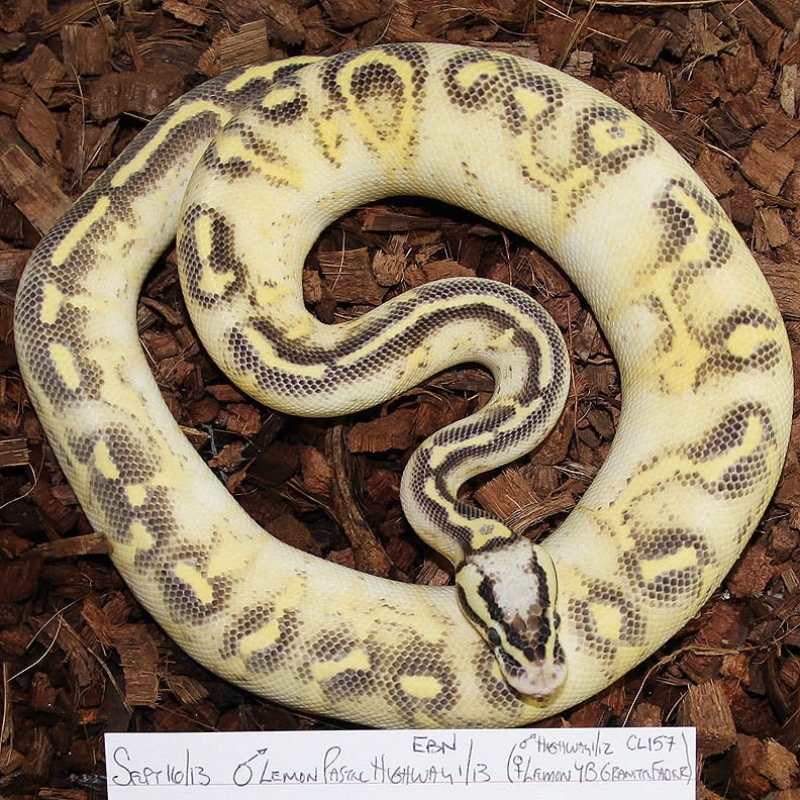 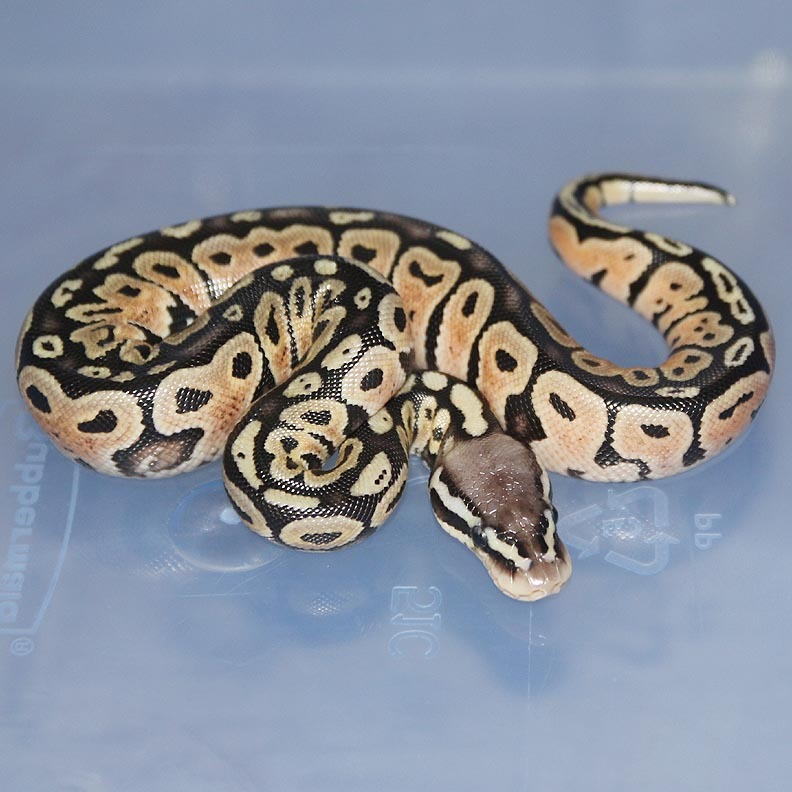 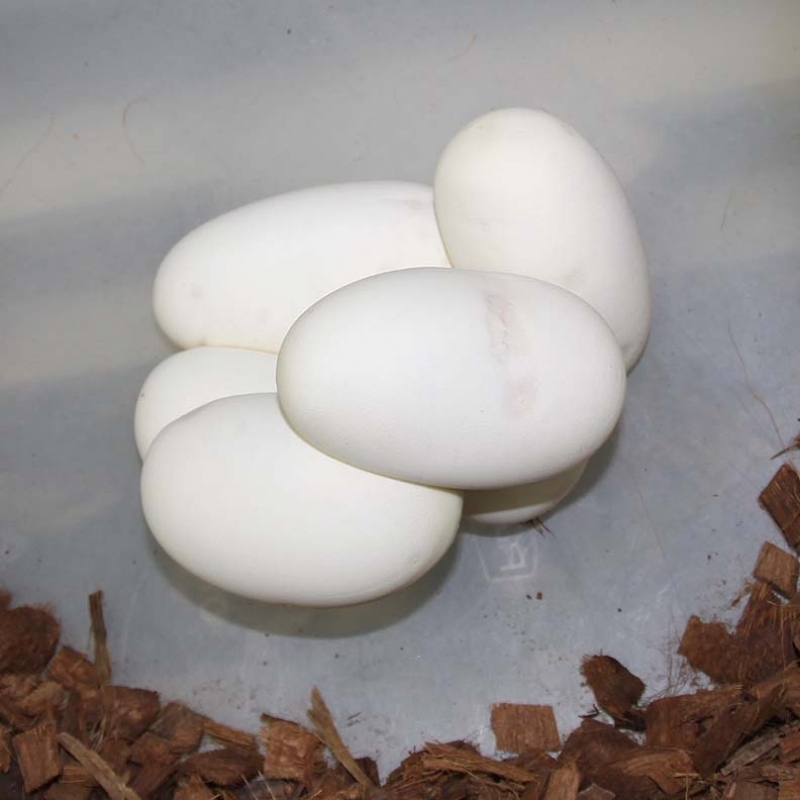 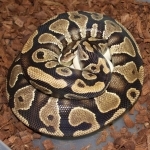 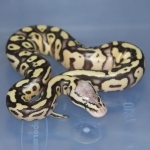 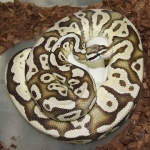 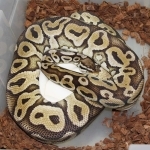 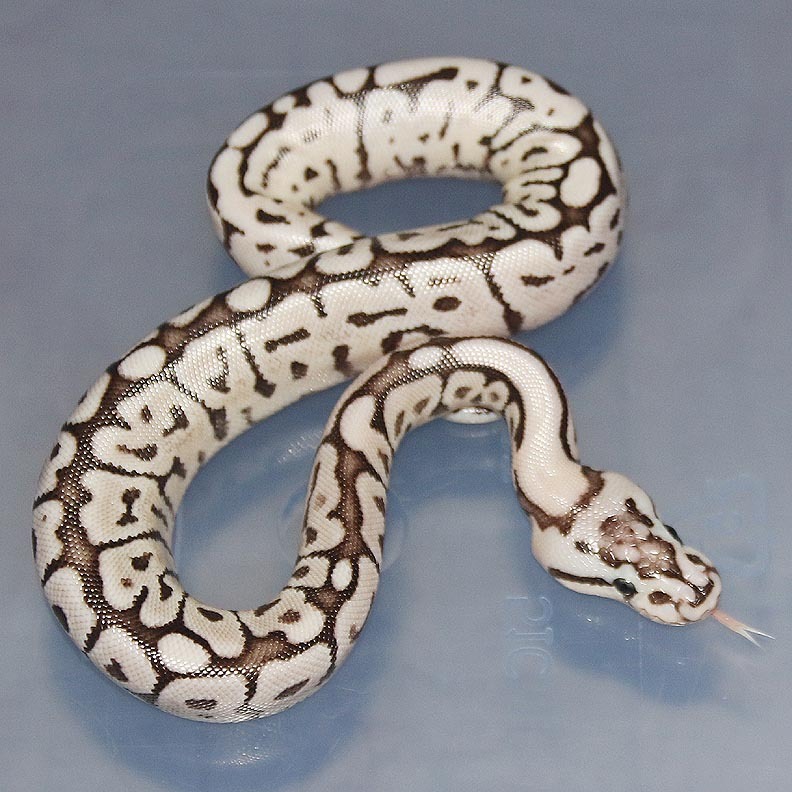 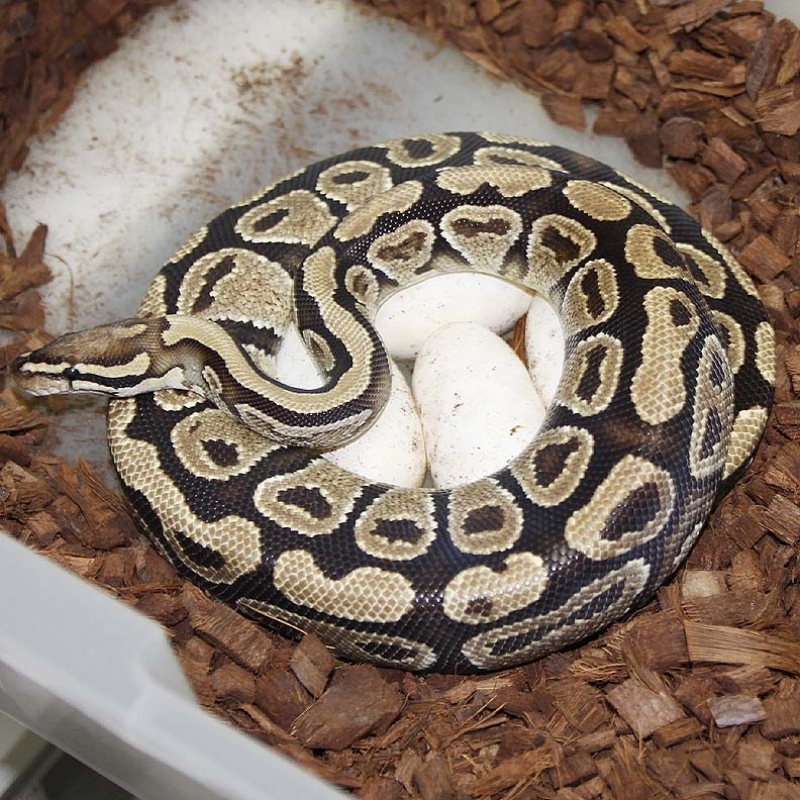 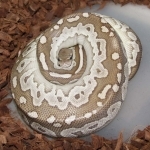 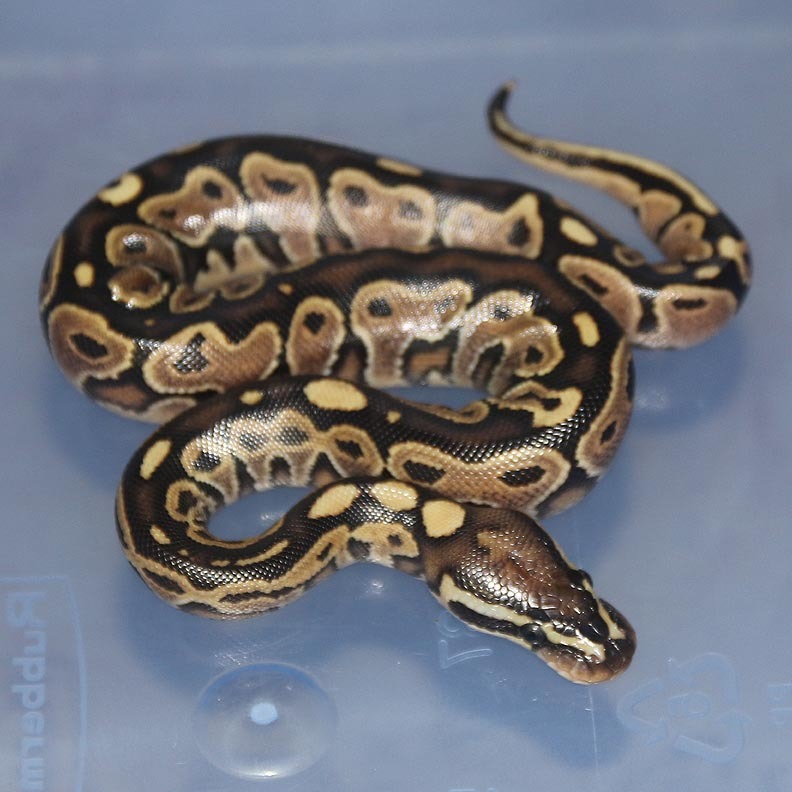 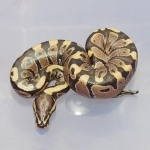 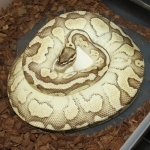 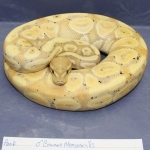 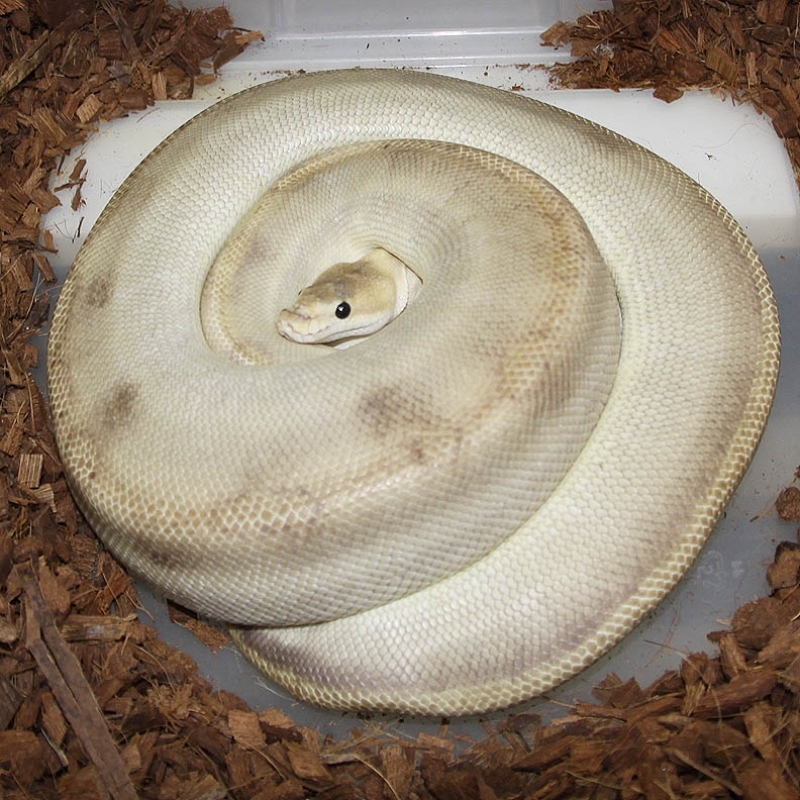 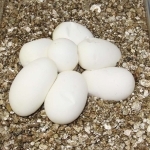 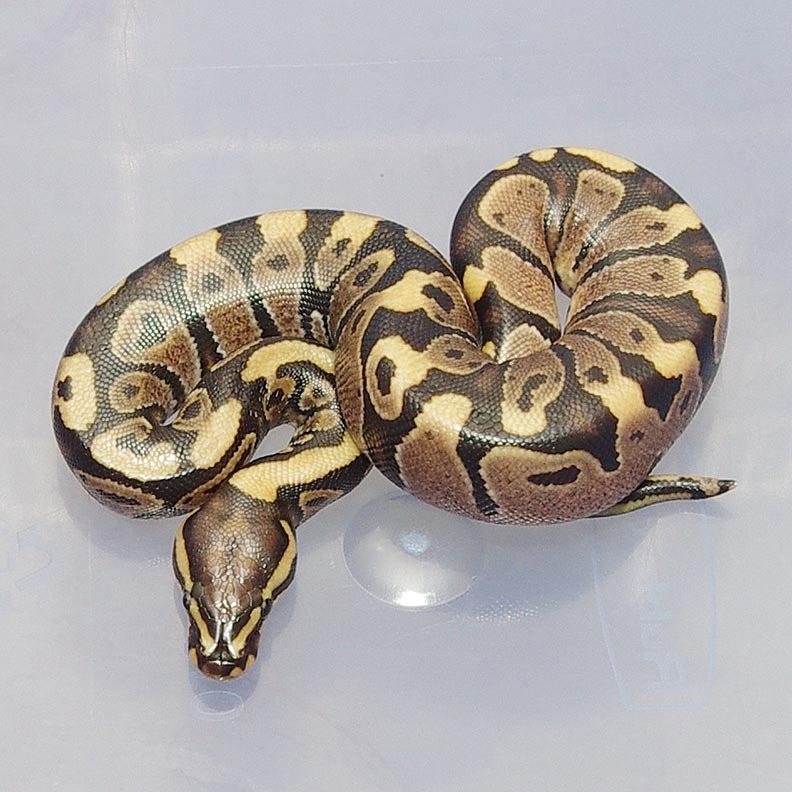 Description: Pastel Lesser YB Het Banded 1/13 x Champagne Het Banded 1/11. 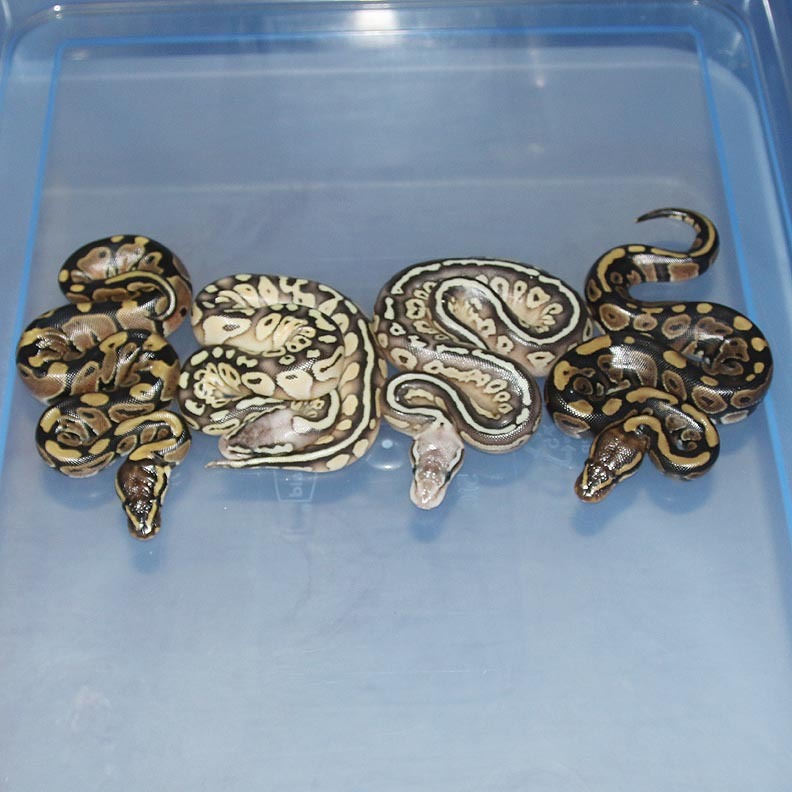 If you are interested in animals from clutch #97 please email or call 519-824-7377. 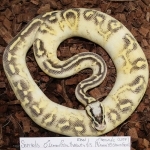 Description: Citrus Spark Het RA/OG 2/13 x Pastel YB HOG 6/11. 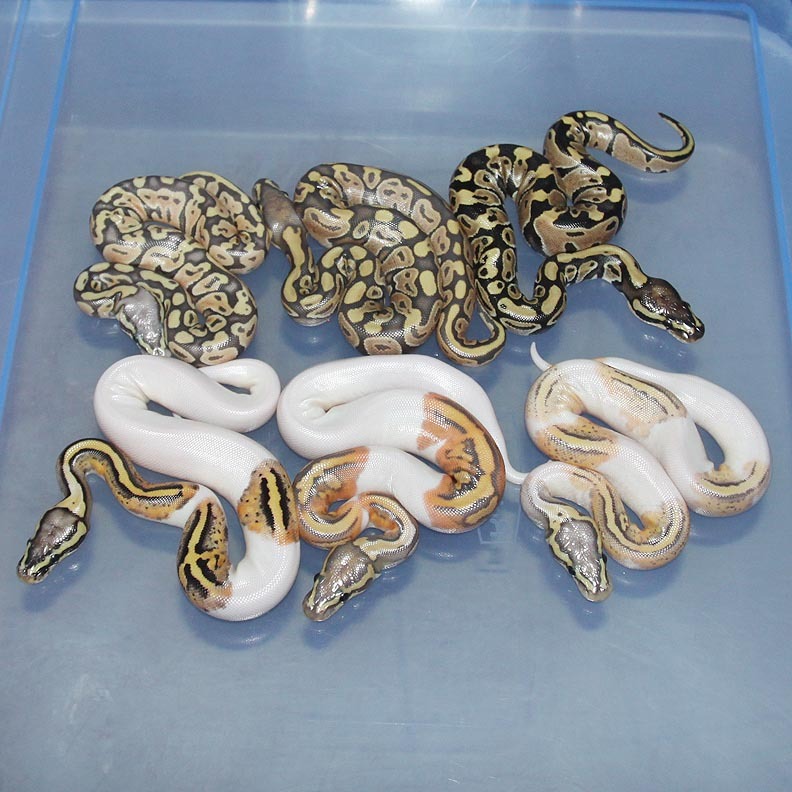 If you are interested in animals from clutch #98 please email or call 519-824-7377. 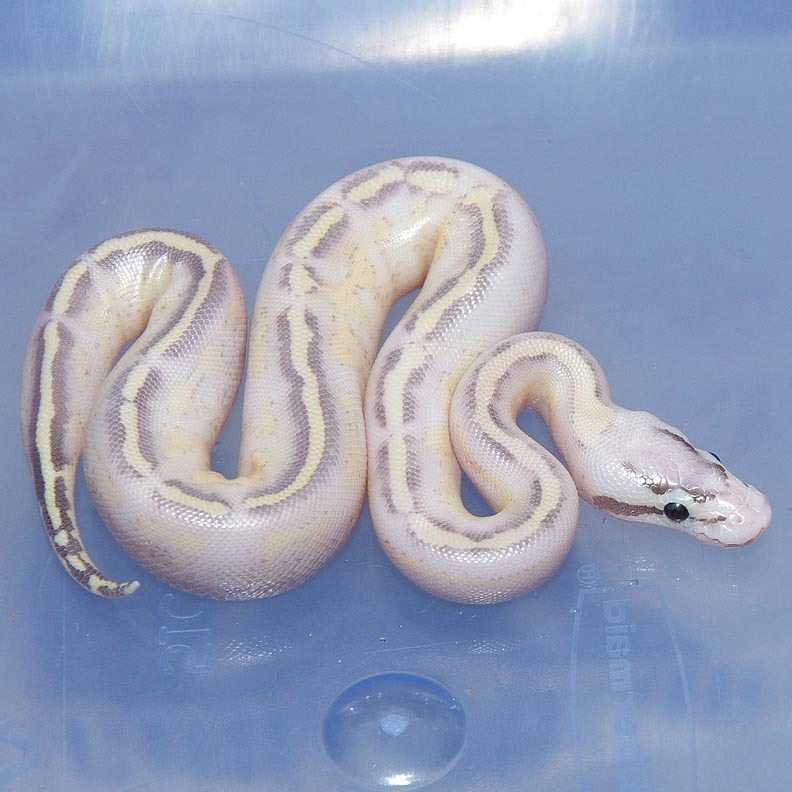 Description: Pastel Candy 1/12 x Genetic Stripe 1/06. 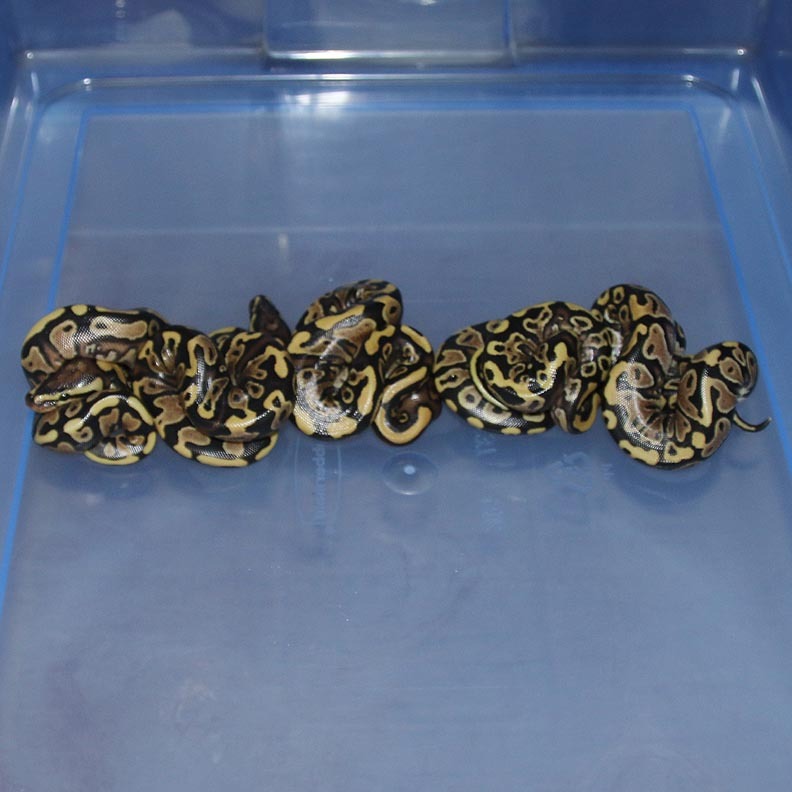 If you are interested in animals from clutch #99 please email or call 519-824-7377. Description: Lesser Ivory 3/12 x Super Pastel Caramel (Kinked) 1/09. 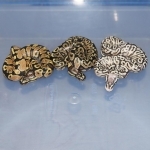 If you are interested in animals from clutch #100 please email or call 519-824-7377.